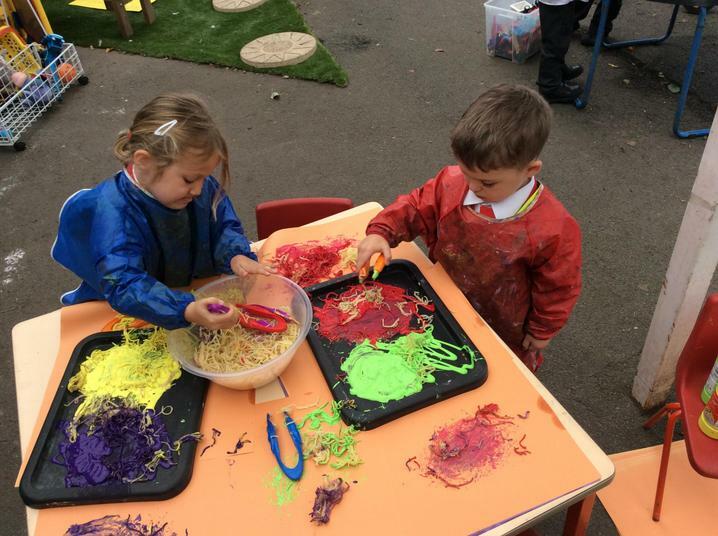 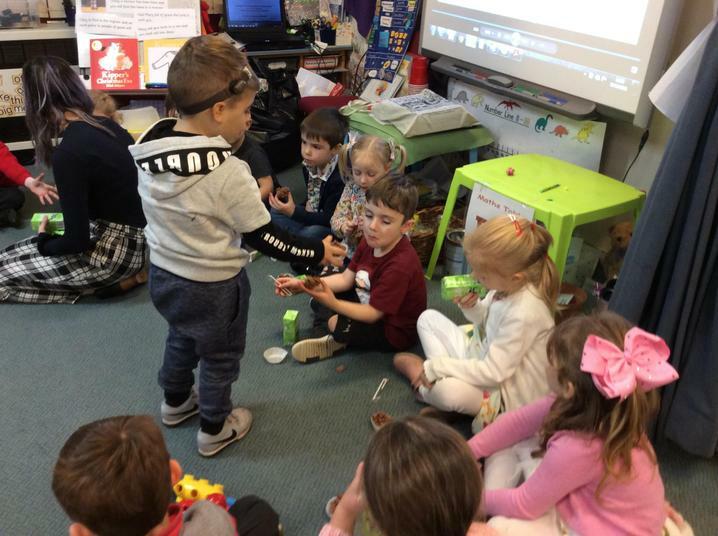 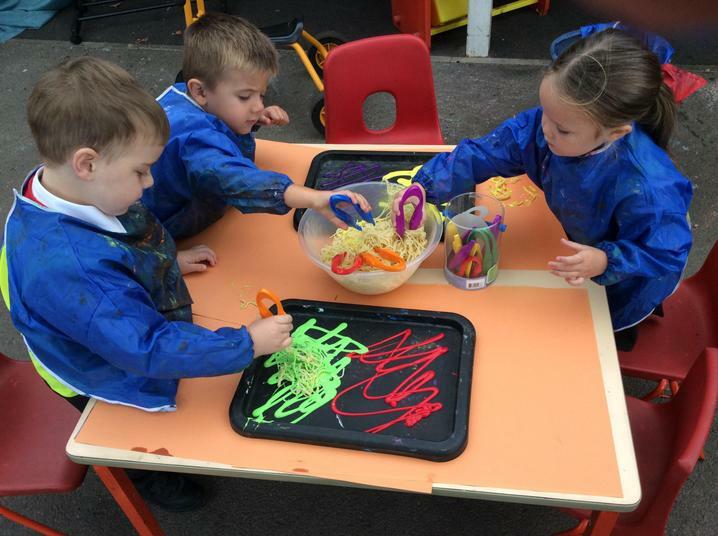 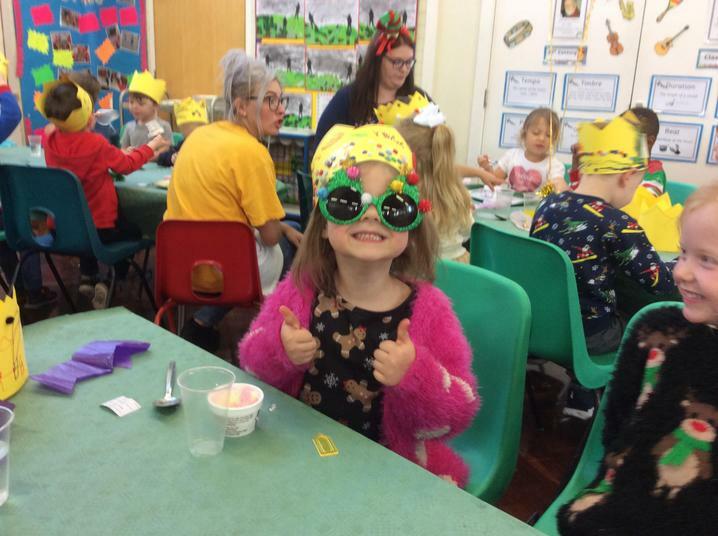 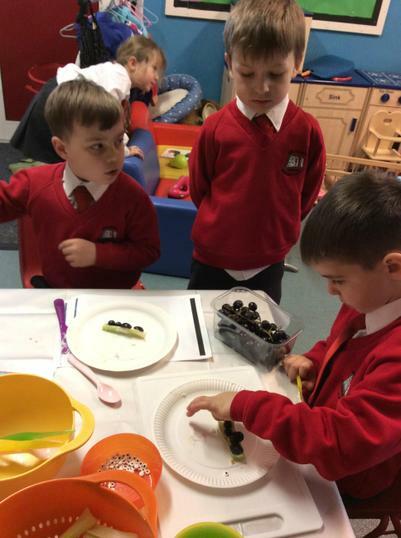 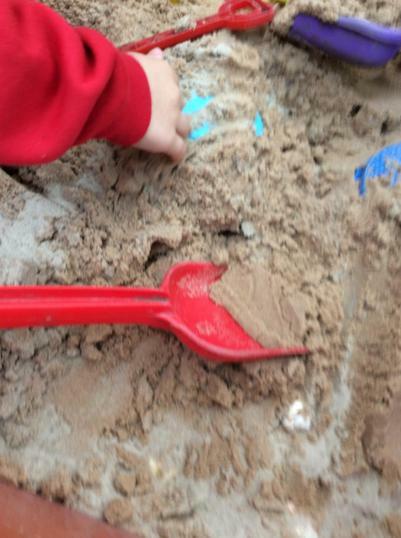 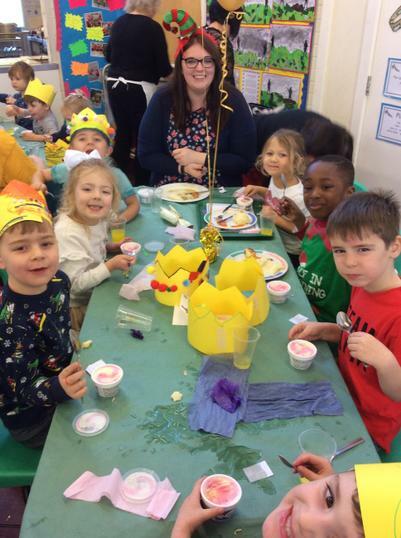 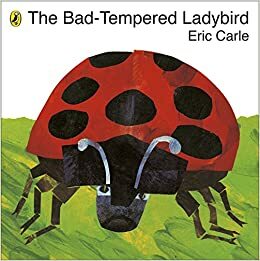 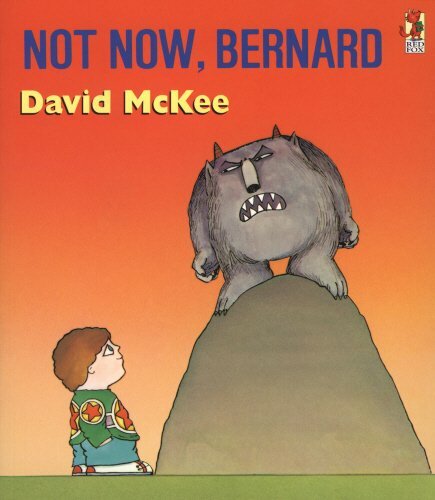 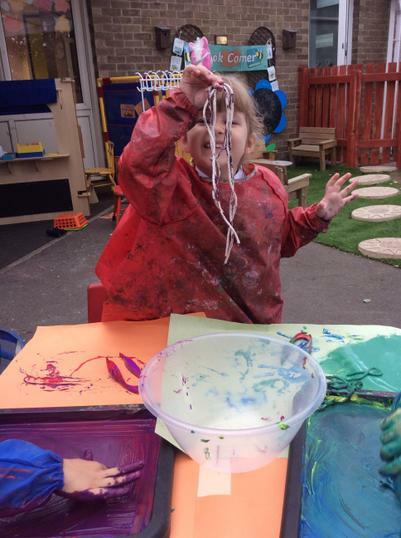 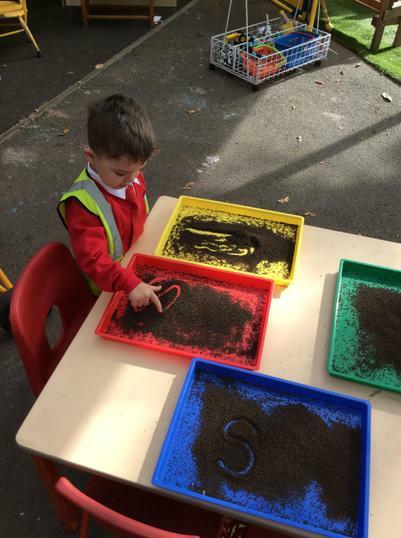 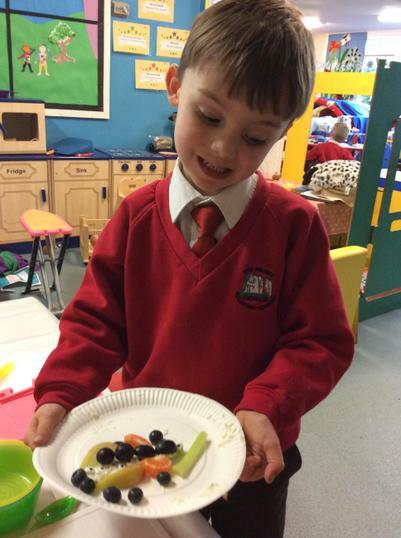 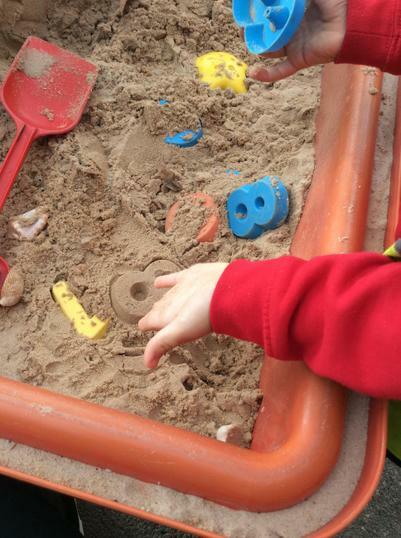 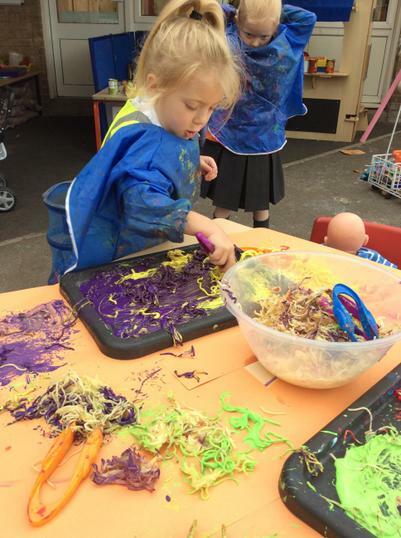 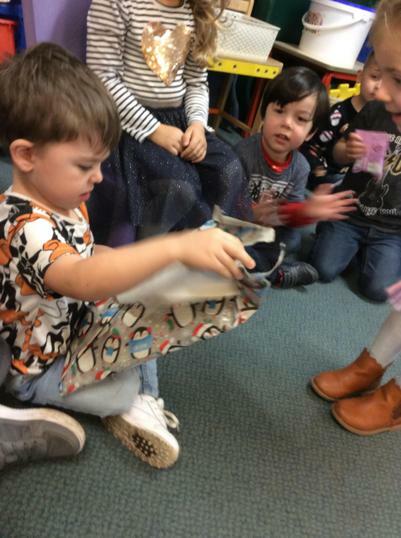 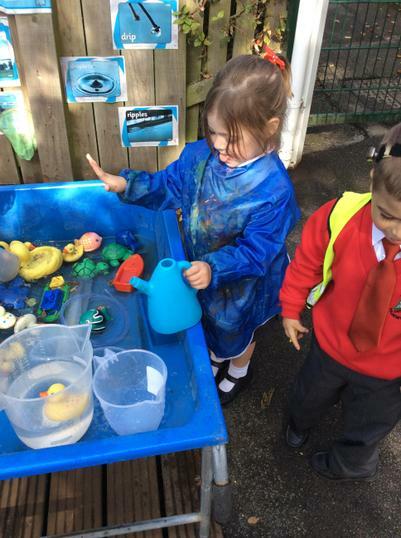 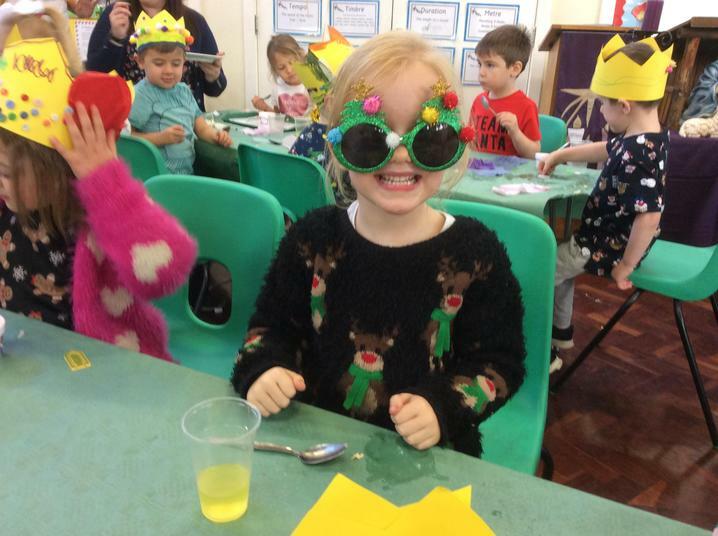 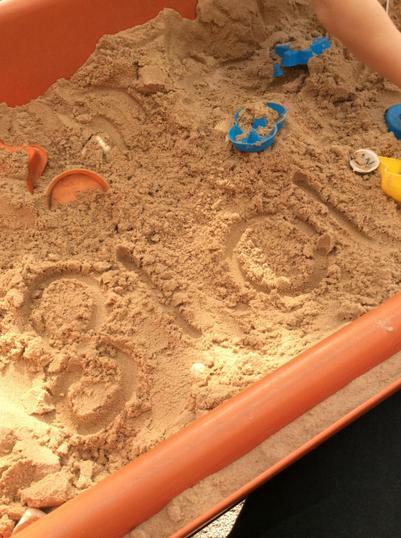 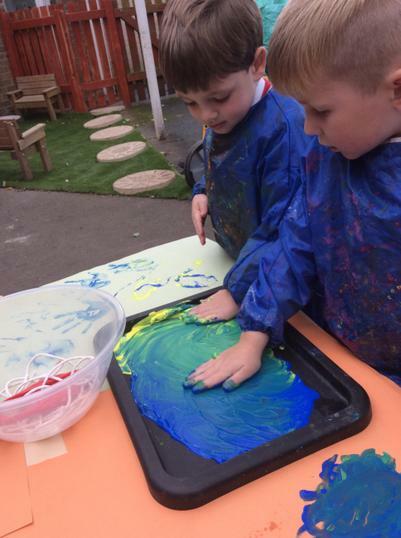 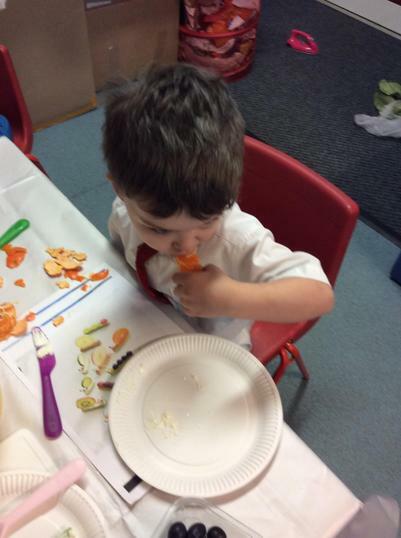 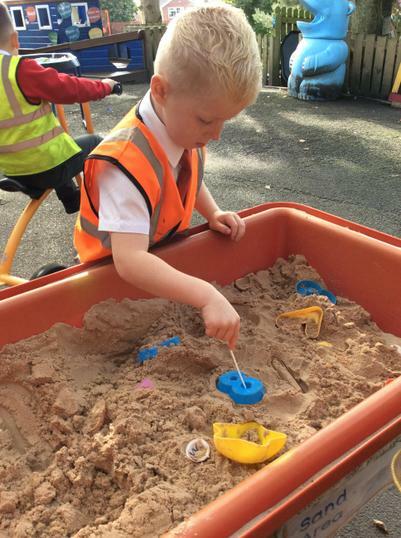 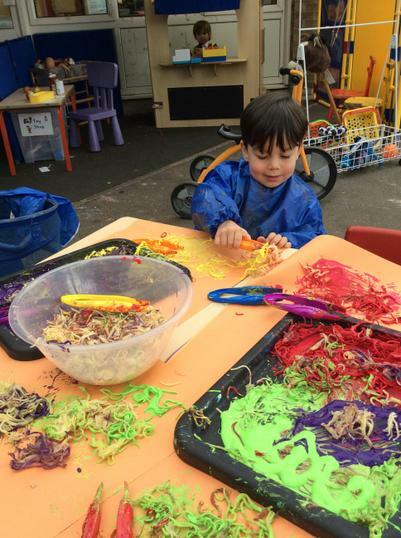 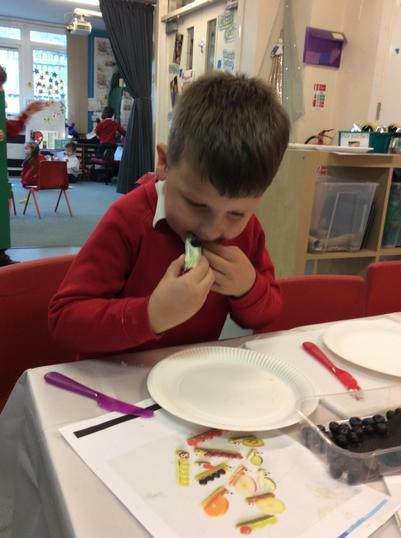 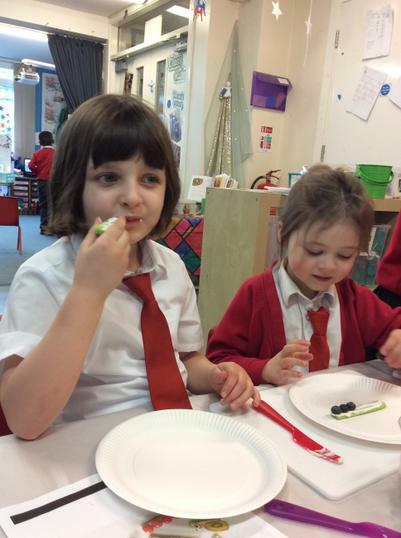 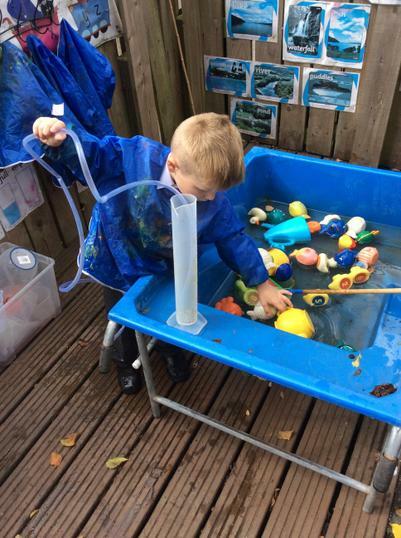 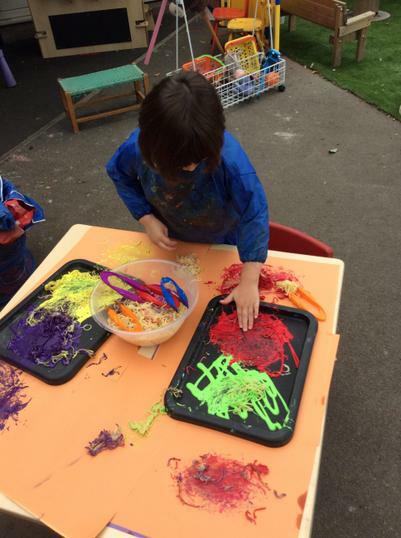 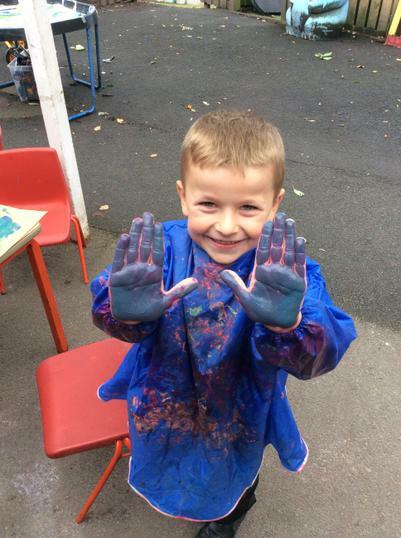 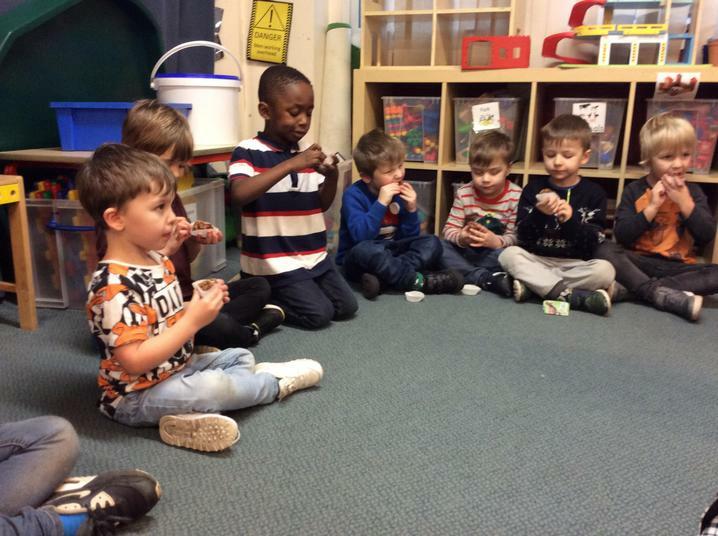 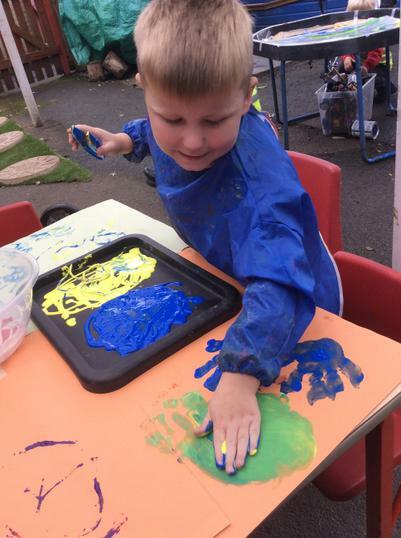 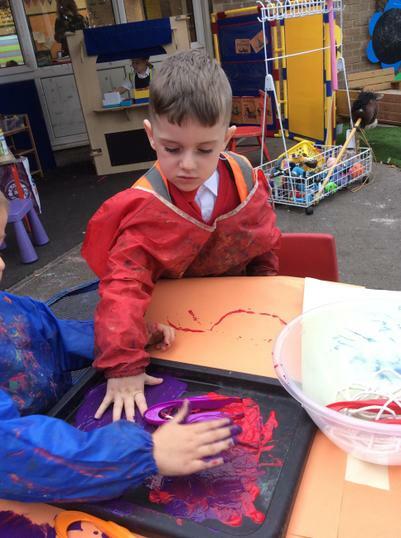 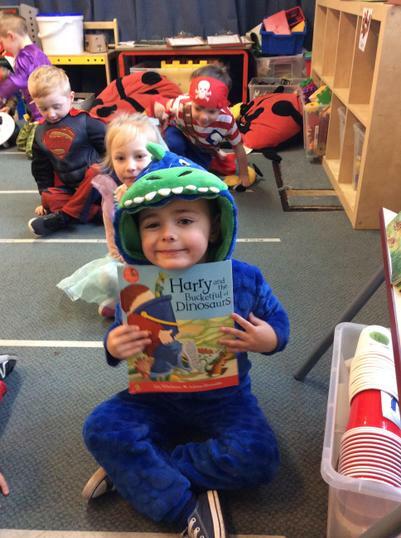 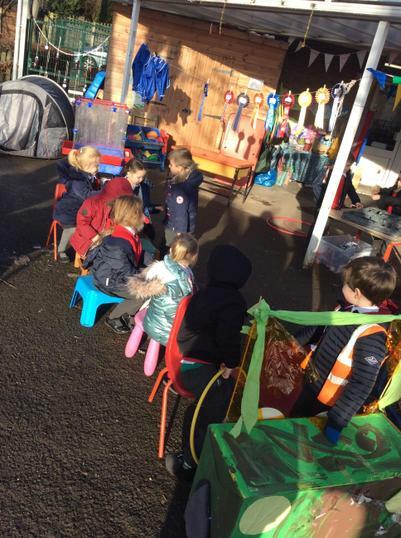 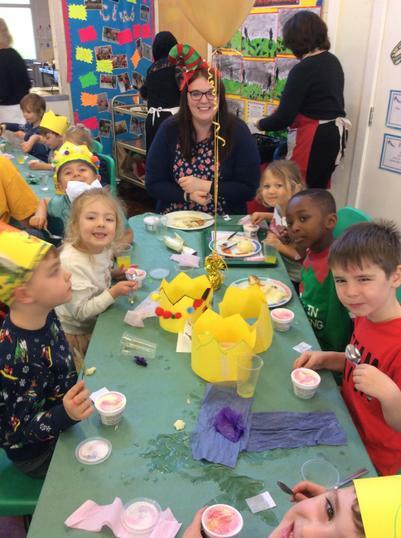 This term we will be exploring mini-beast and monster stories such as: The Very Hungry Caterpillar, The Bad-Tempered Ladybird, The Gruffalo, Not Now Bernard and Harry's Bucket full of Dinosaurs. 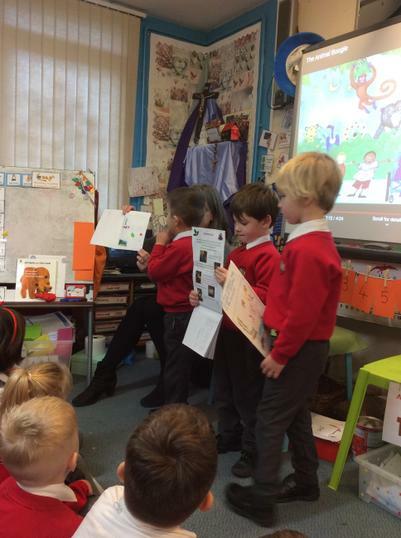 non-fiction books to learn about mini-beasts and going on bug hunts. 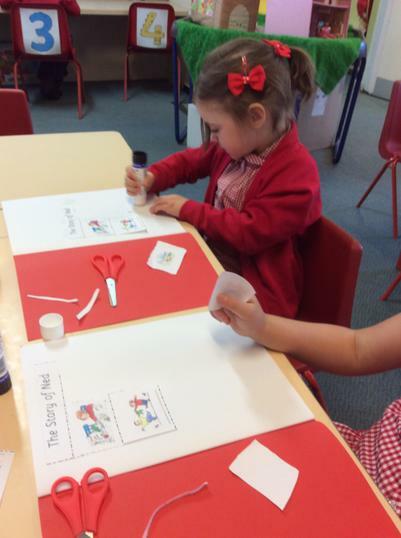 We will be exploring more stories by Eric Carle and Julia Donaldson. 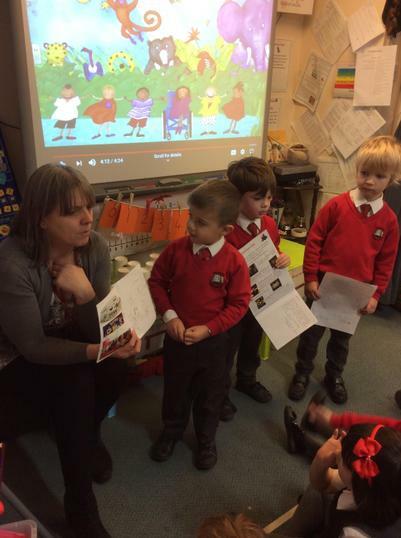 See our newsletter for more 'topic information'. 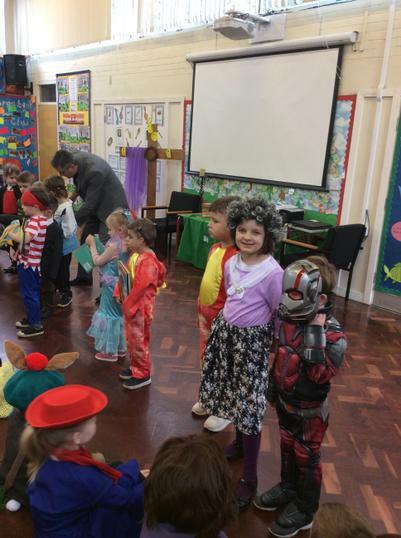 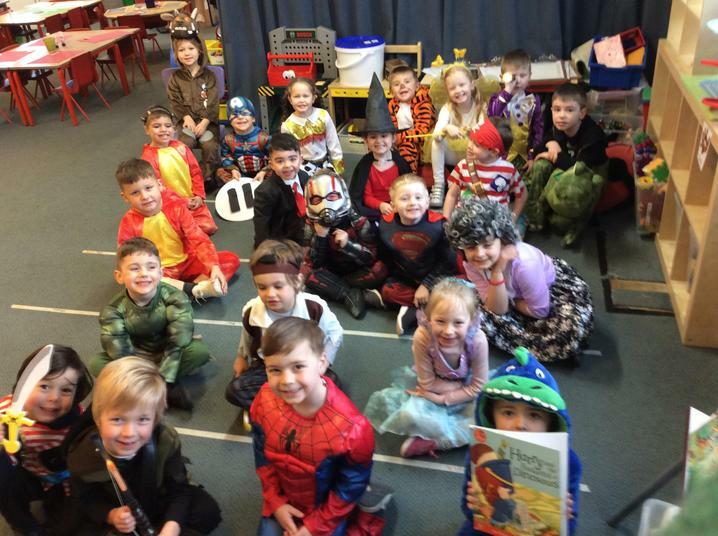 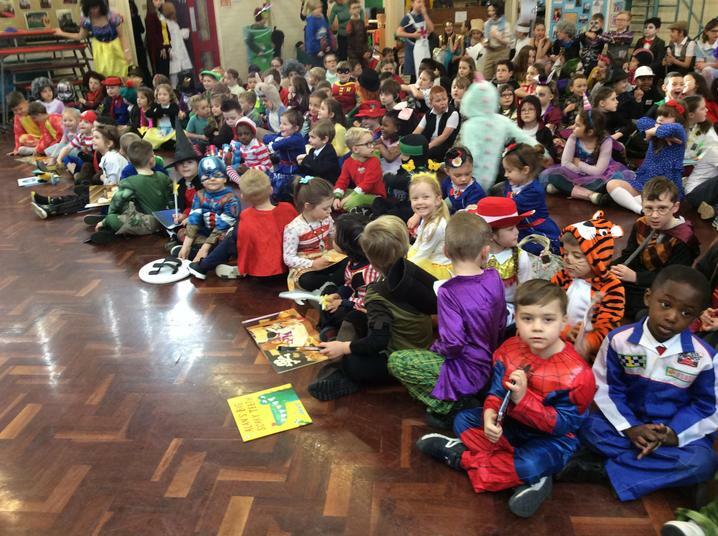 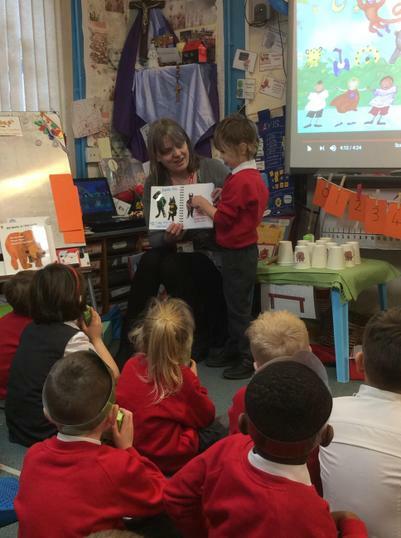 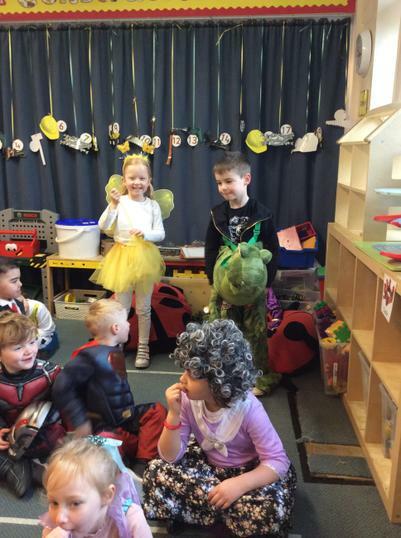 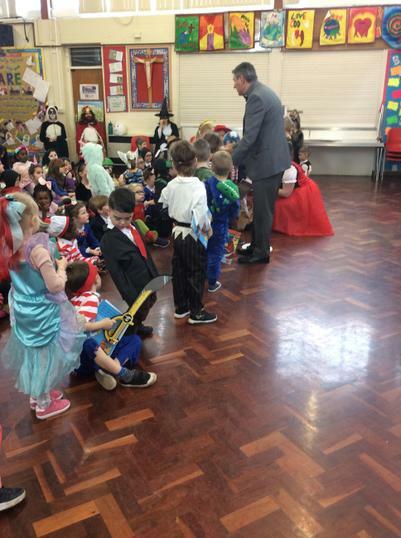 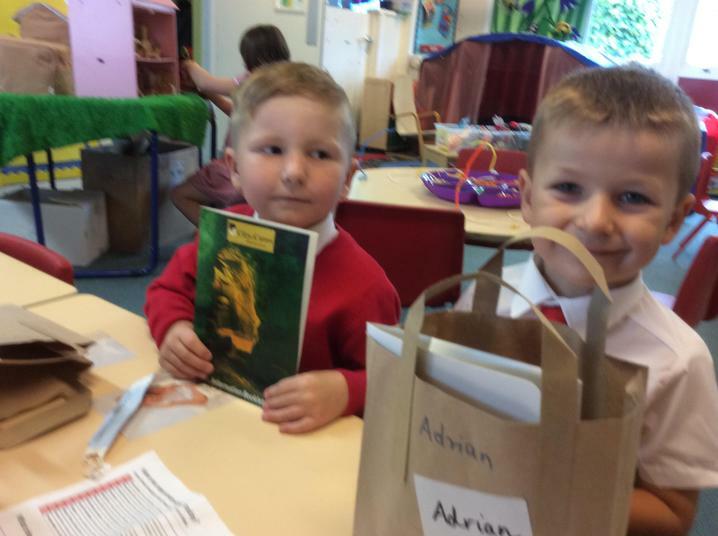 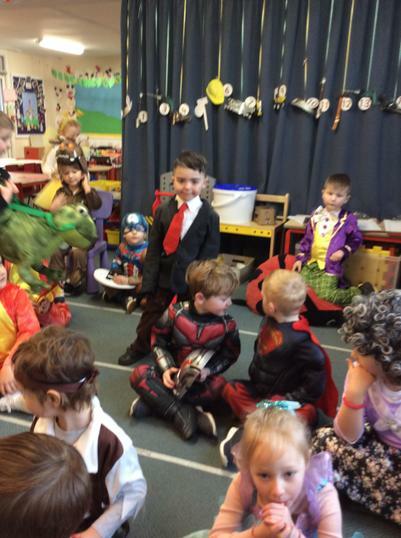 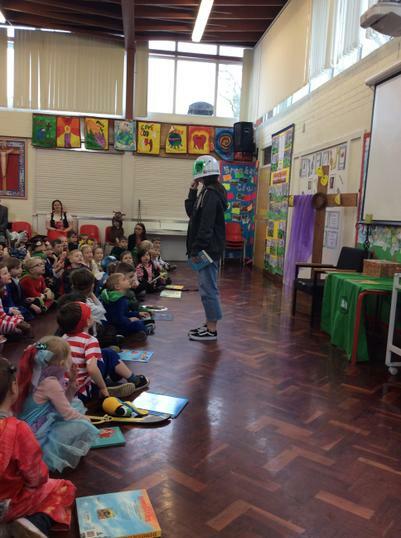 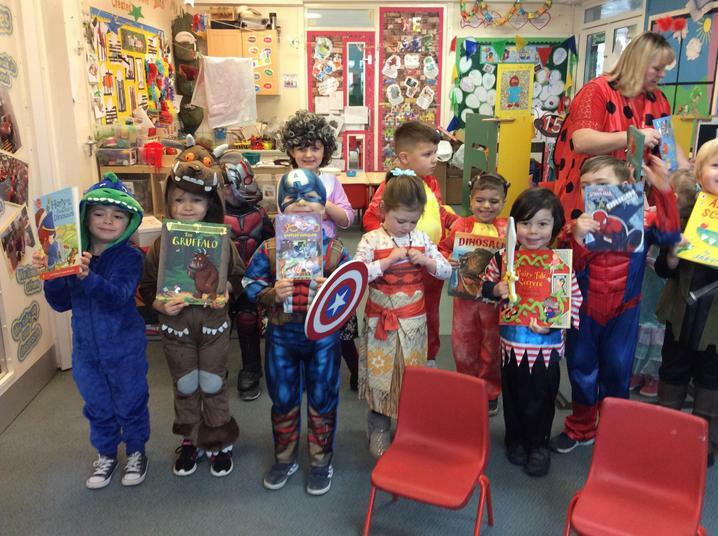 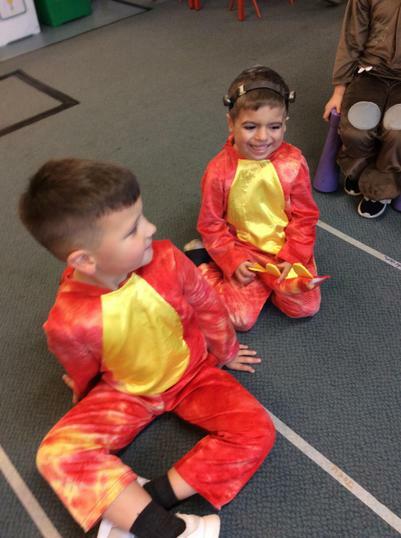 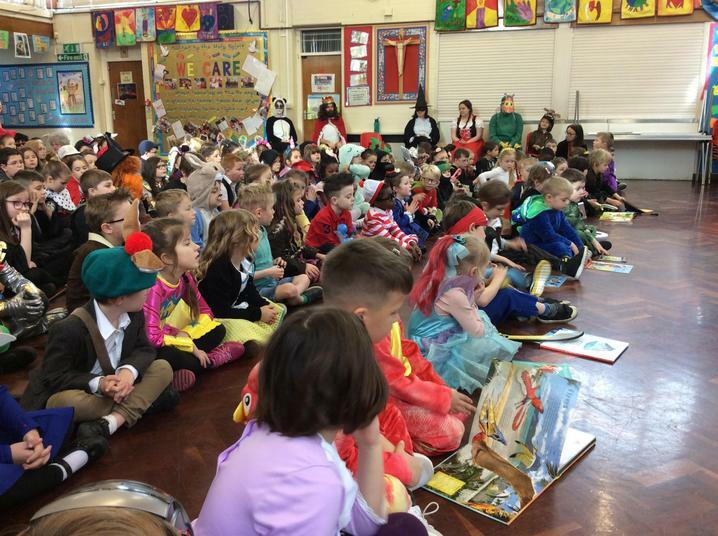 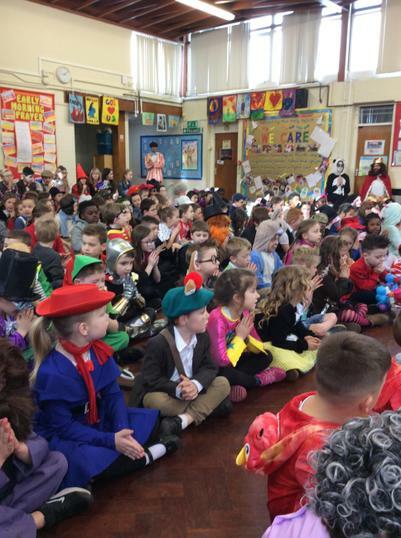 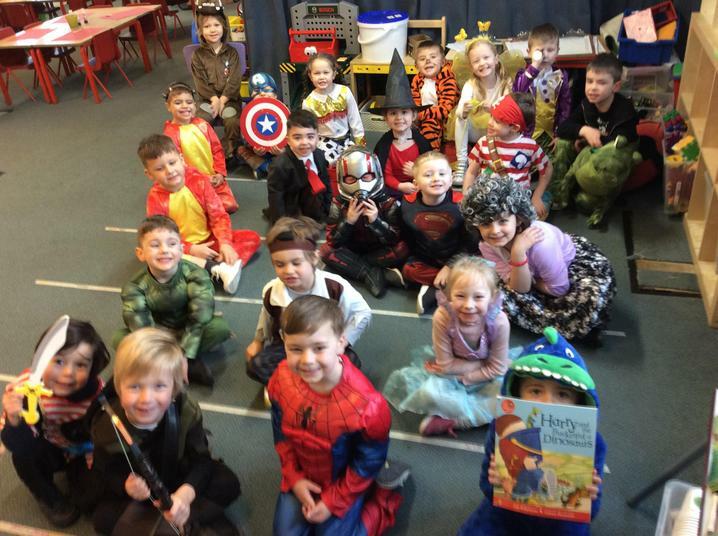 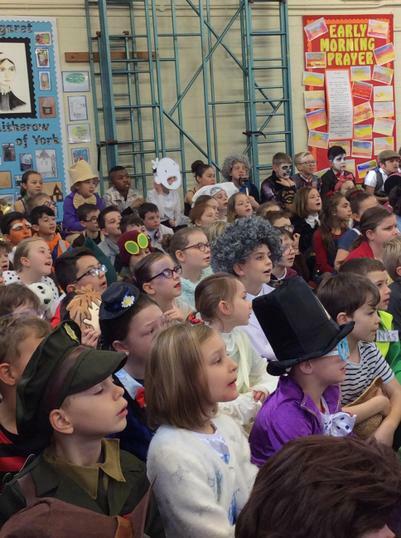 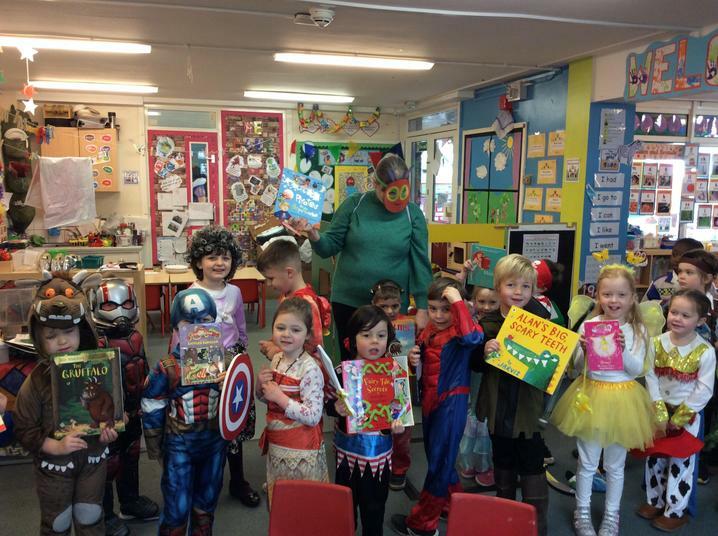 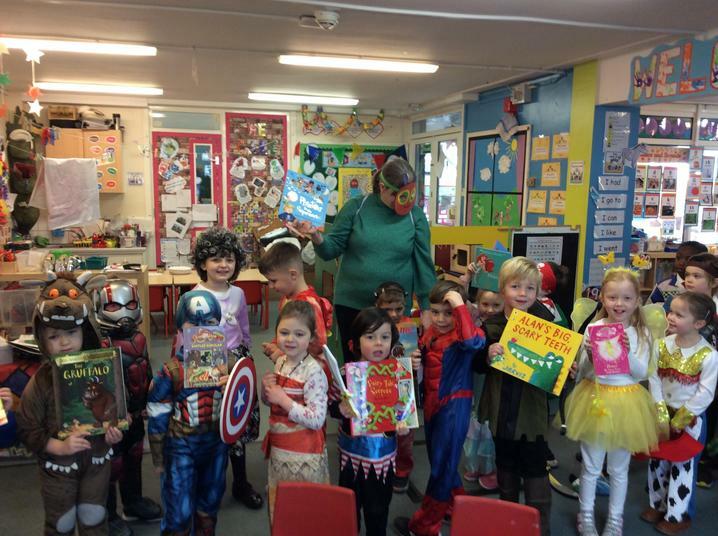 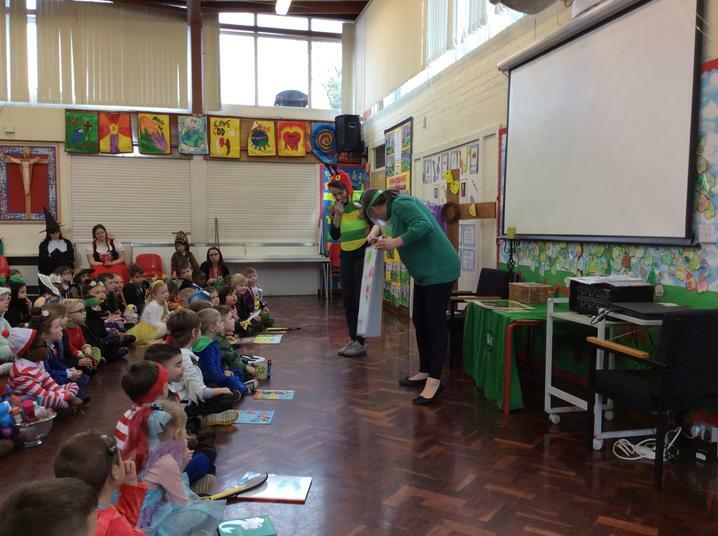 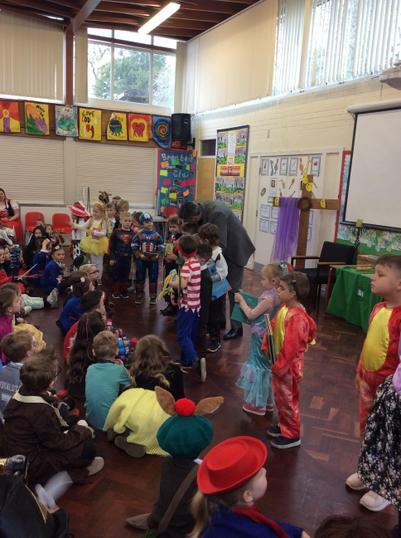 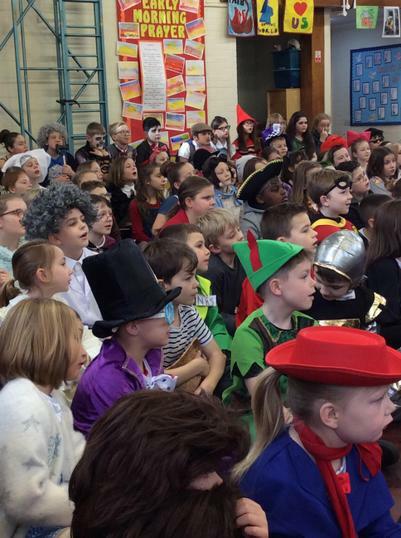 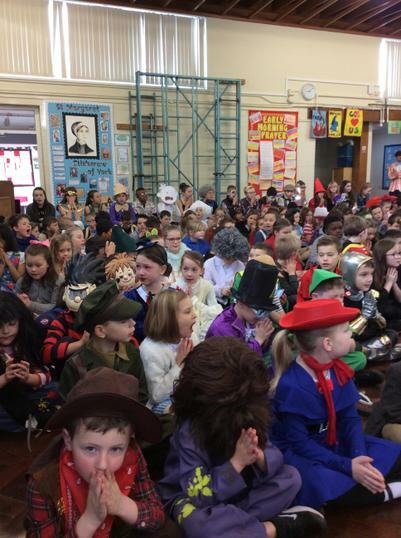 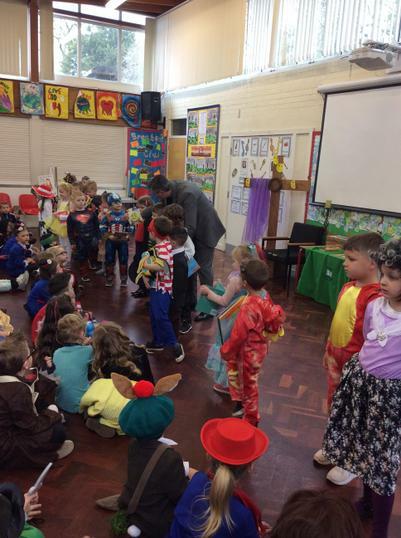 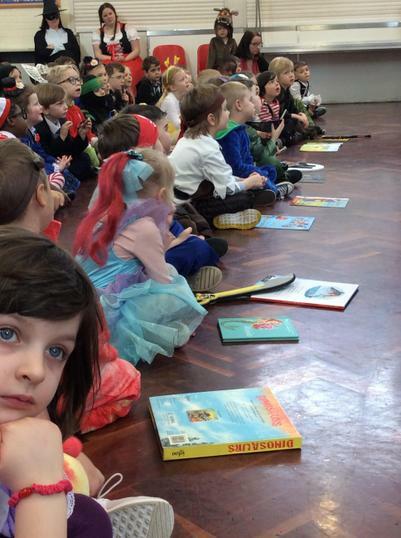 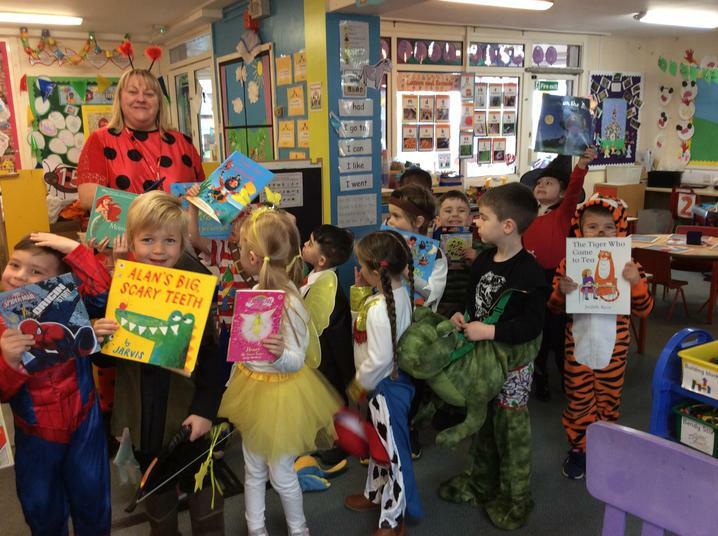 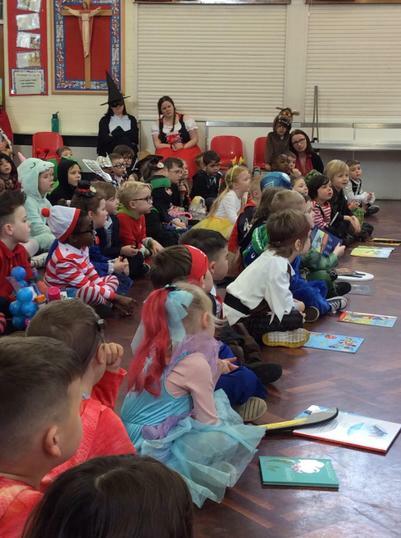 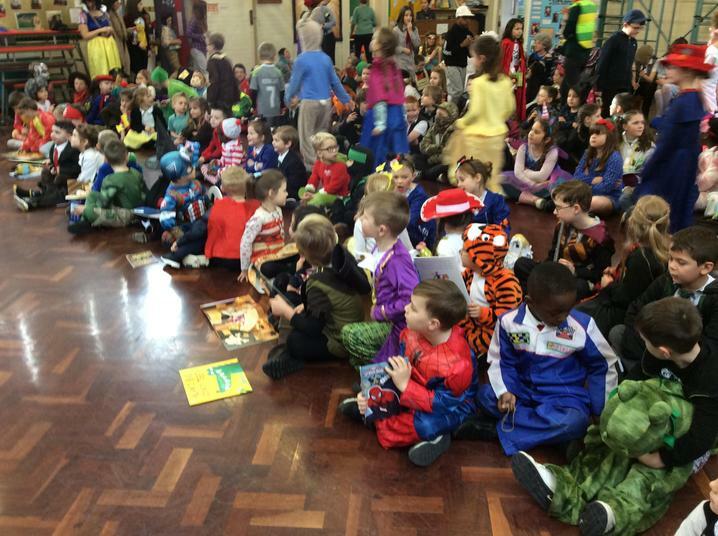 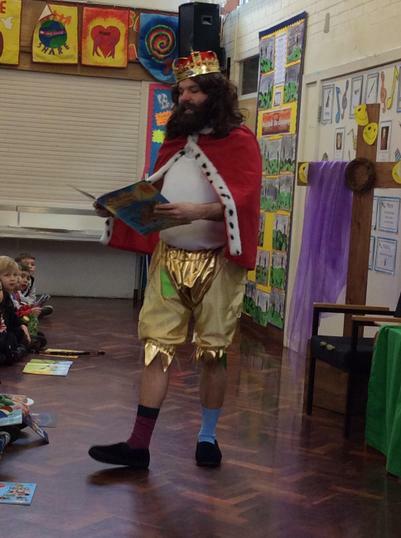 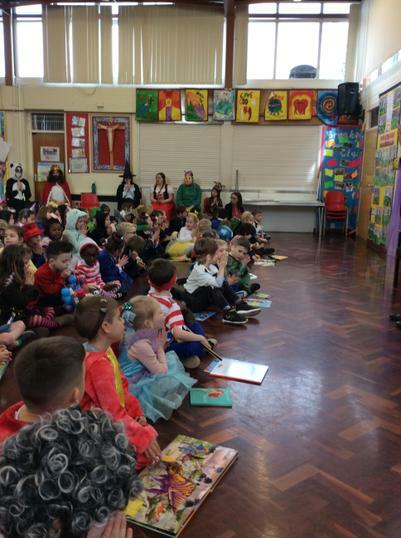 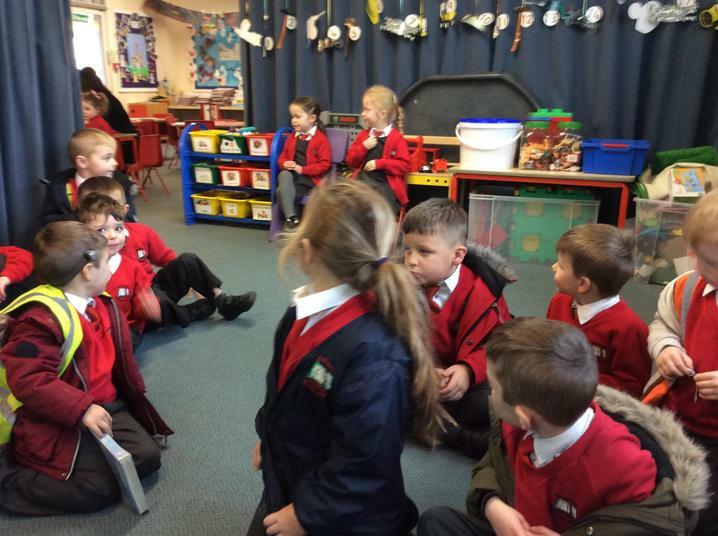 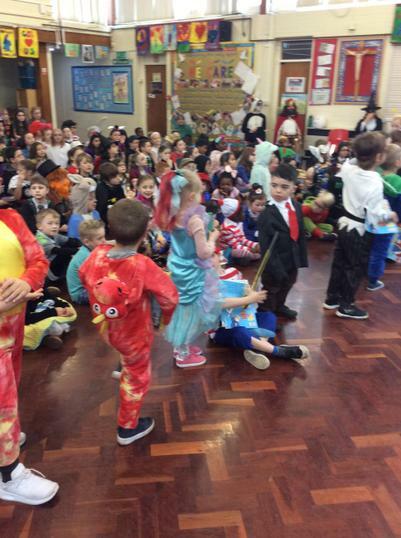 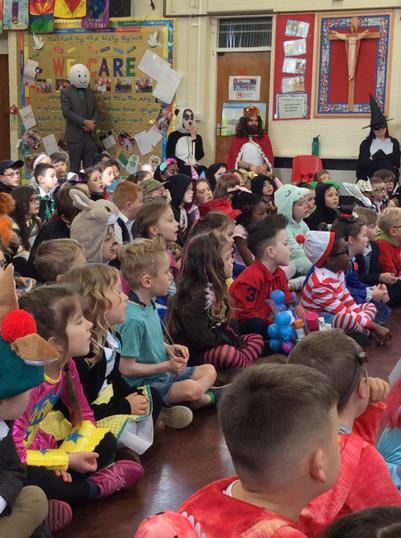 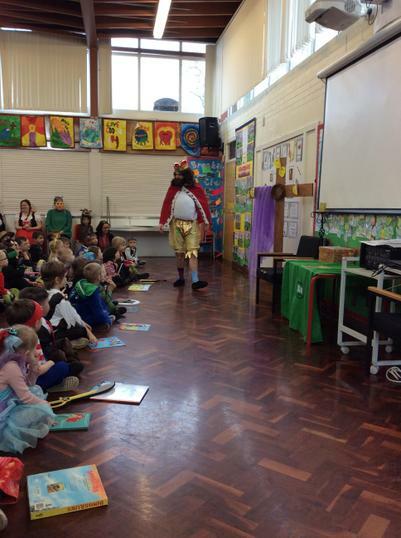 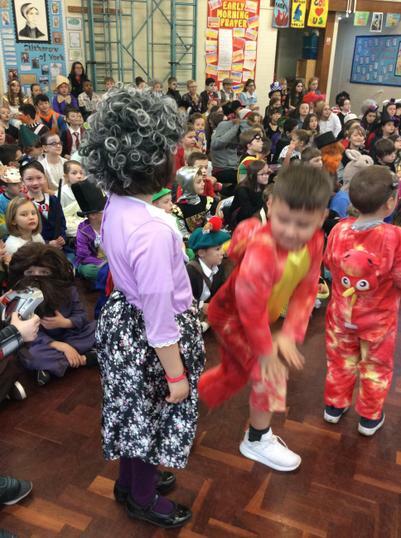 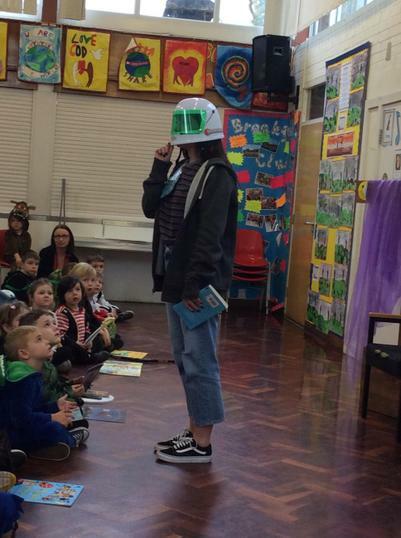 World Book Week Fun - sharing lots of lovely stories. 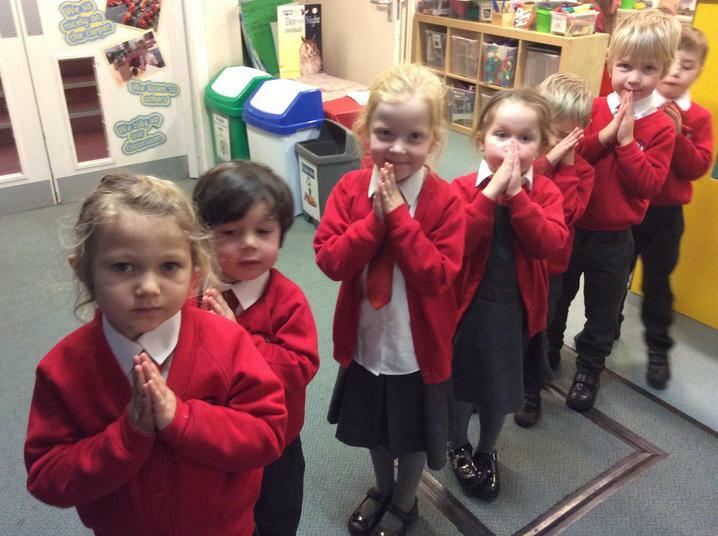 'Dear God, I will follow your light.' 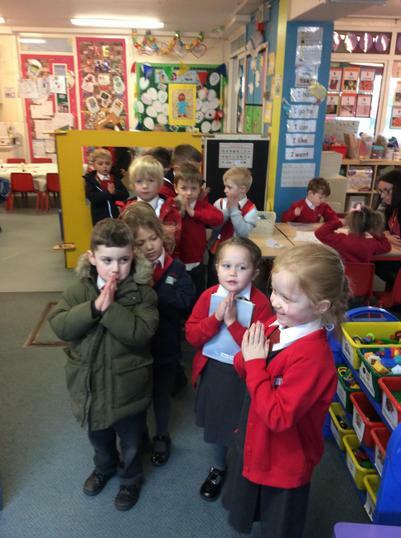 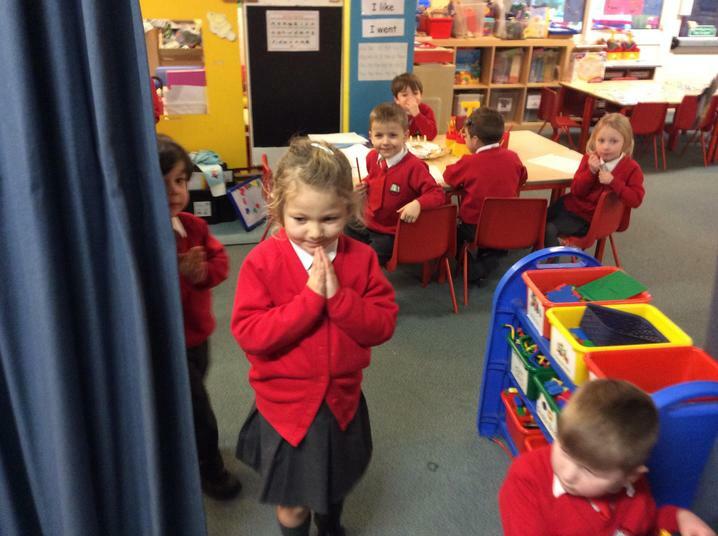 A prayer from a Knock pupil. 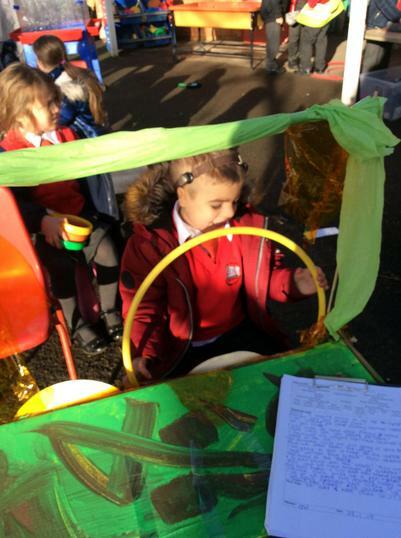 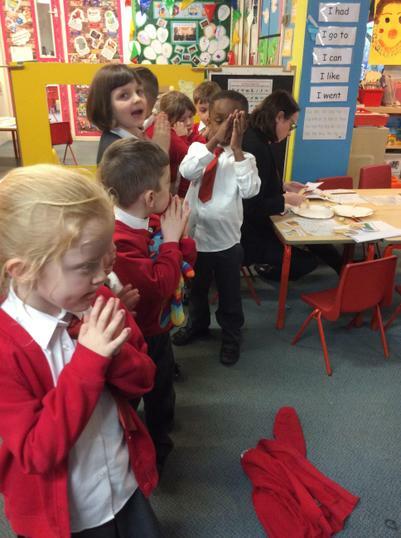 Our special prayer table - writing to God. 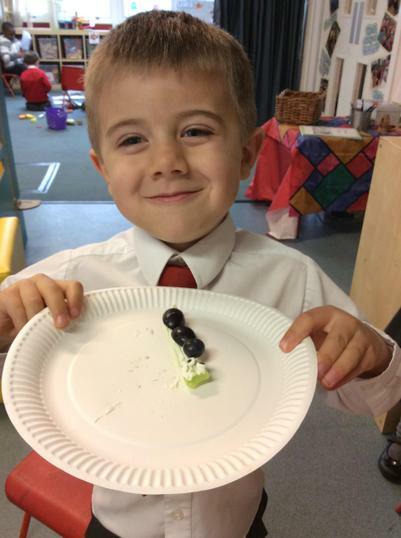 Hungry caterpillar models photographed by the pupils themselves - what a lot of ugly bugs! 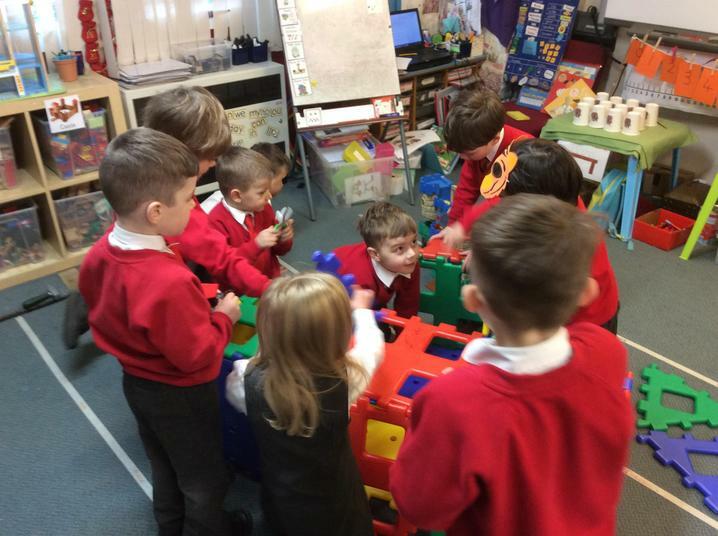 Our Mini-beast laboratory - let's investigate. 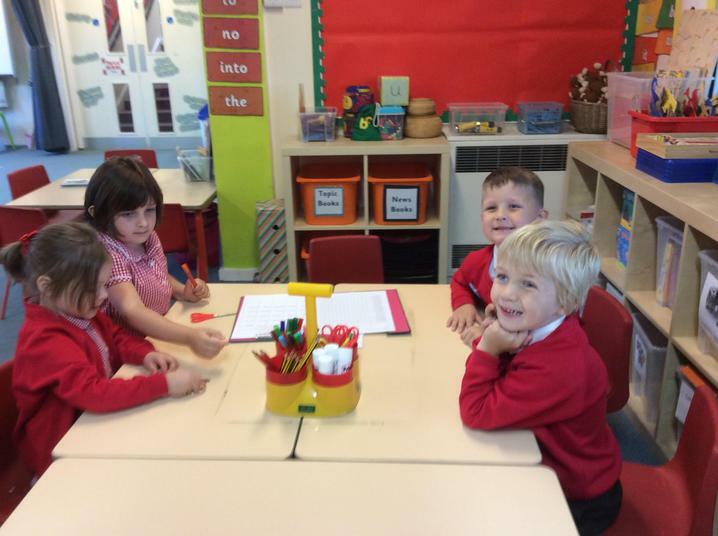 Learning how we are better working together! 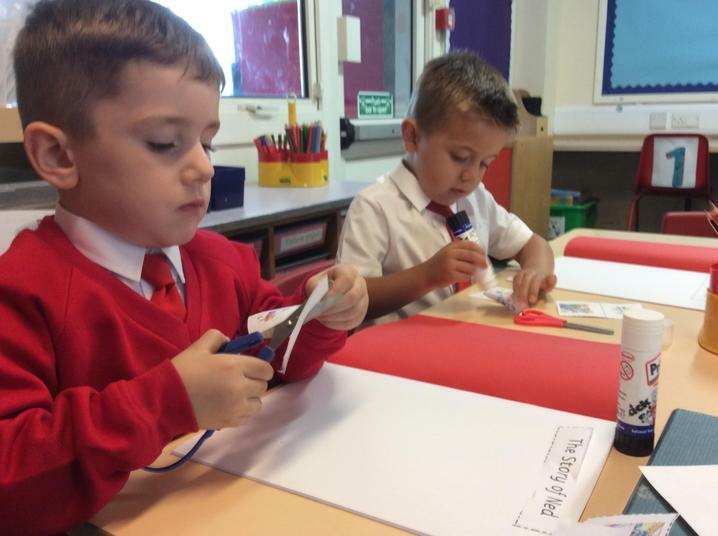 We made pens for the farm. 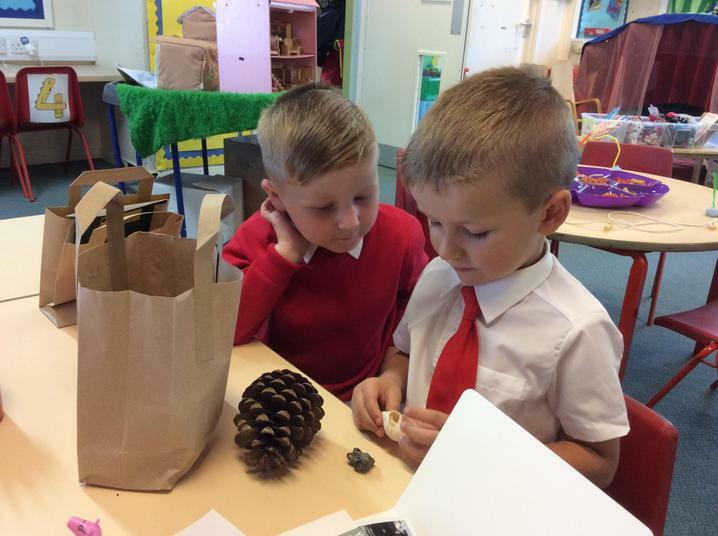 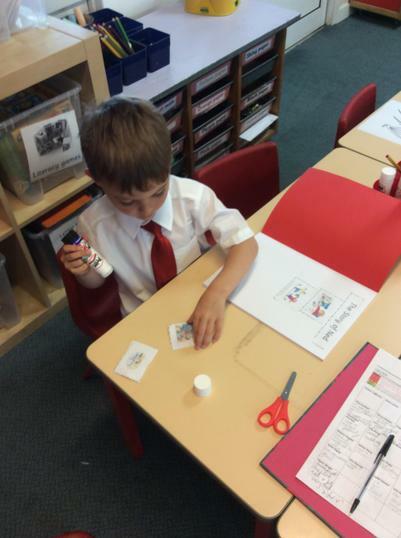 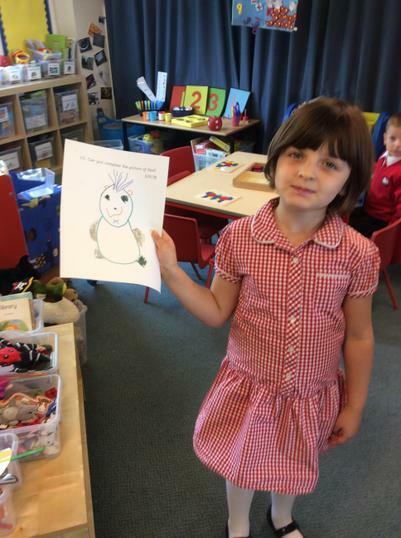 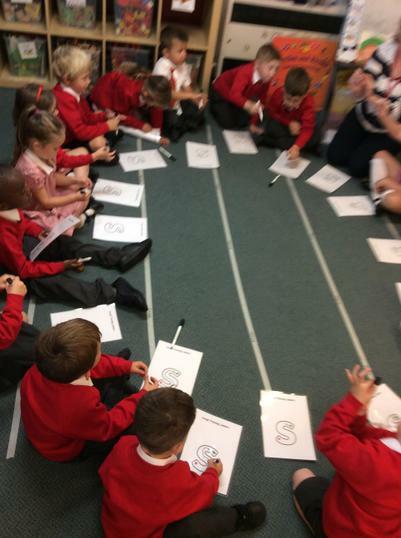 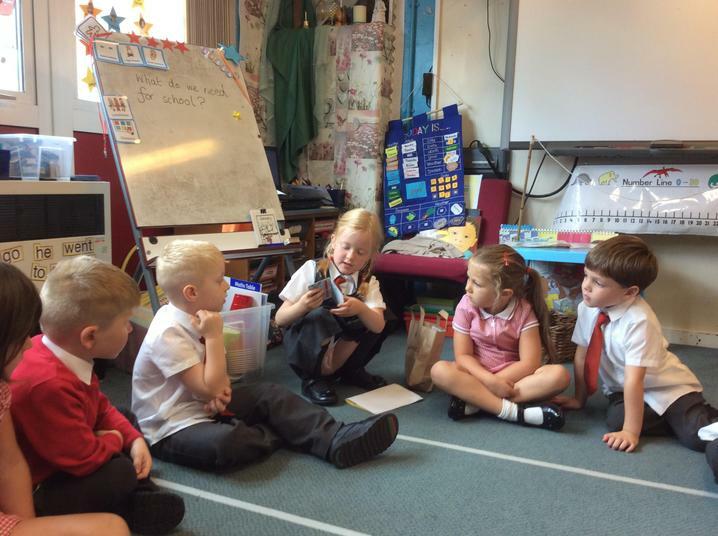 Matching maths stories to animal pictures. 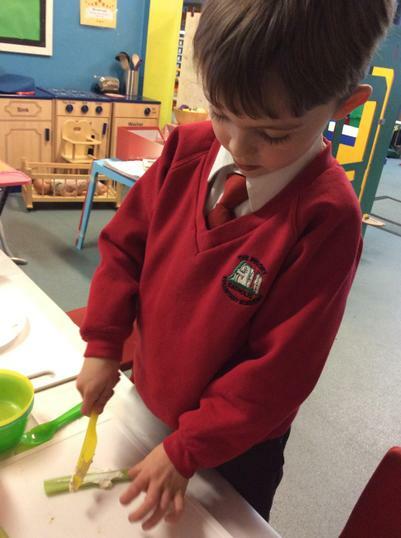 How many ways can you make 6 eggs? 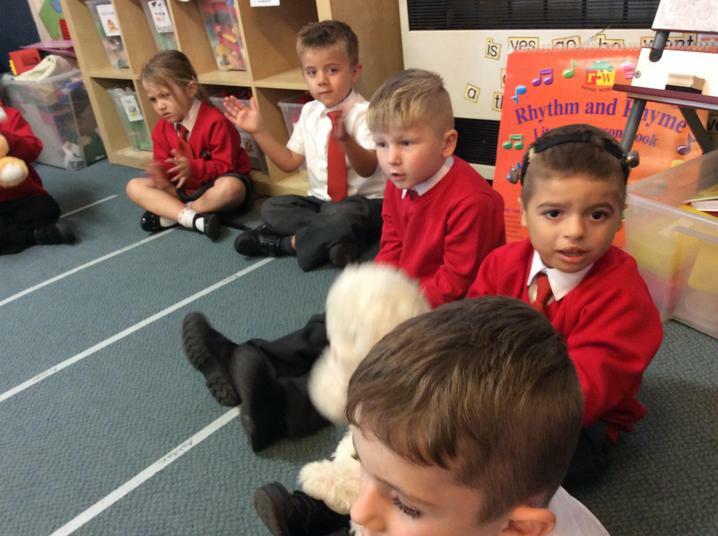 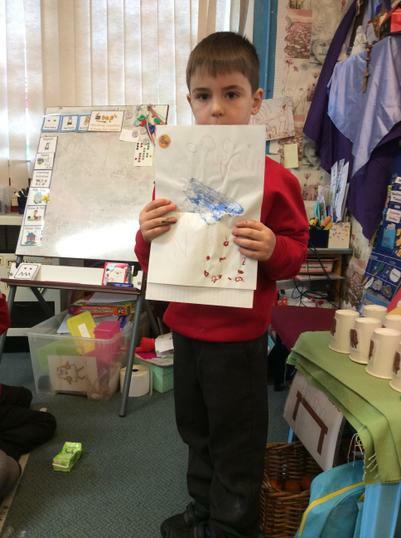 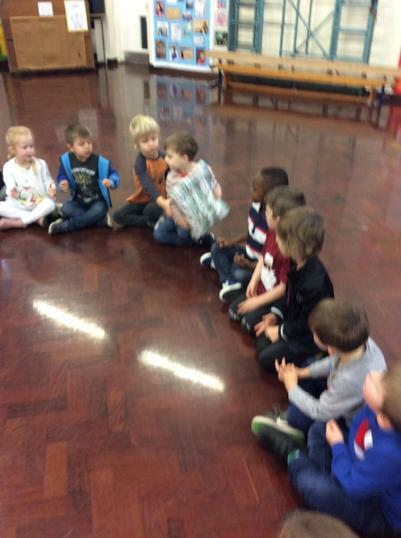 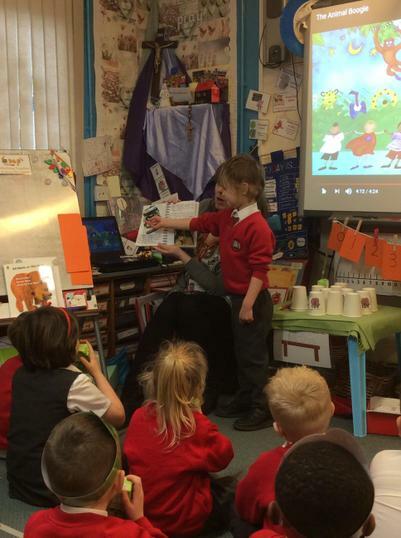 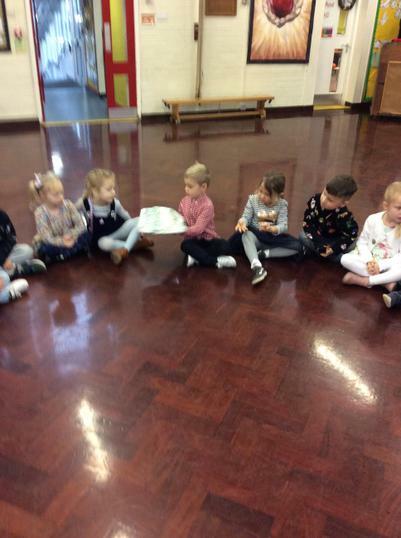 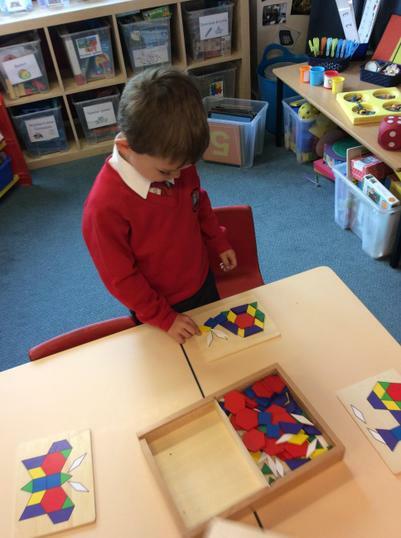 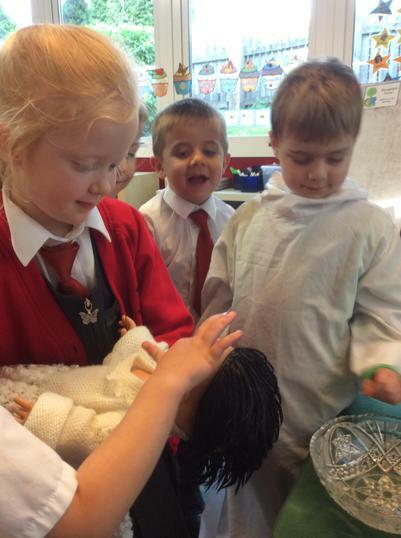 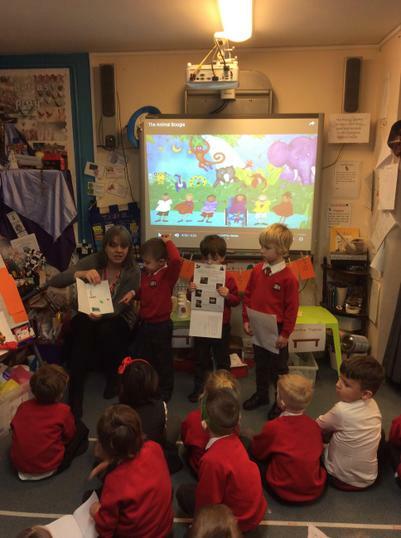 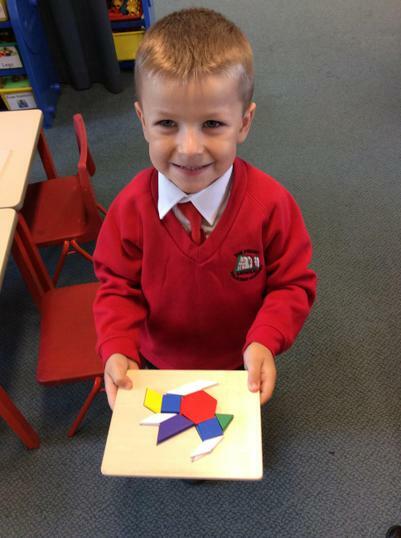 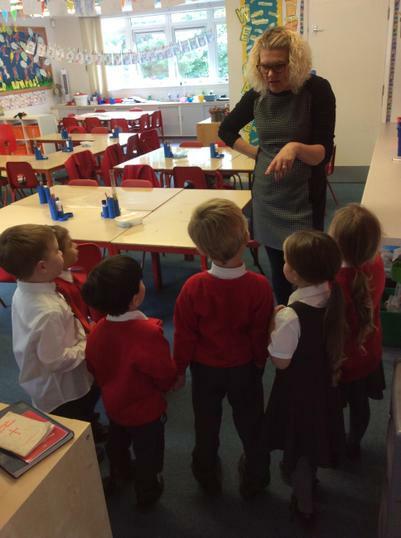 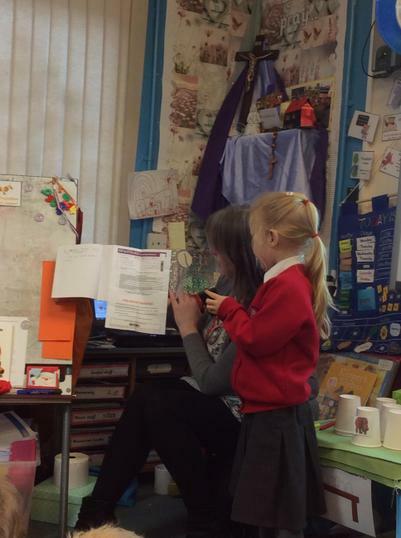 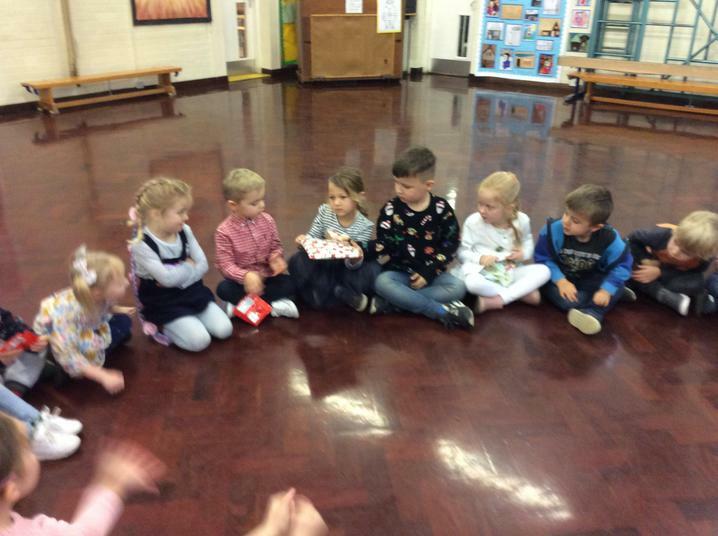 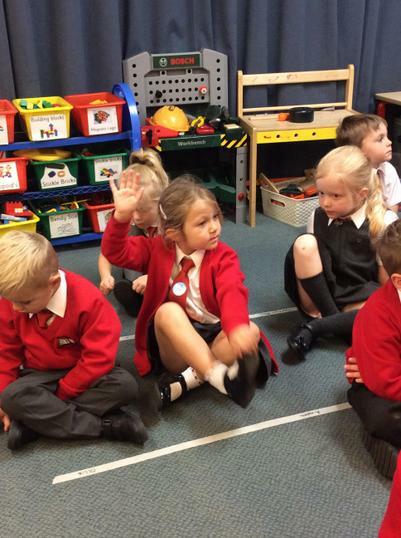 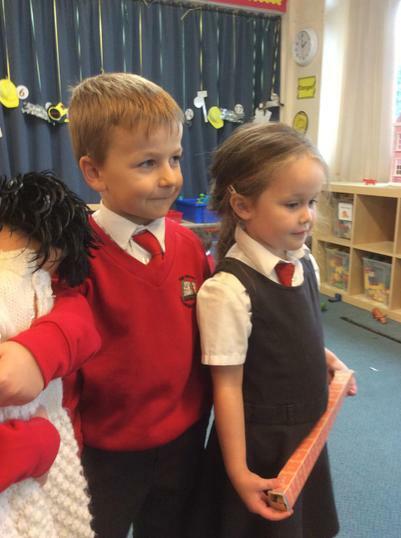 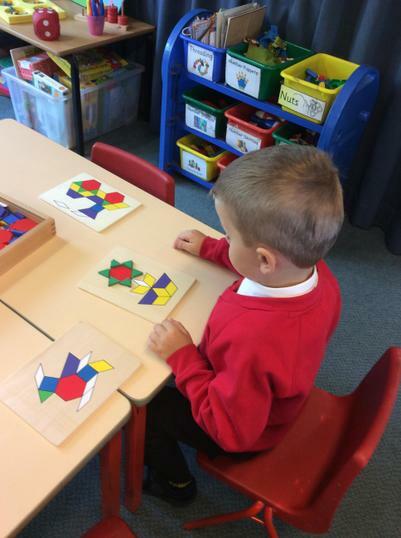 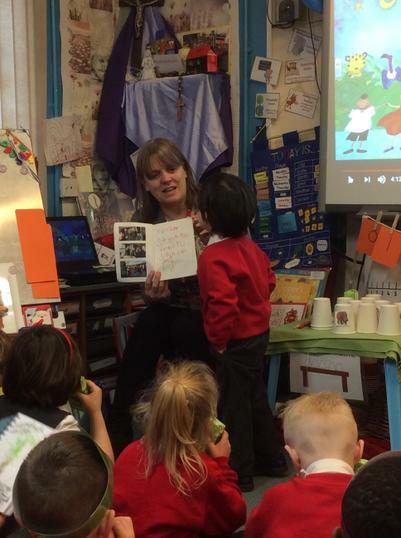 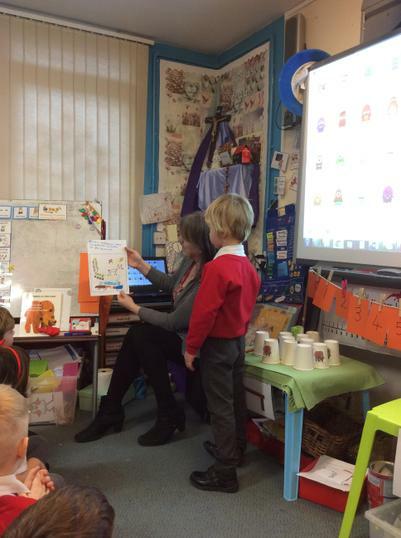 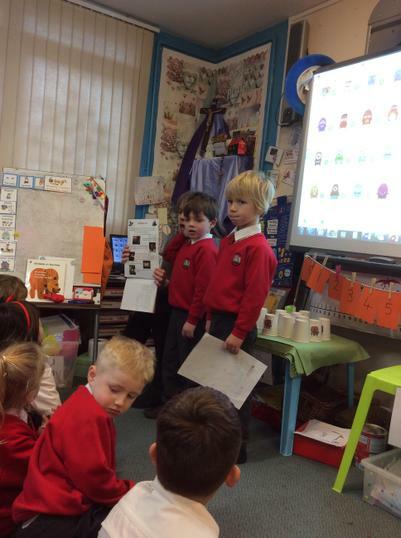 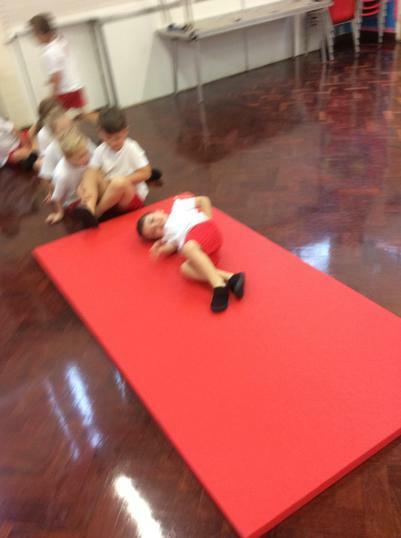 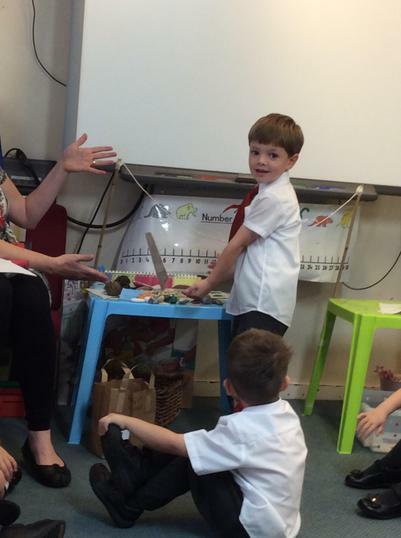 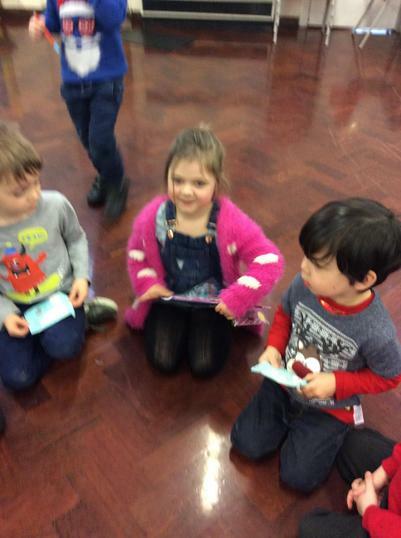 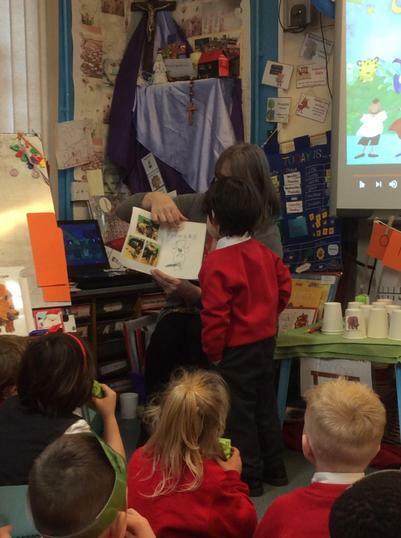 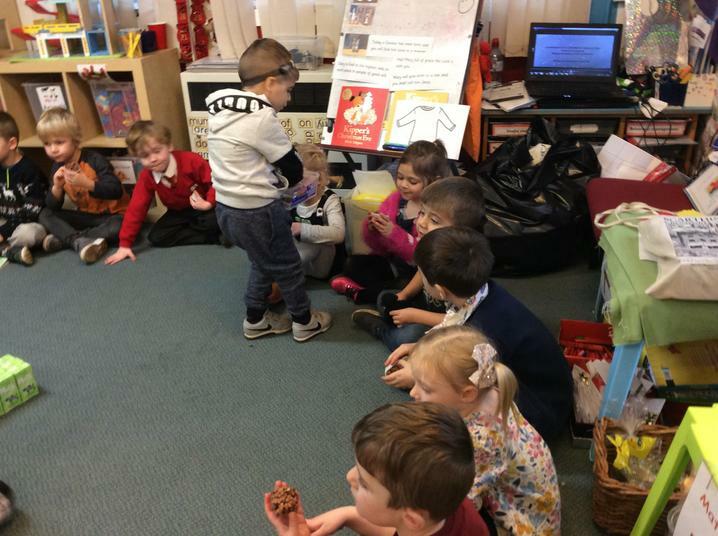 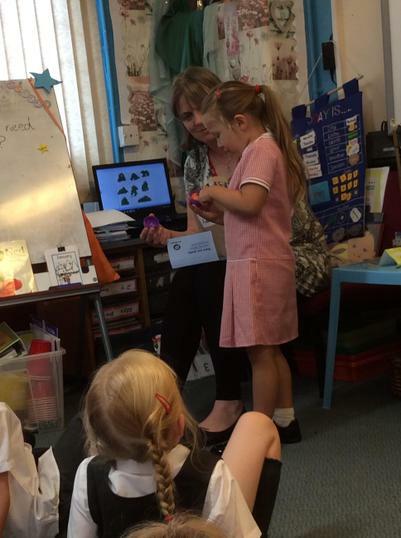 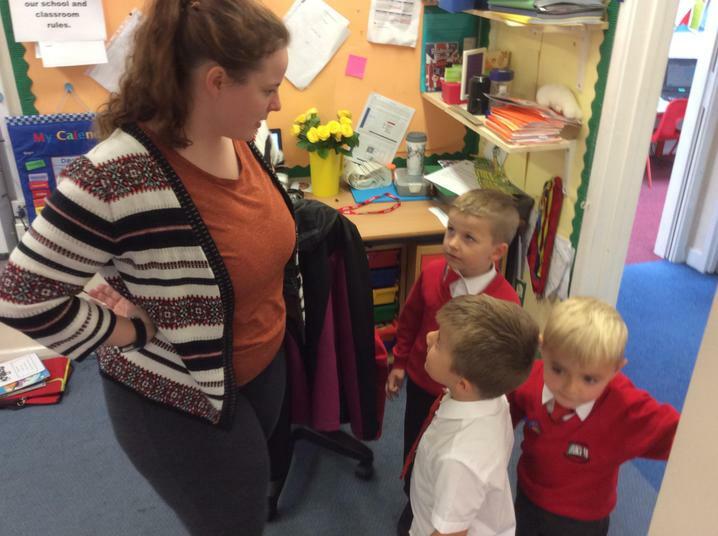 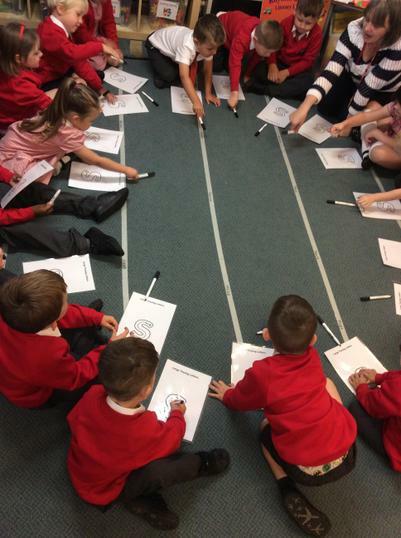 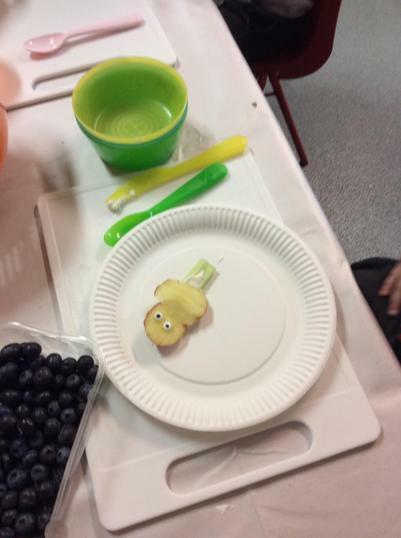 Telling a maths story about Bluey the Hen's eggs! 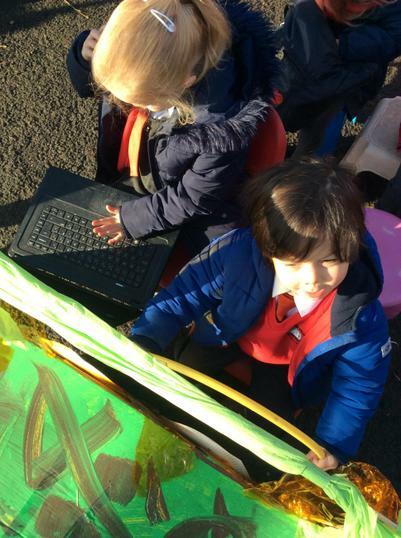 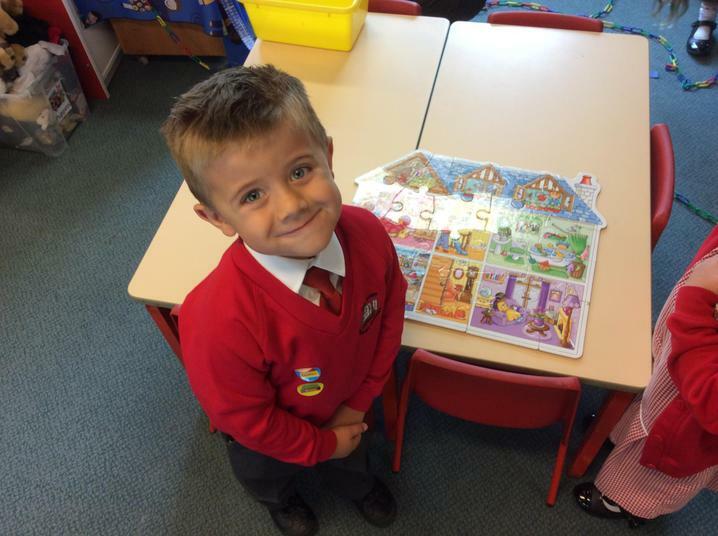 Tricky word hunting in colourful rice - nice work everyone! 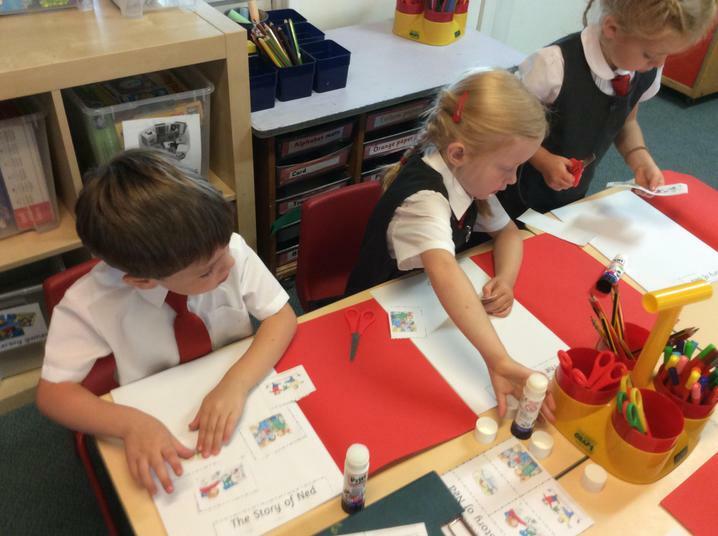 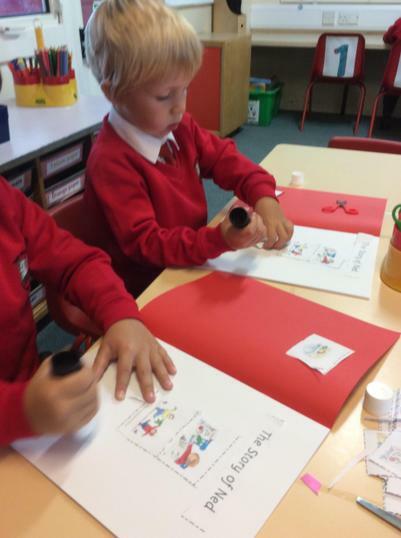 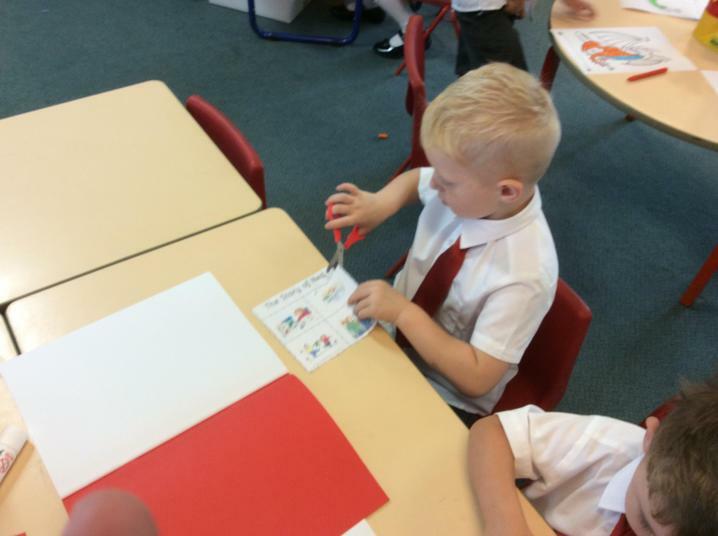 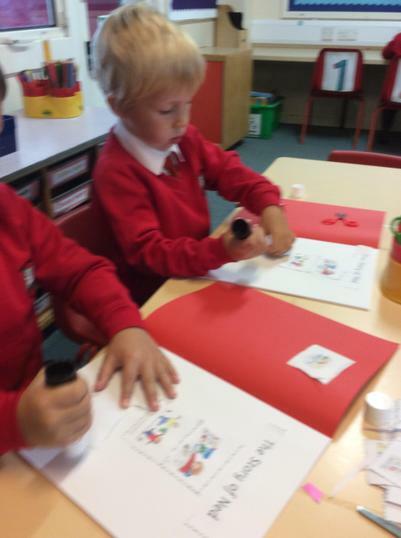 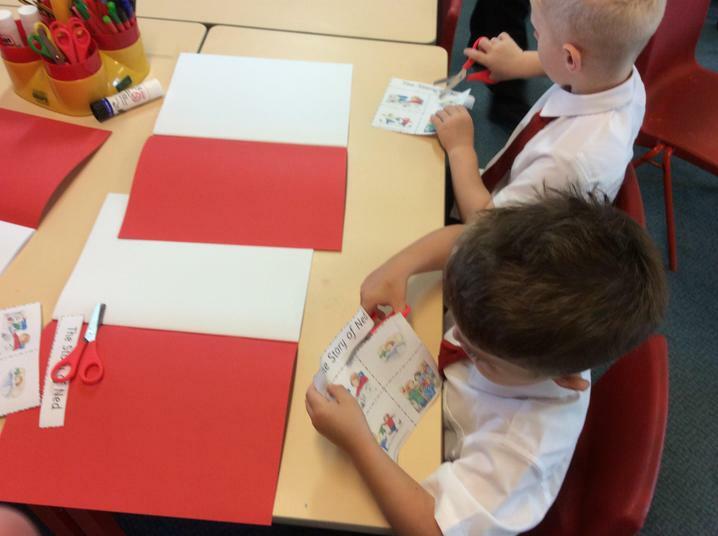 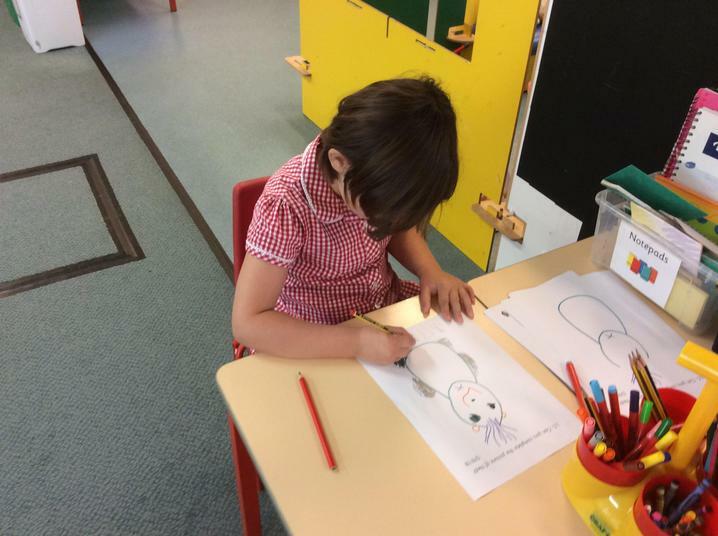 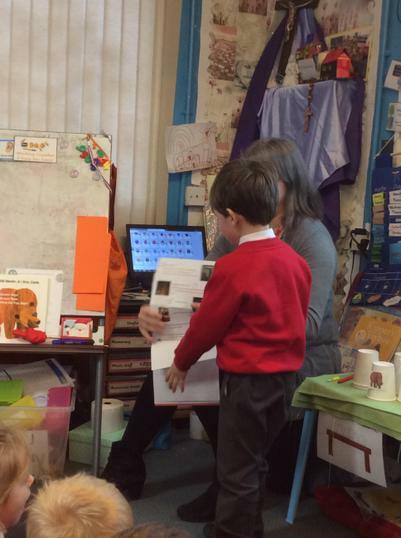 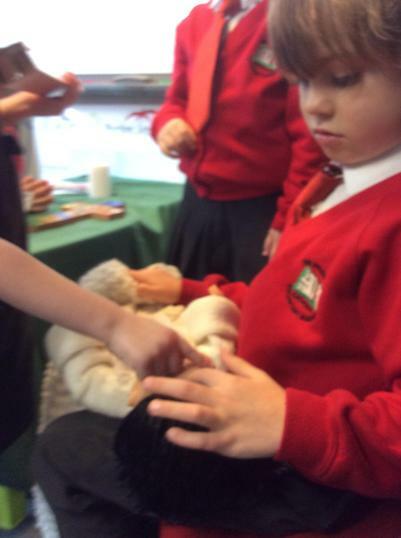 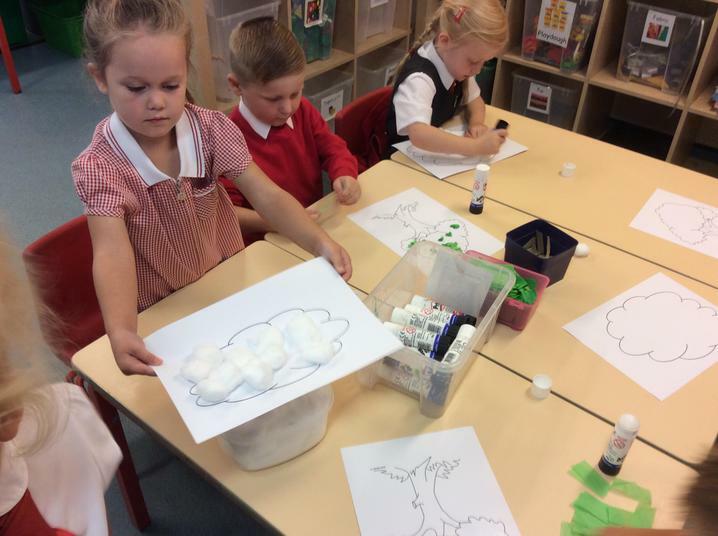 Learning about bears - making a class information book. 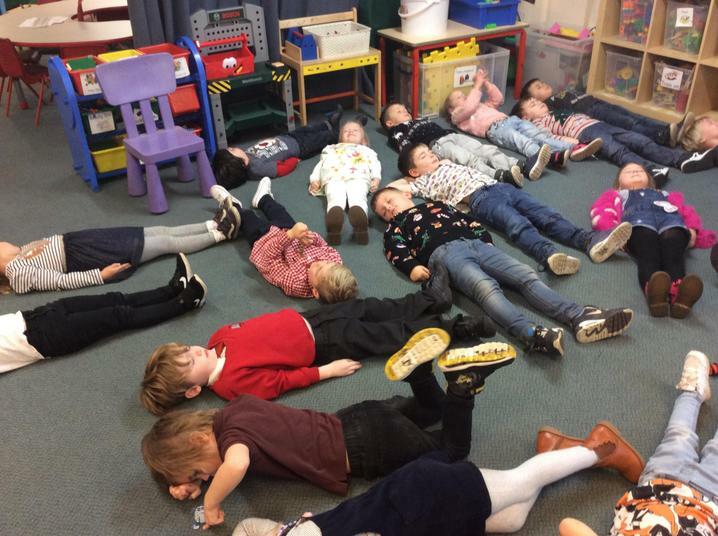 Whats do zoo animals think about? 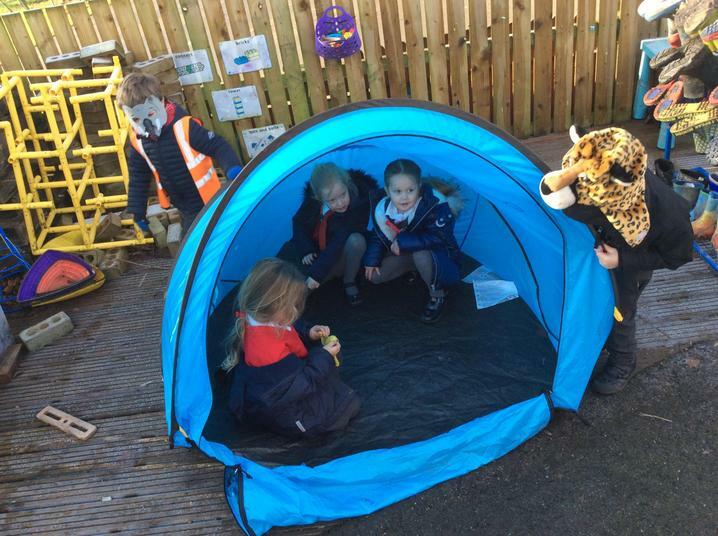 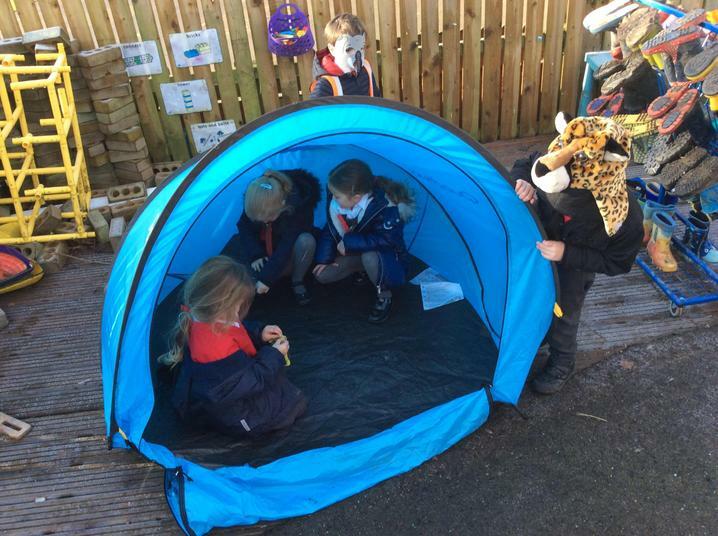 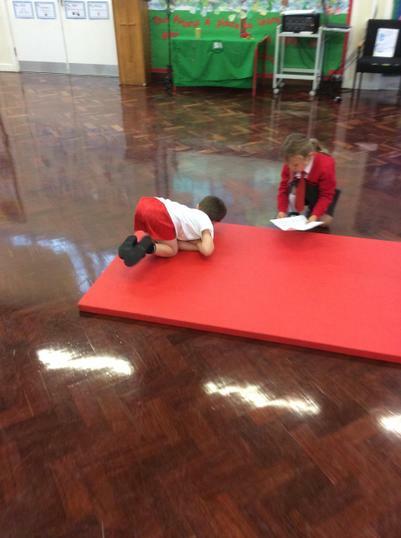 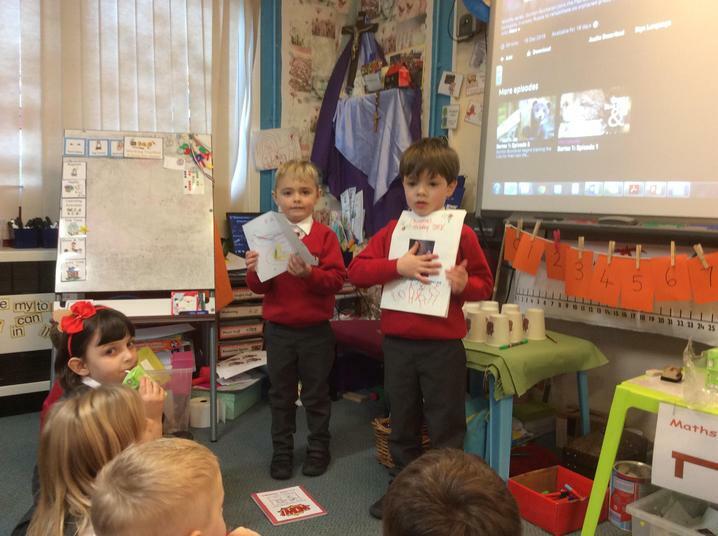 Planning a trip to the Zoo to visit the jungle animals. 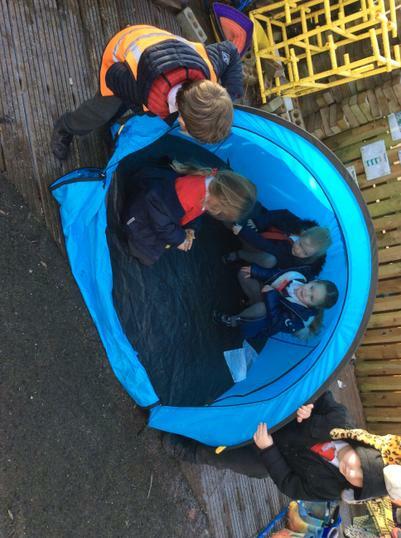 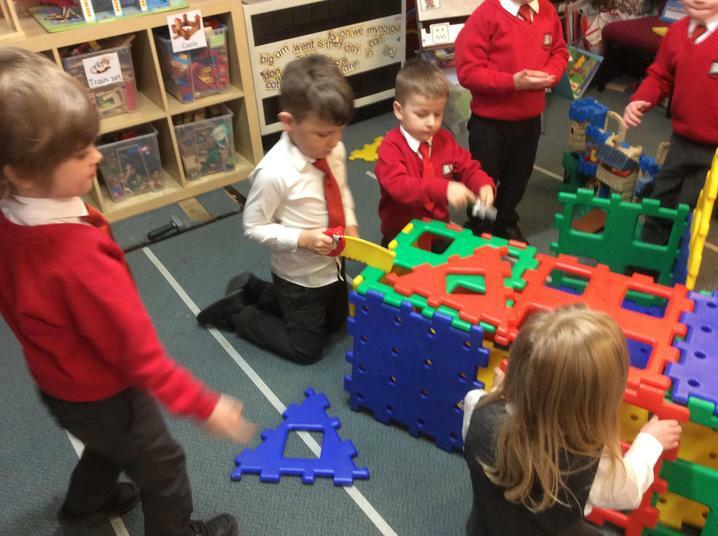 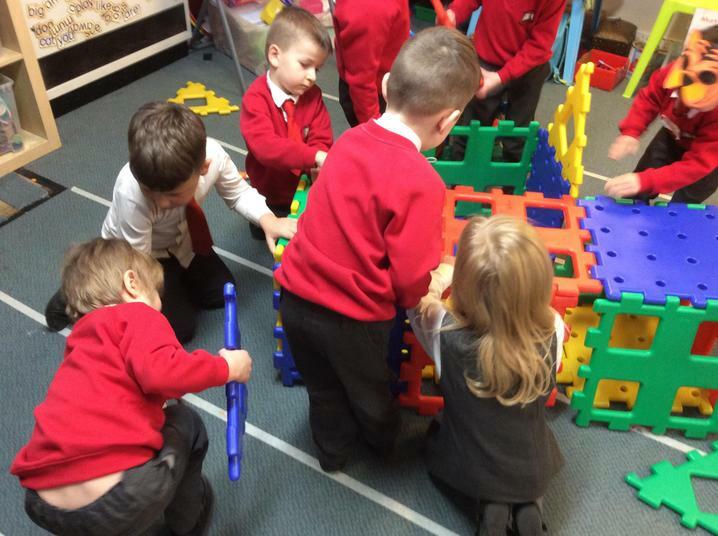 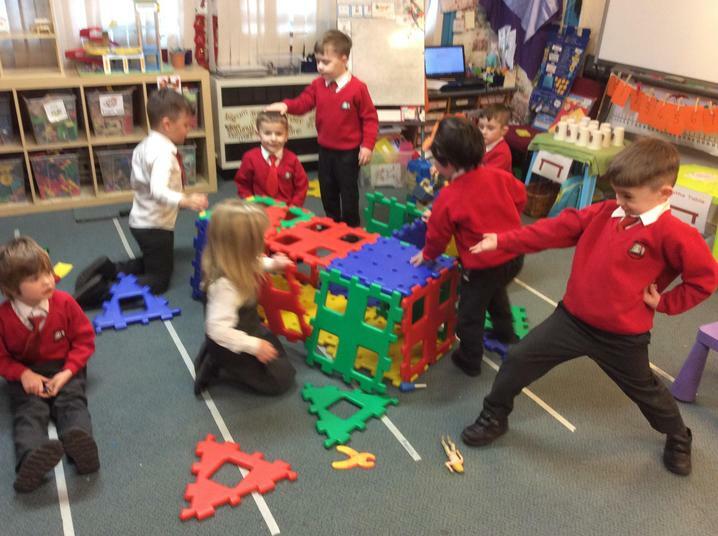 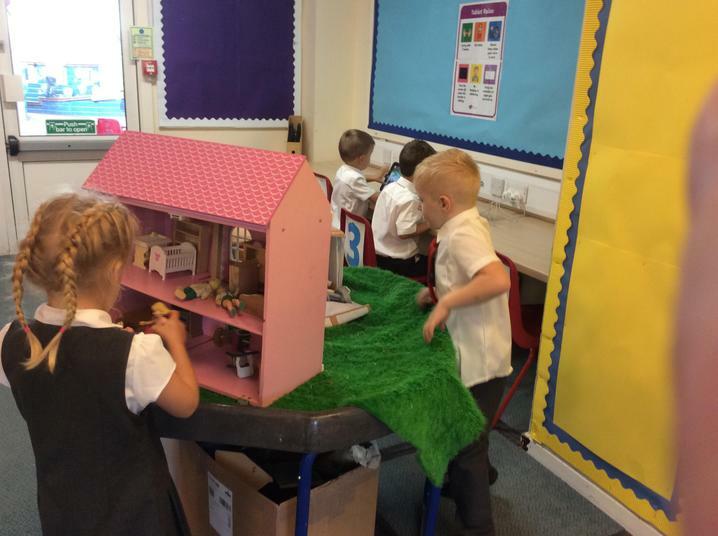 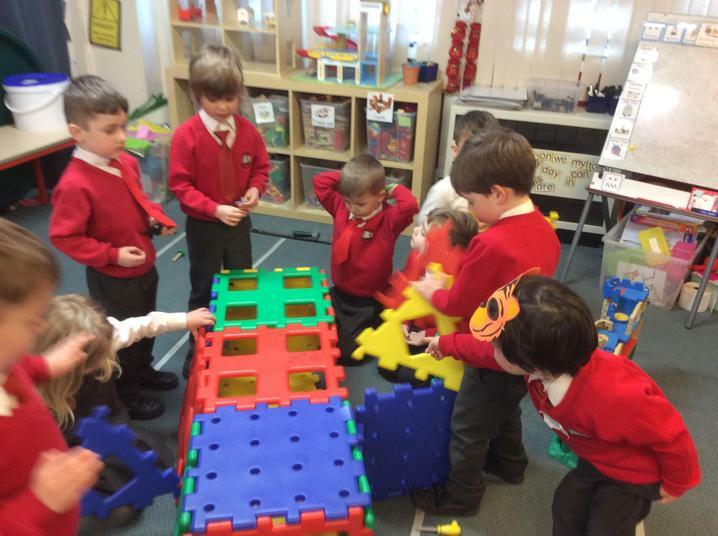 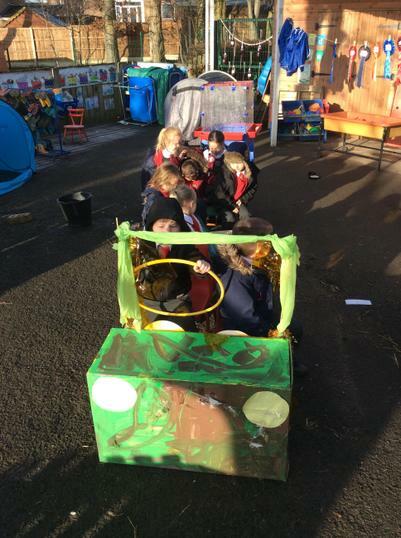 Super team work - check out our house! 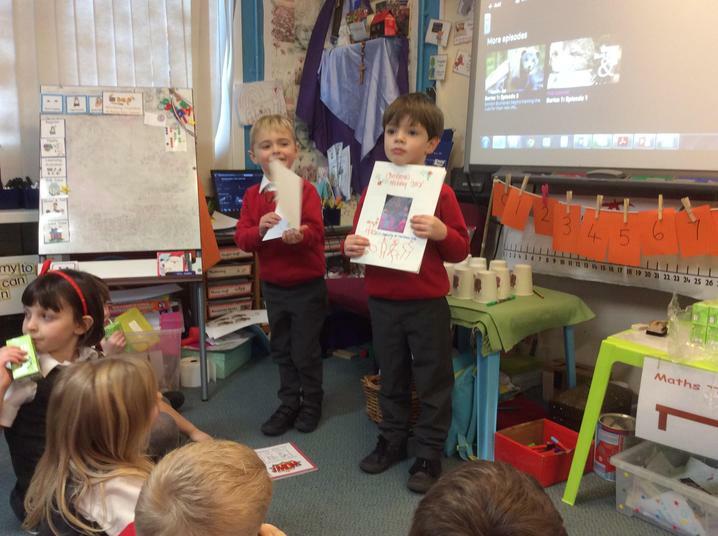 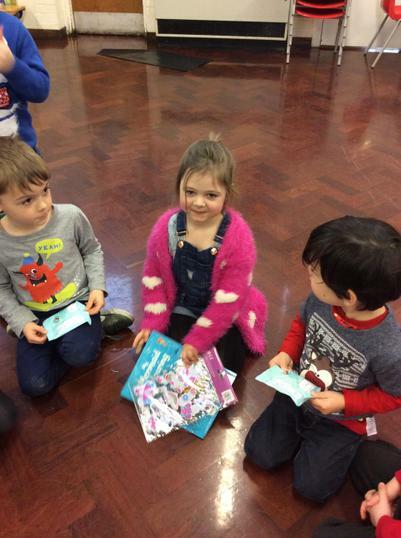 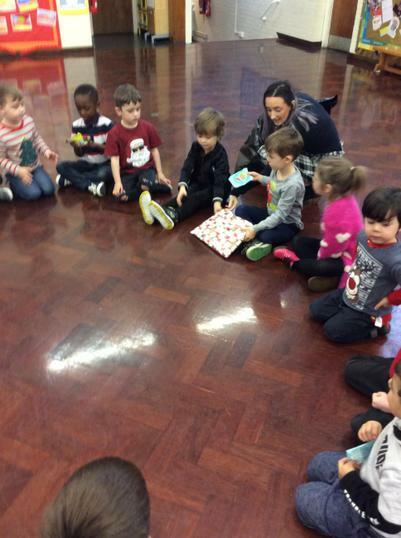 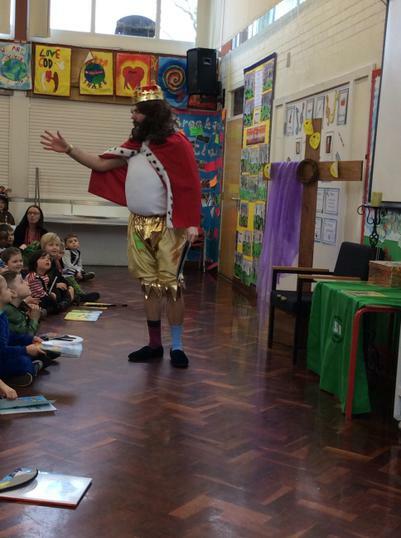 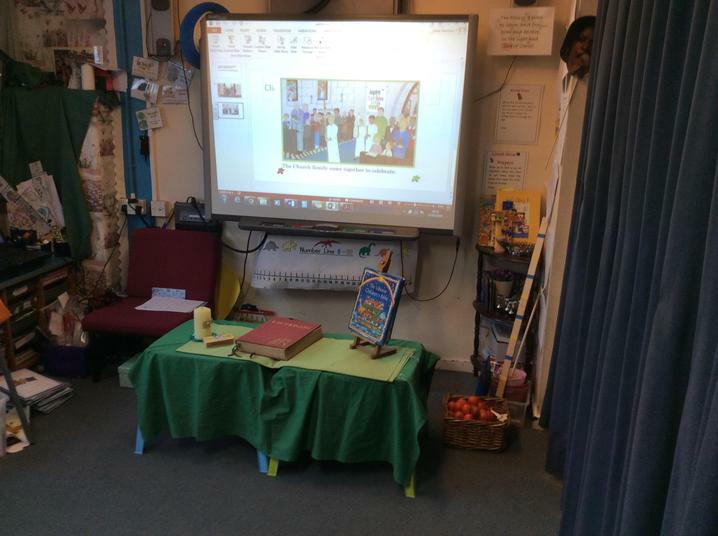 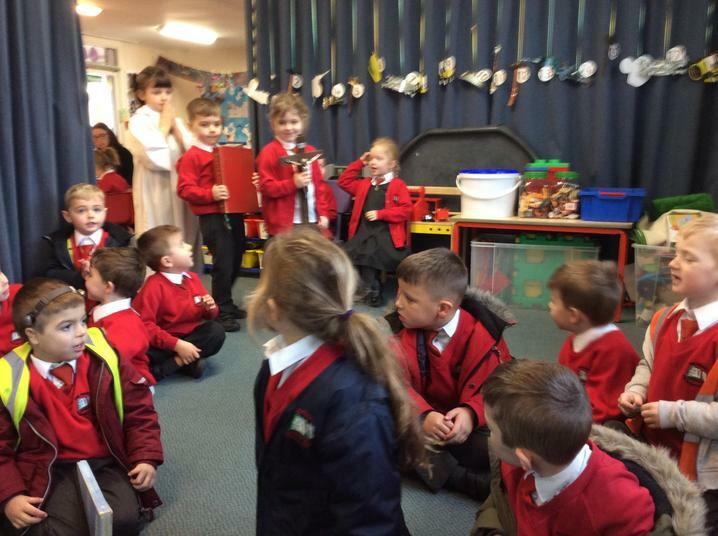 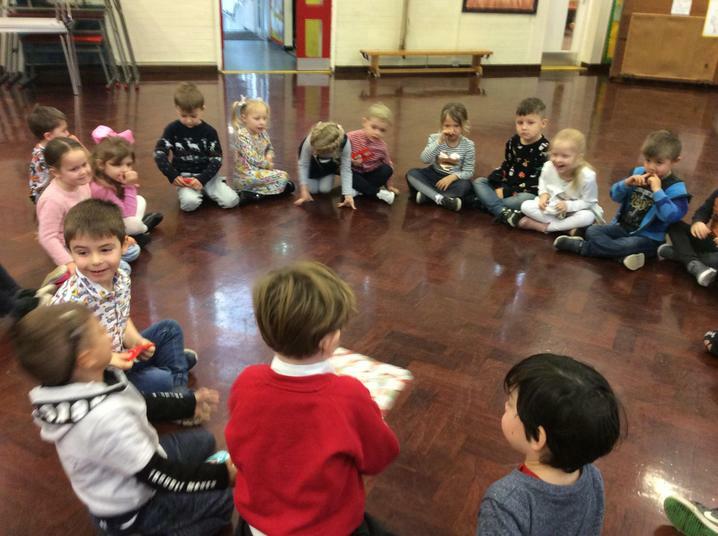 First week back, 'Show and Tell' our Christmas and New Year scrap book memories. 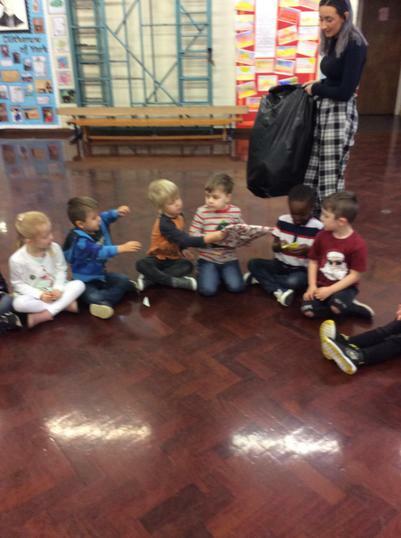 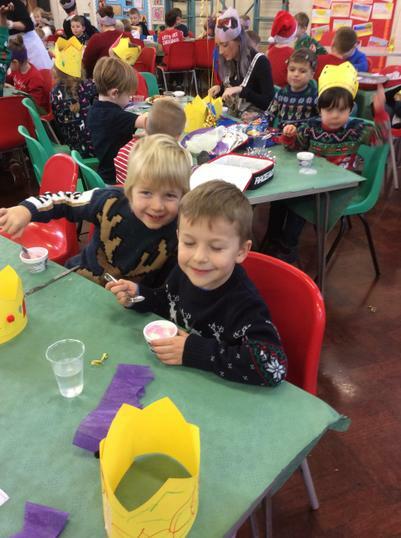 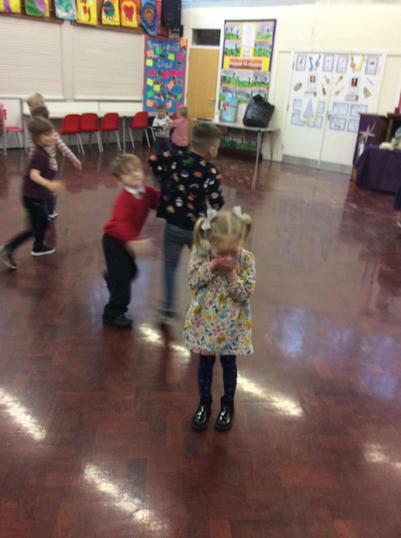 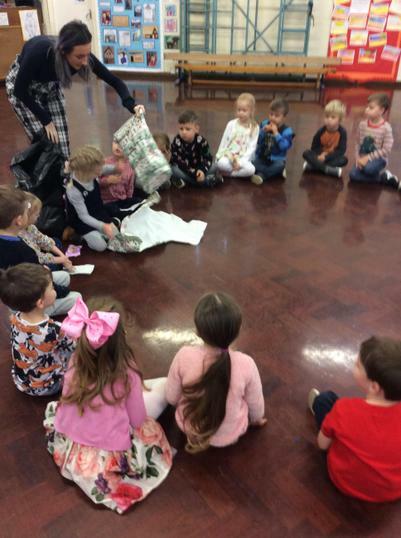 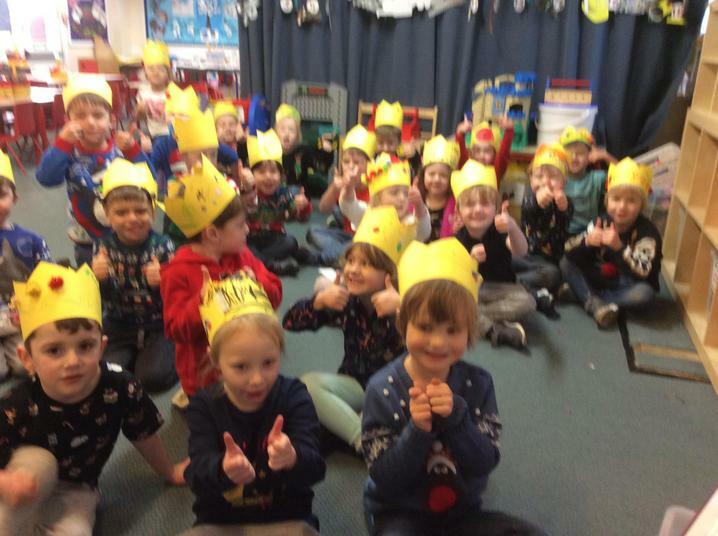 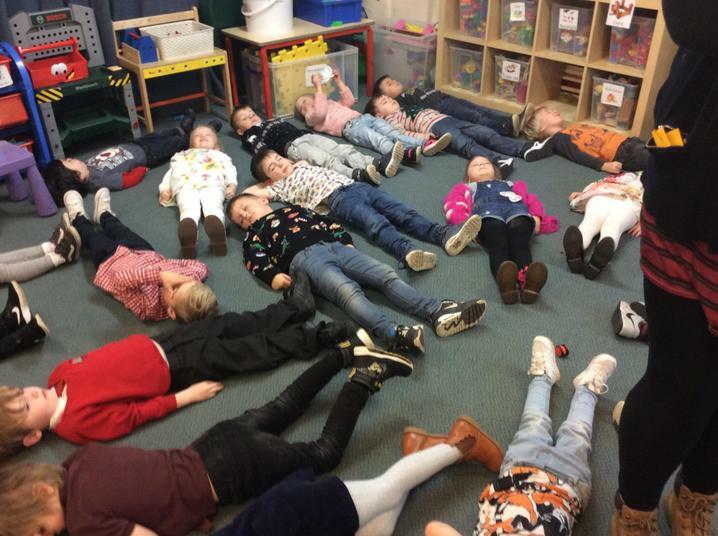 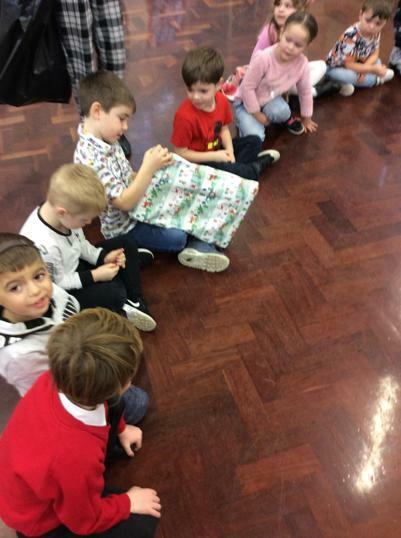 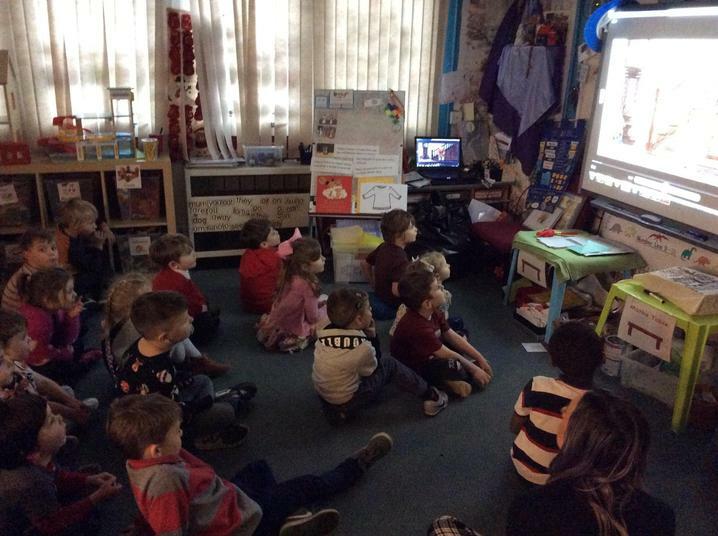 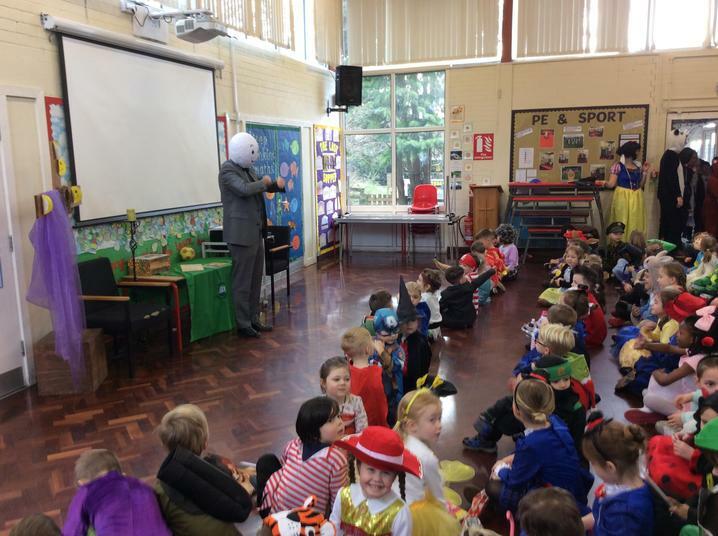 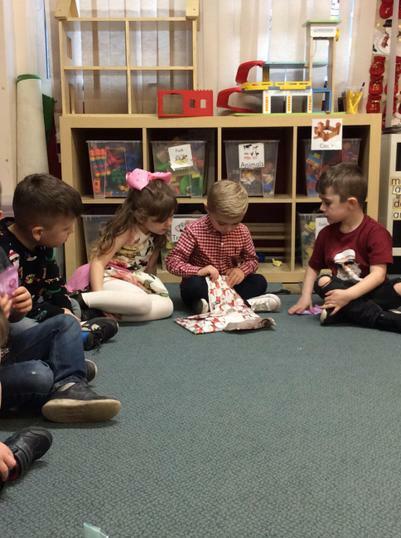 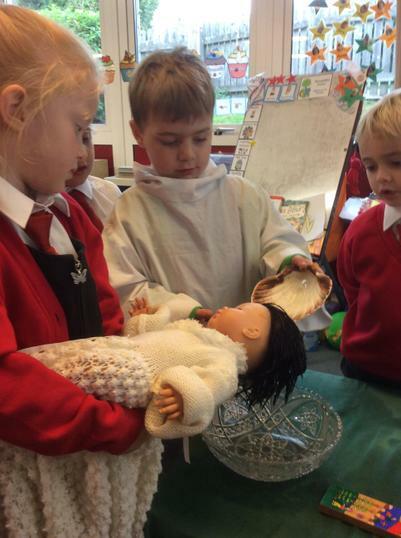 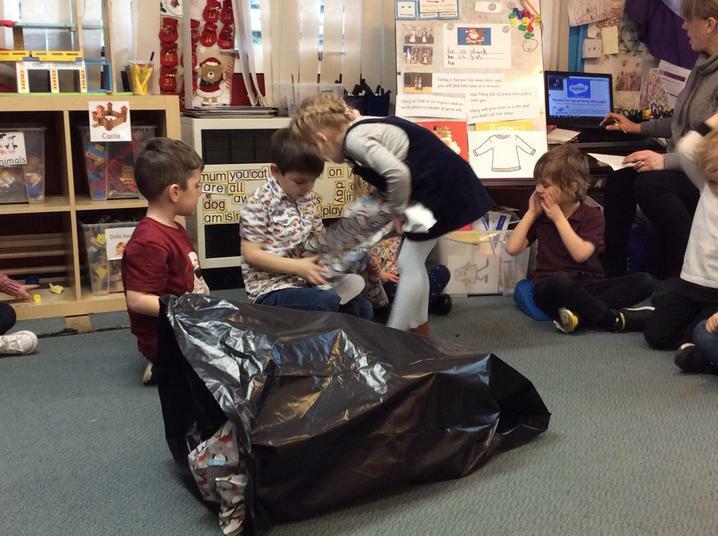 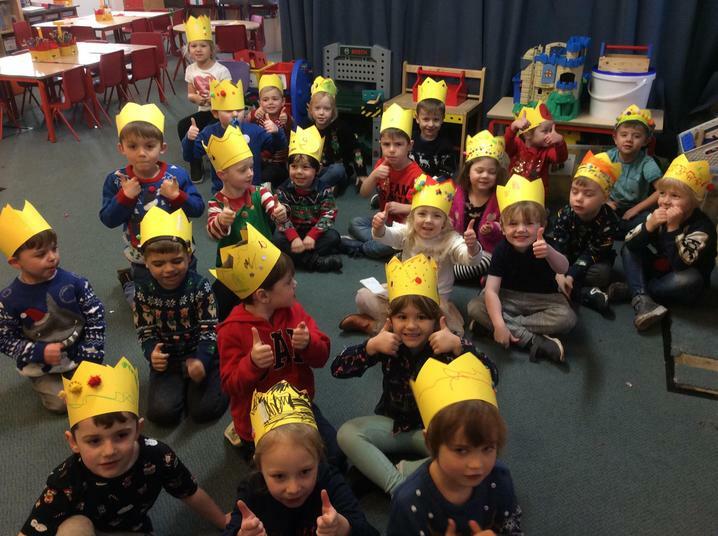 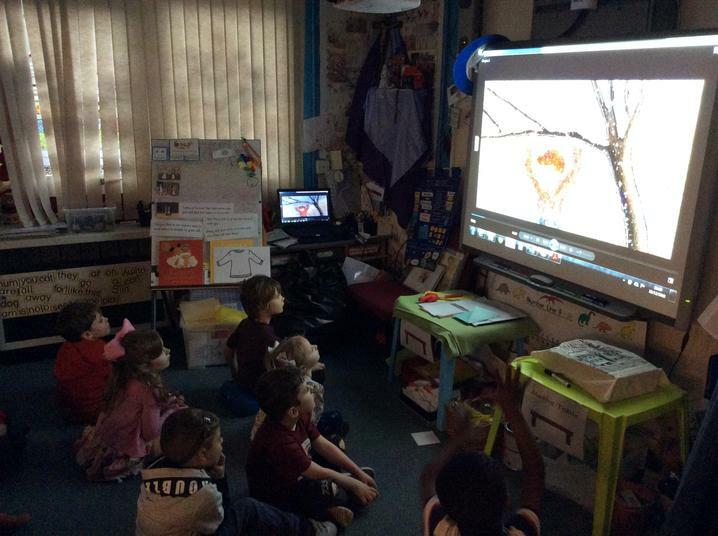 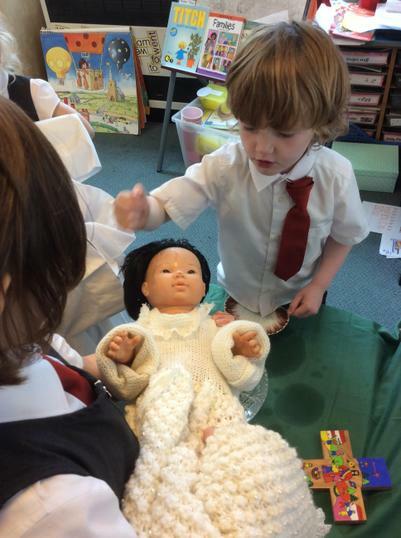 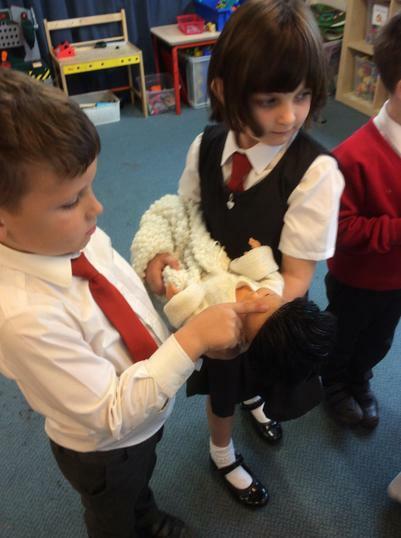 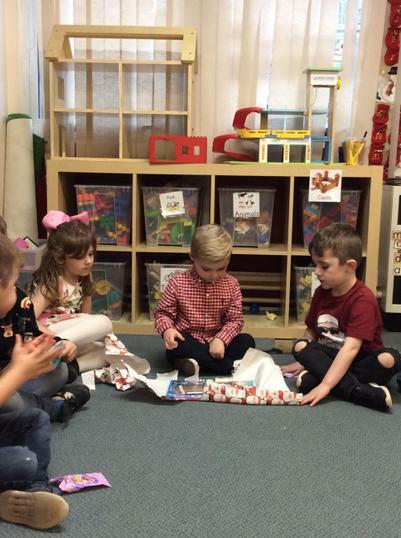 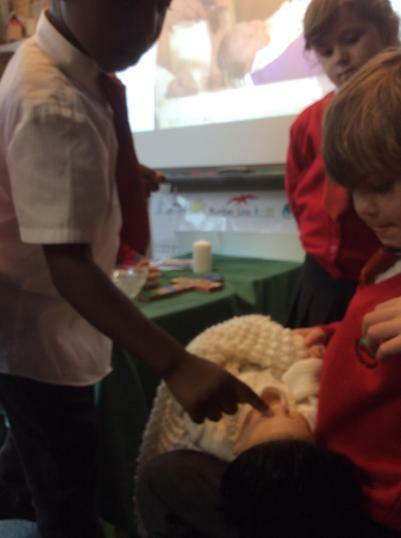 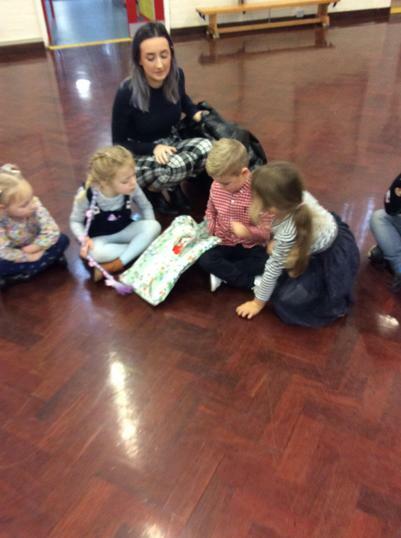 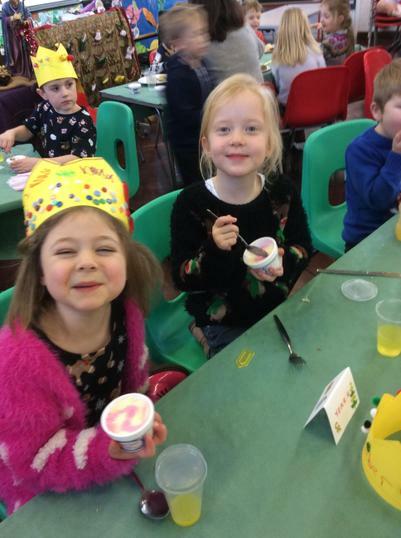 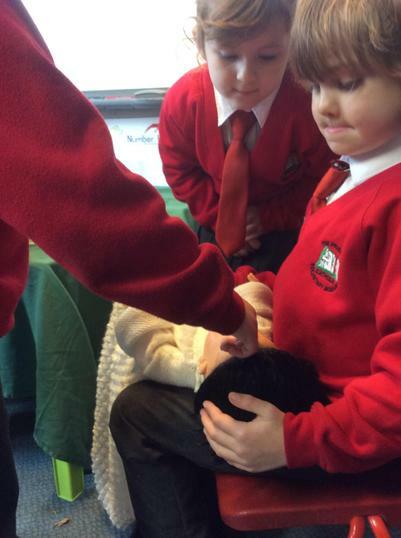 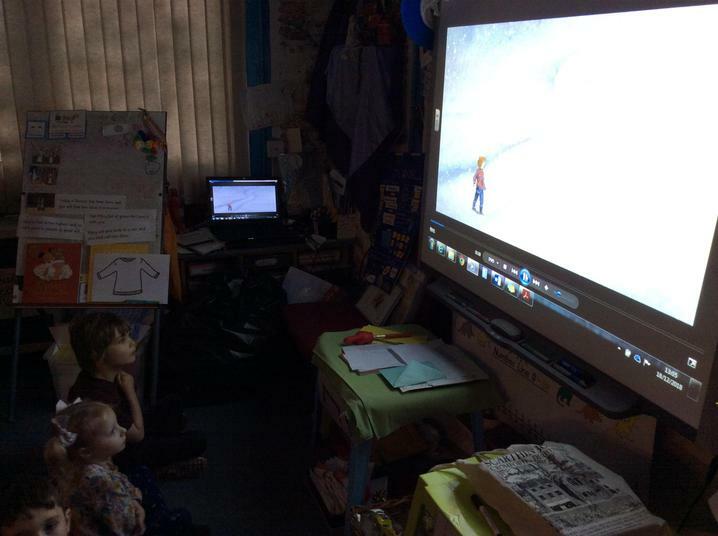 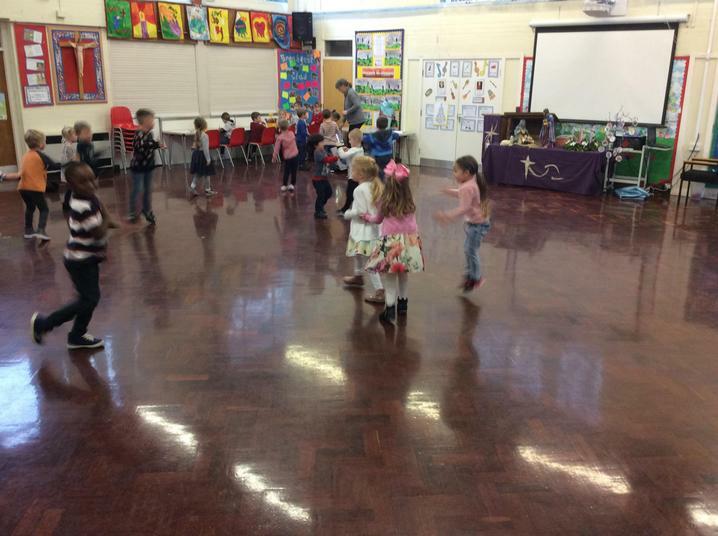 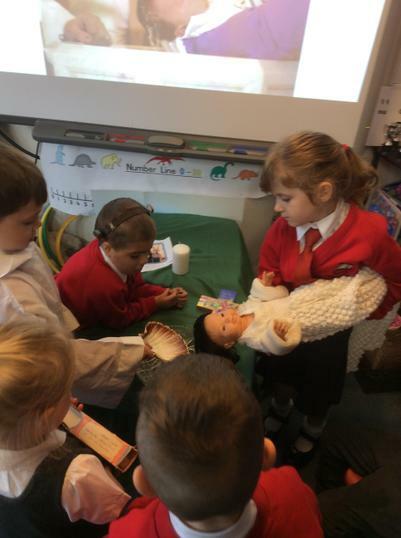 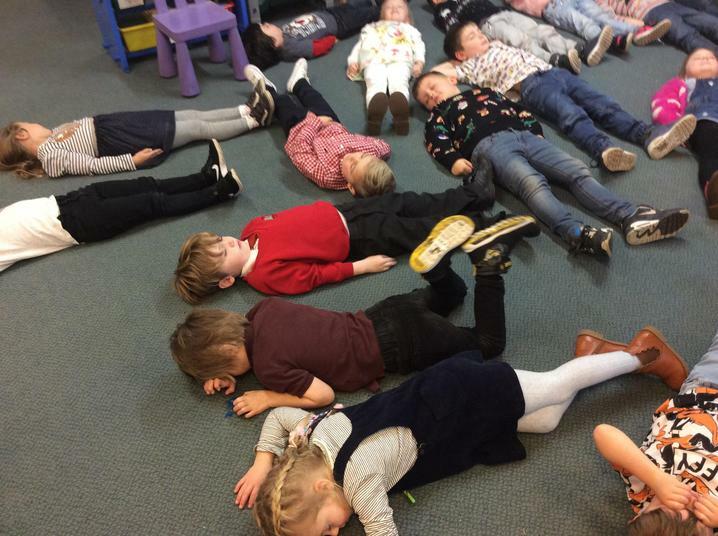 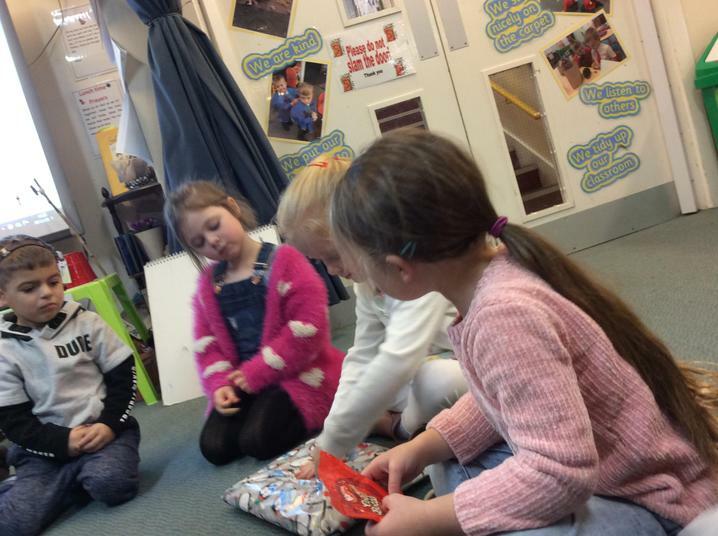 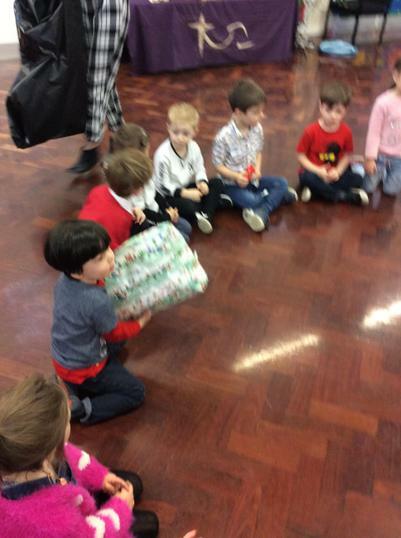 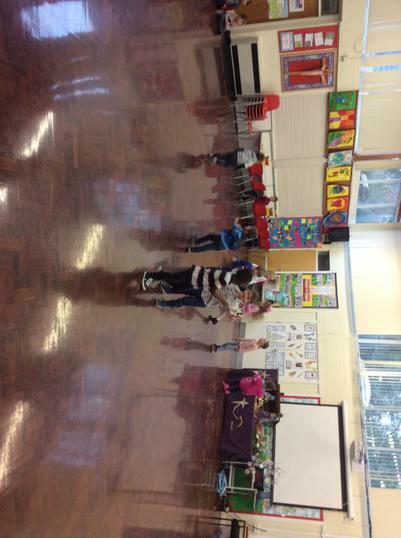 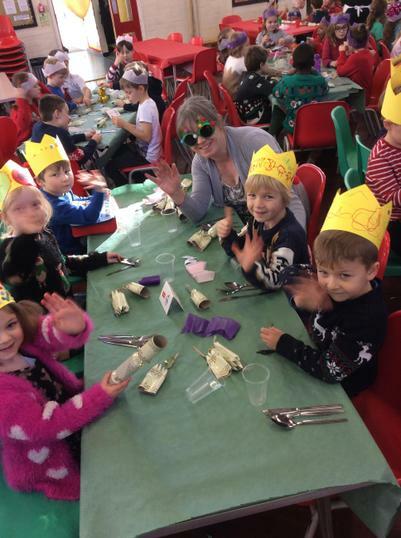 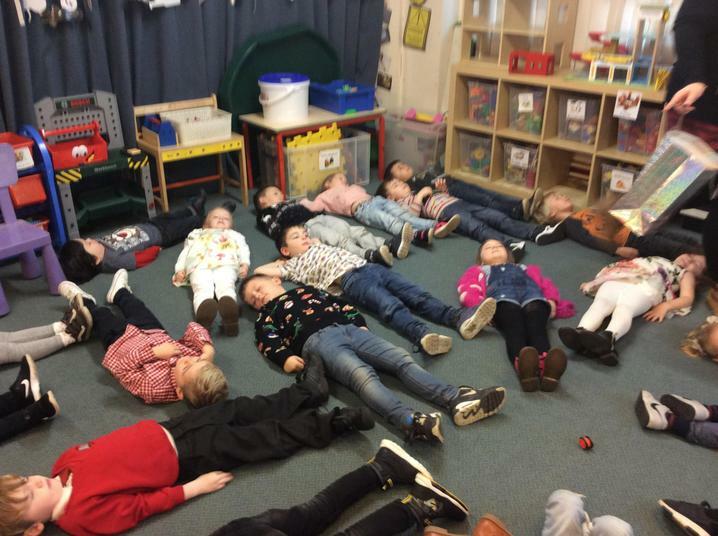 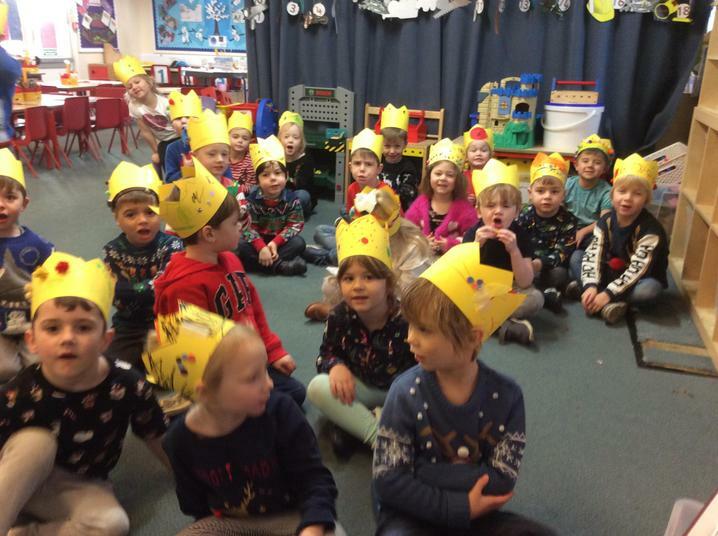 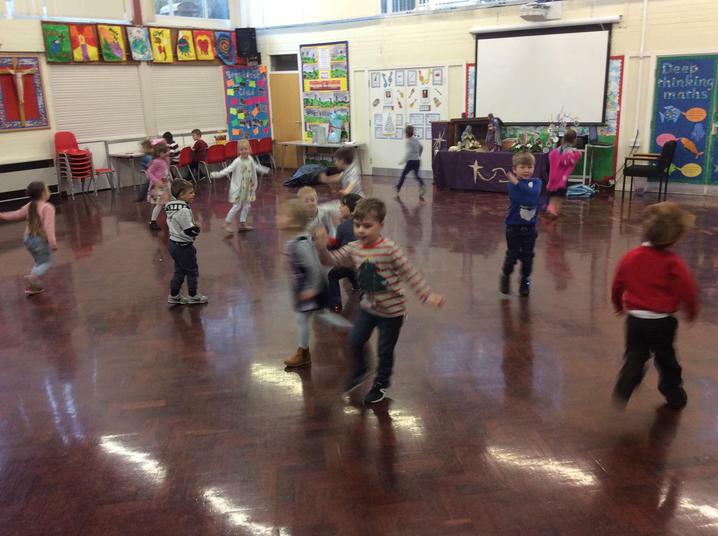 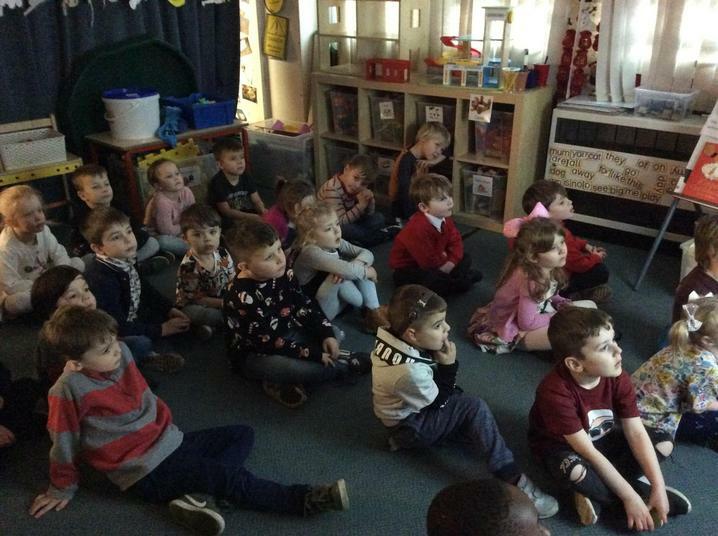 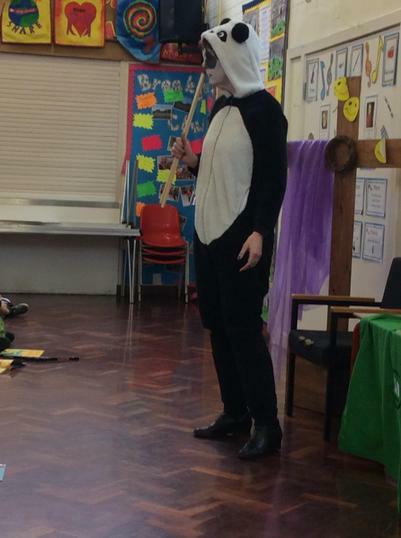 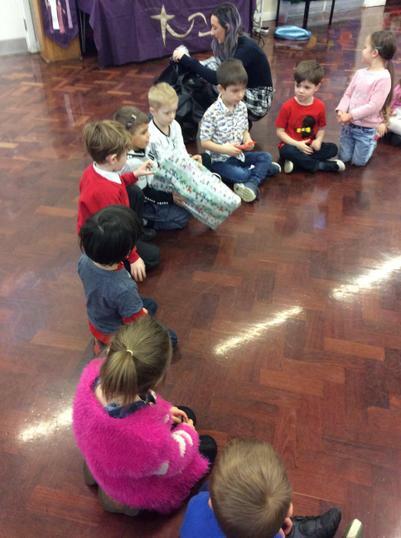 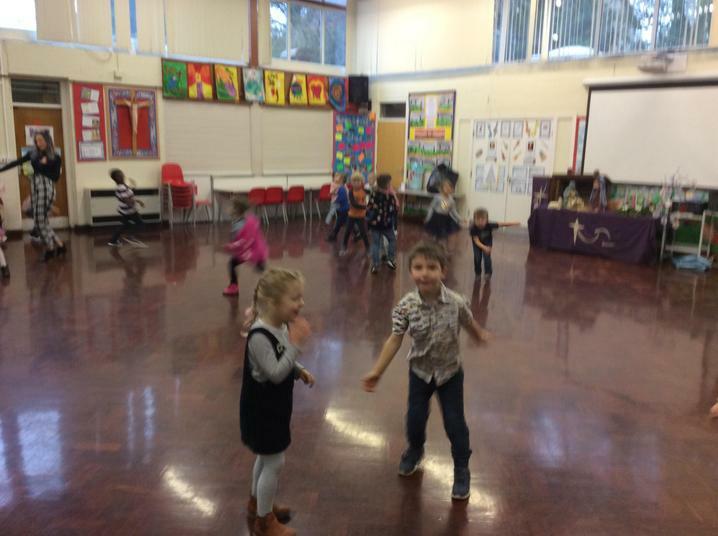 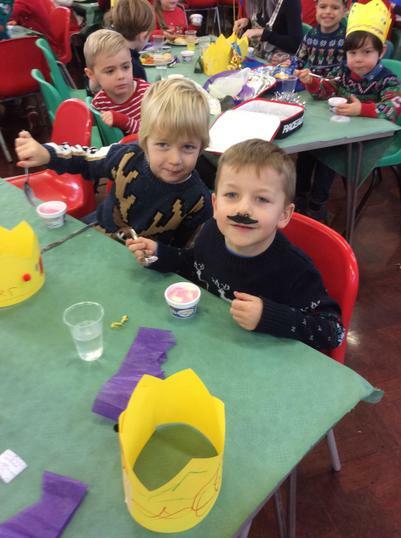 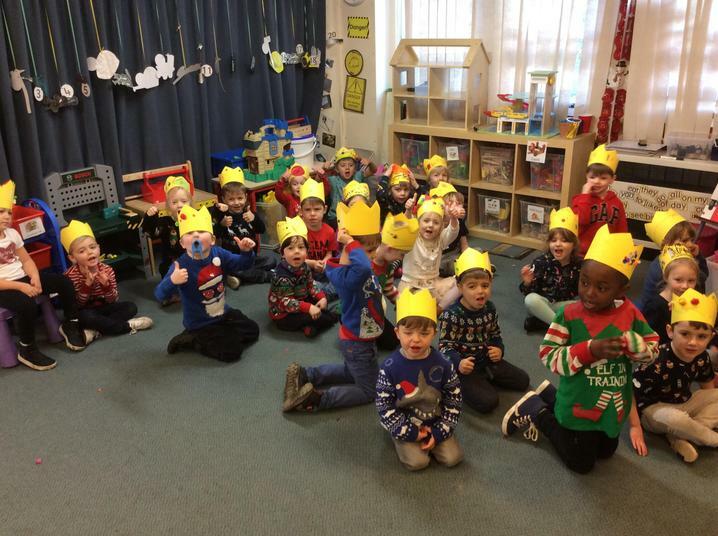 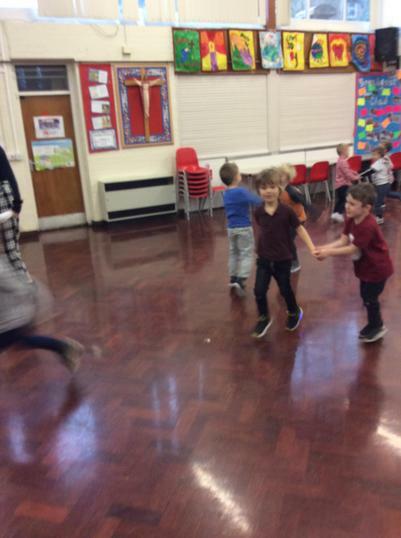 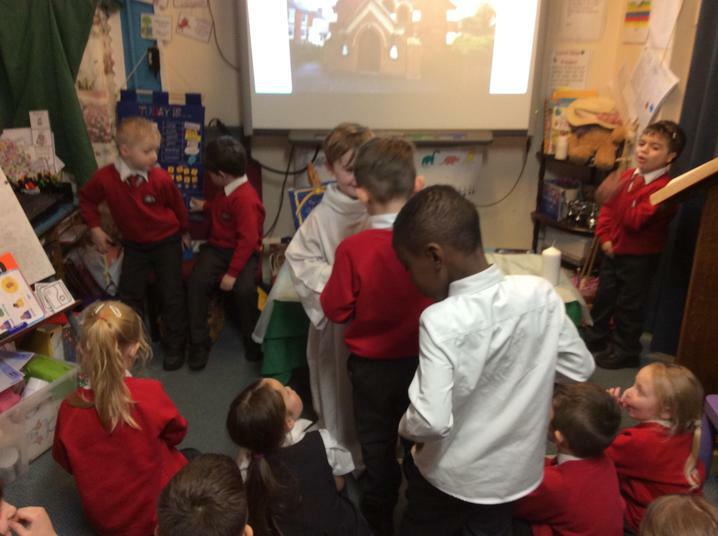 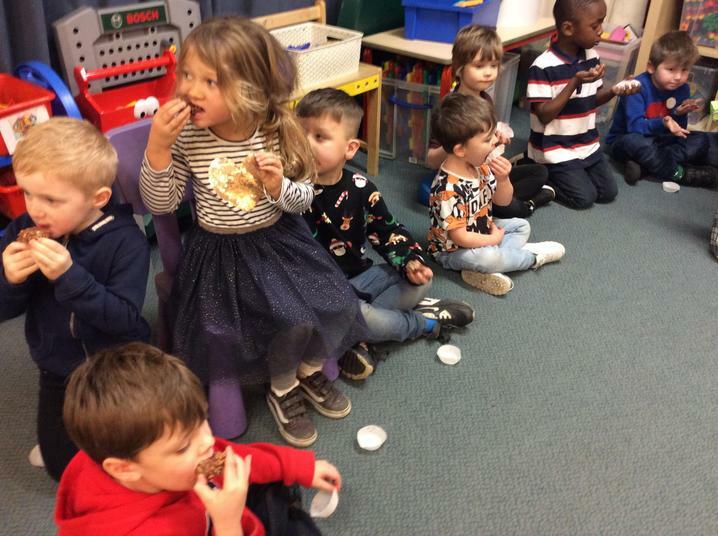 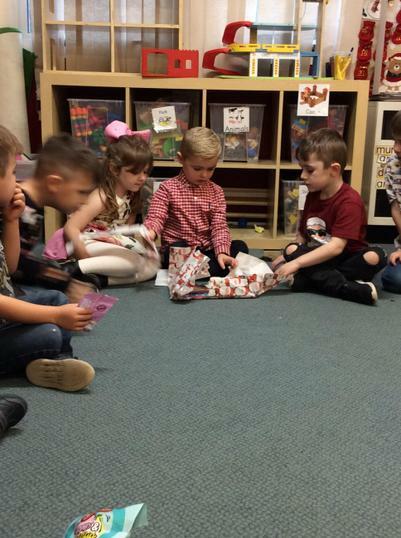 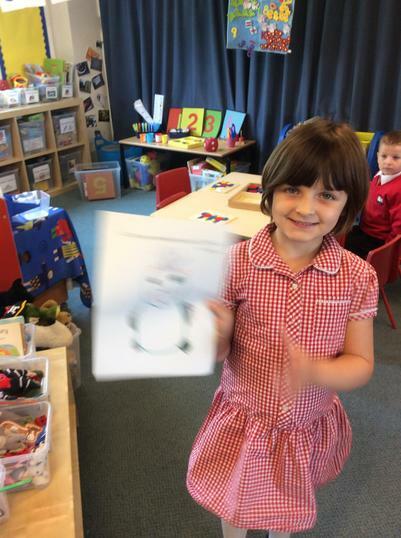 We have had a wonderful few days celebrating and preparing for Christmas with our Christmas party: games in the hall, pass the parcel and sleeping seals in class and enjoying the film - the Snowman. 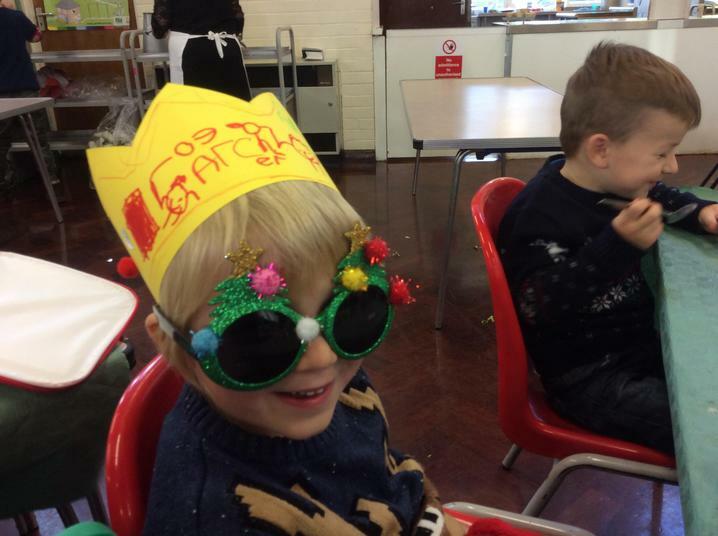 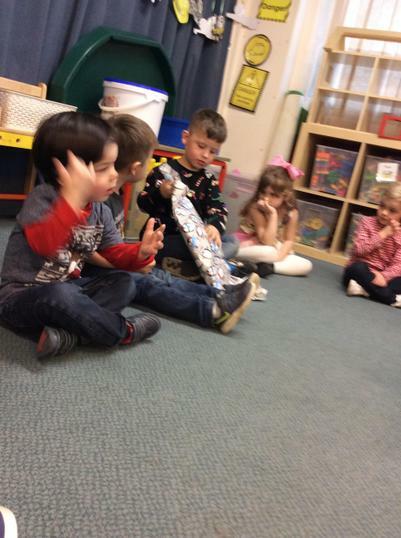 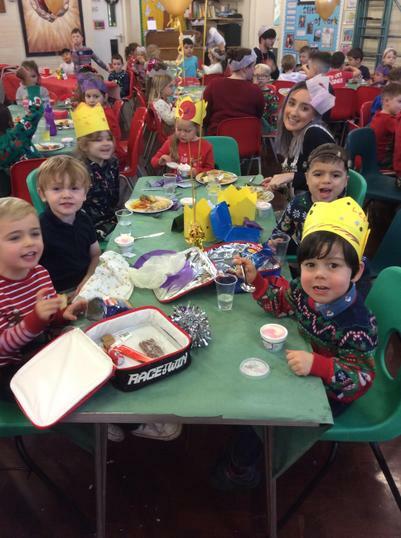 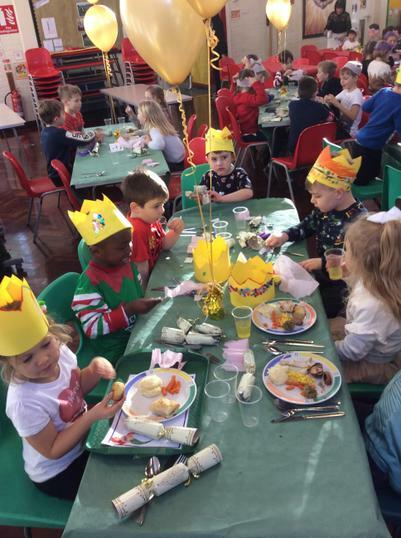 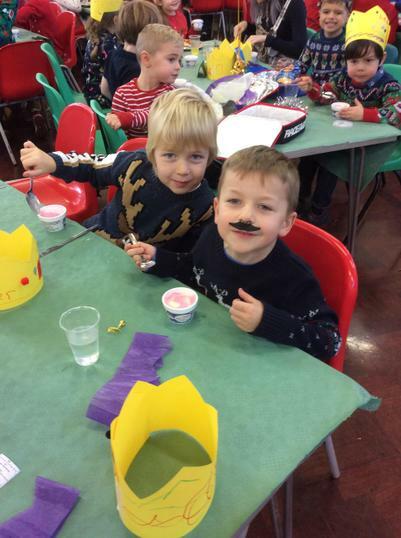 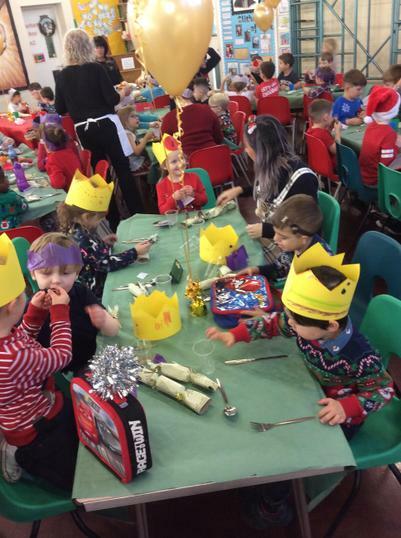 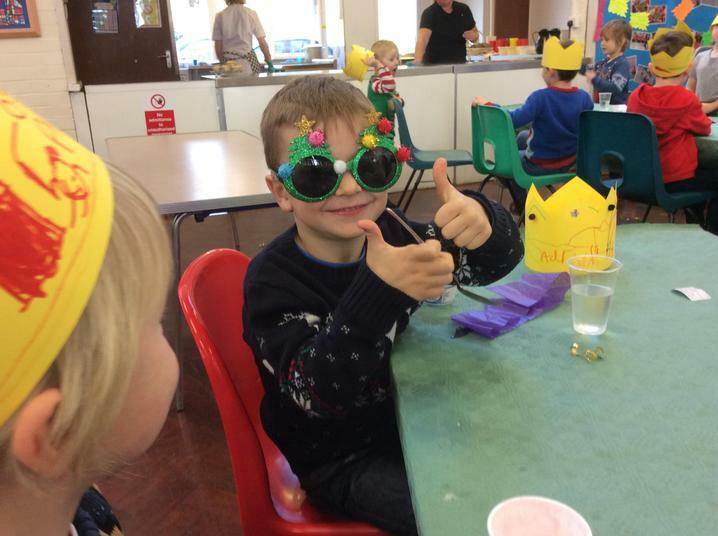 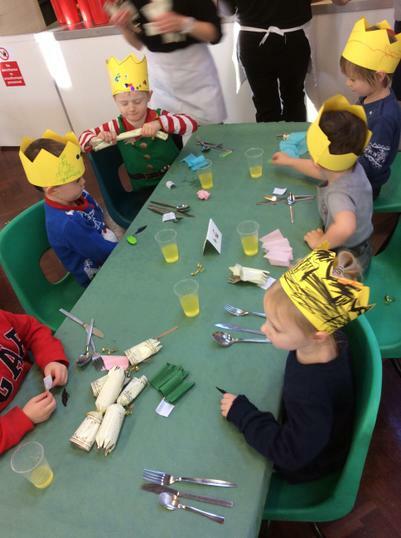 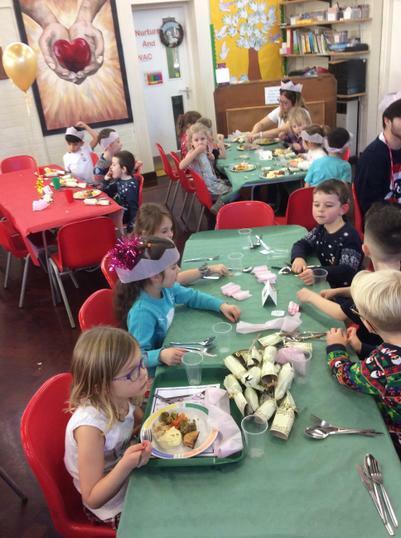 Christmas dinner day was also a real treat - we had lots of fun with the Christmas cracker jokes. 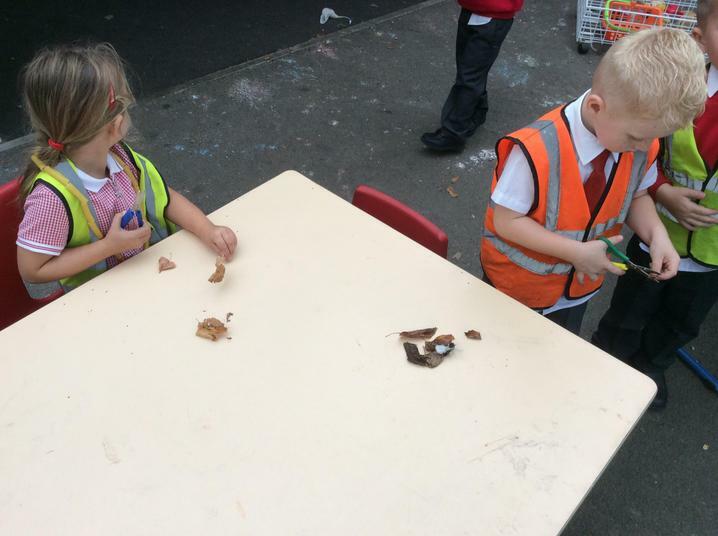 We made our own bog. 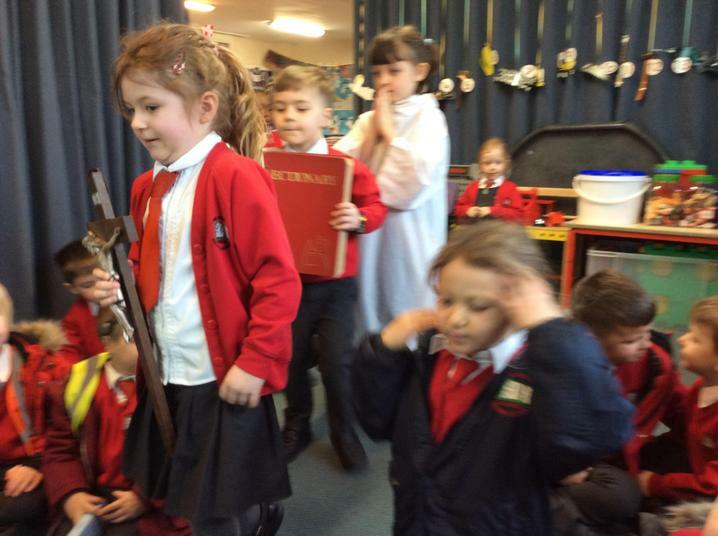 The animals fell into our bog. 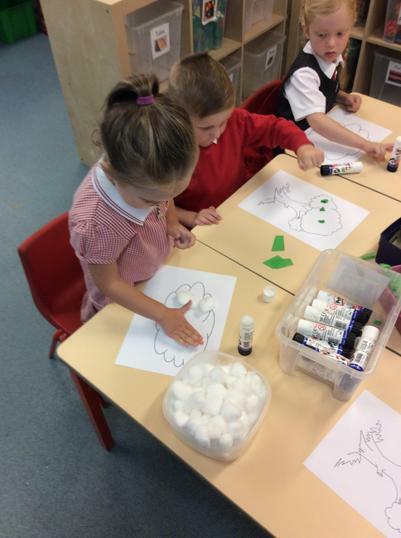 The animals became a bog monster. 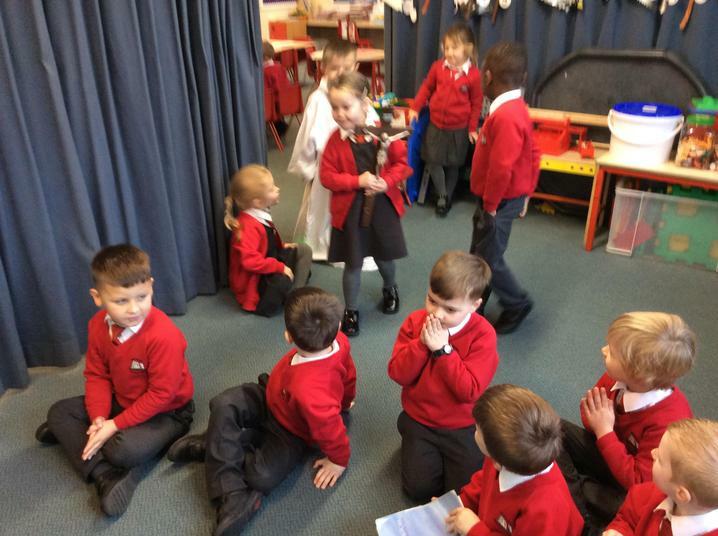 We re-told and acted the story. 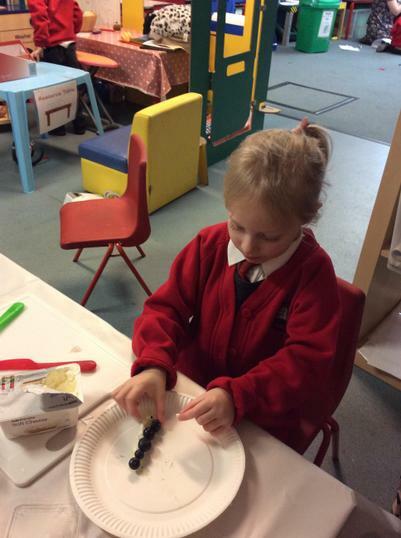 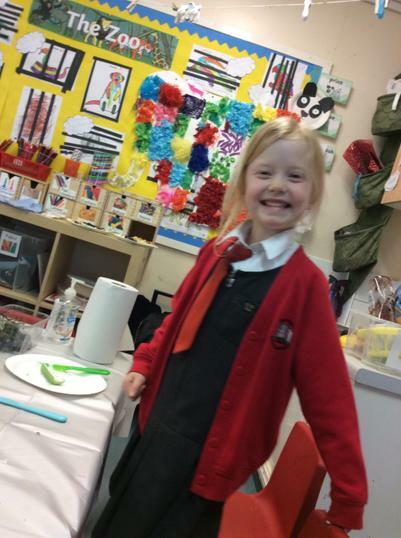 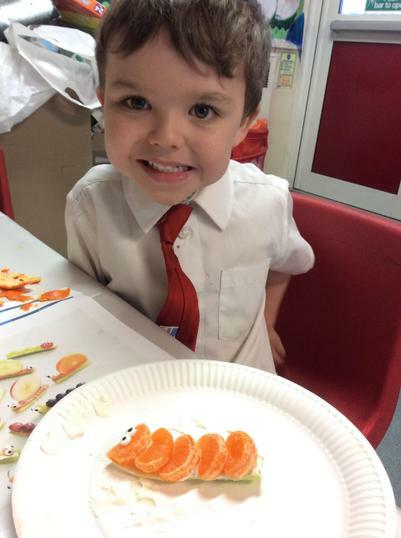 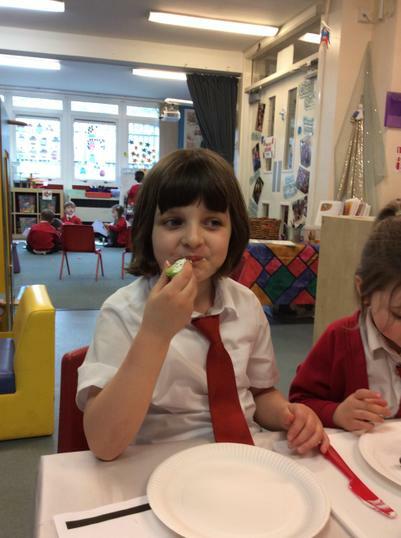 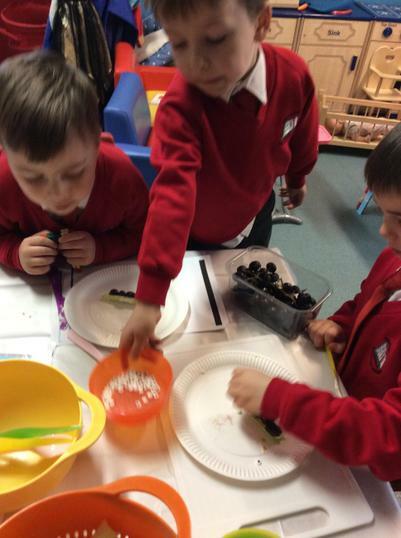 Maths using cakes, candles and decorations. 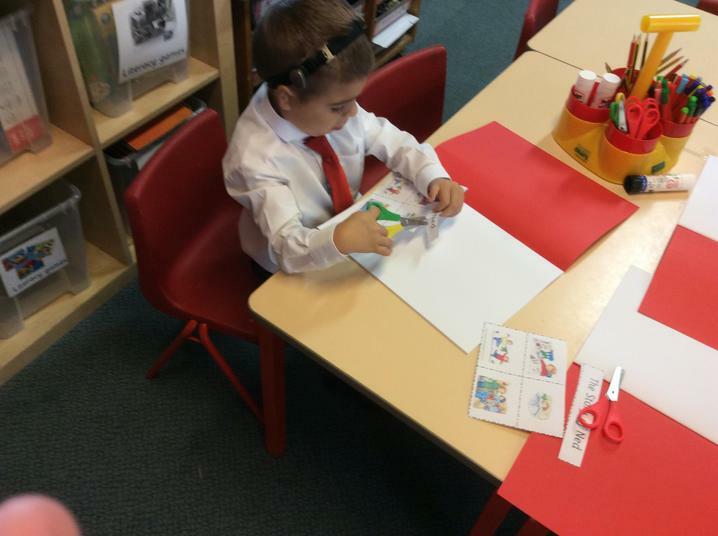 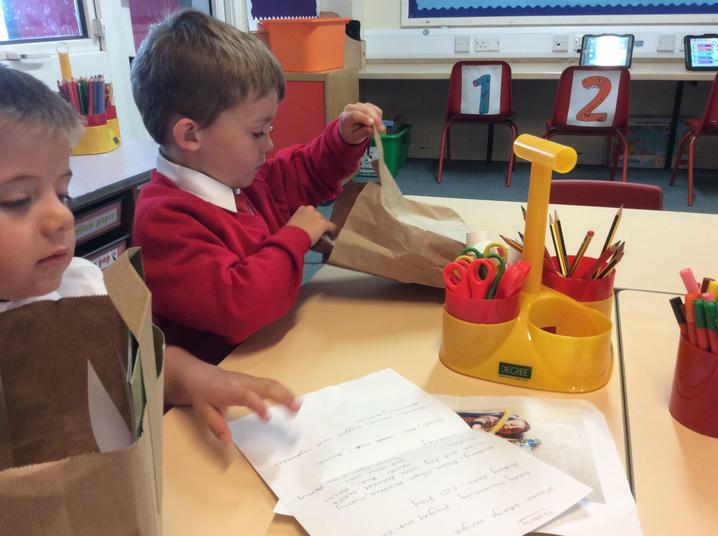 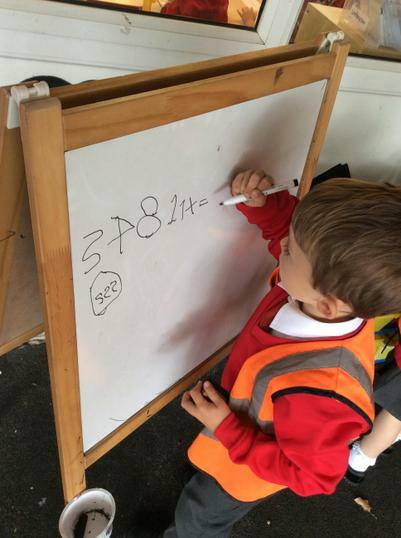 Writing an addition maths story. 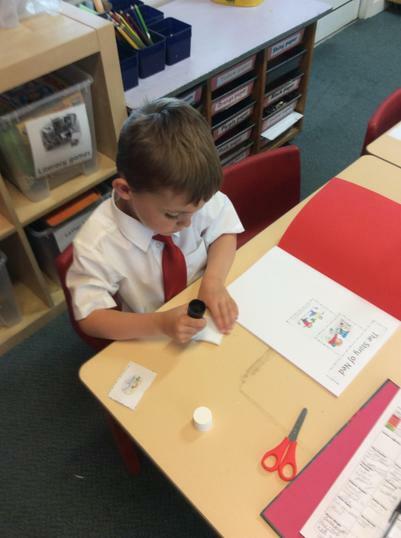 Tummy time dot to dot, counting to make a picture. 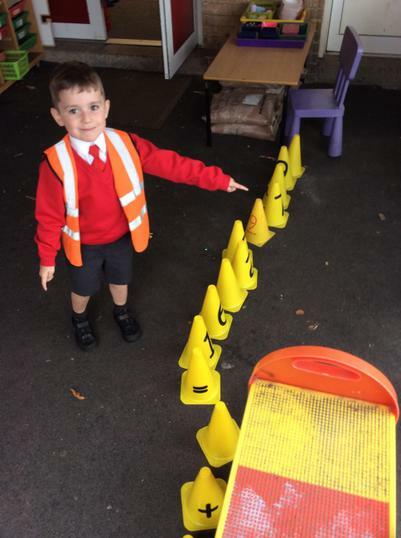 If you move them does the amount change? 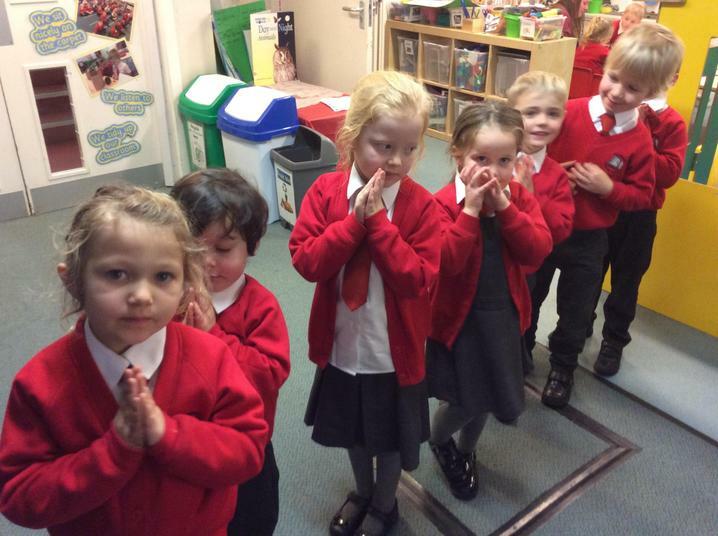 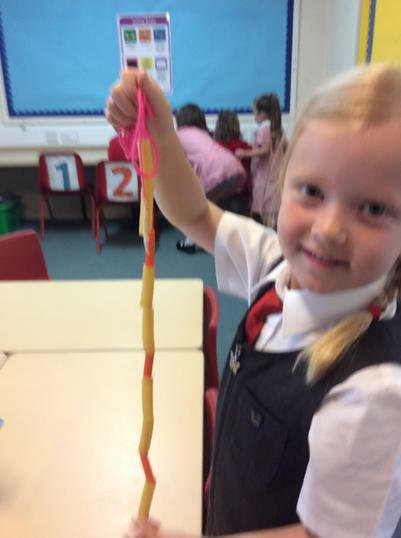 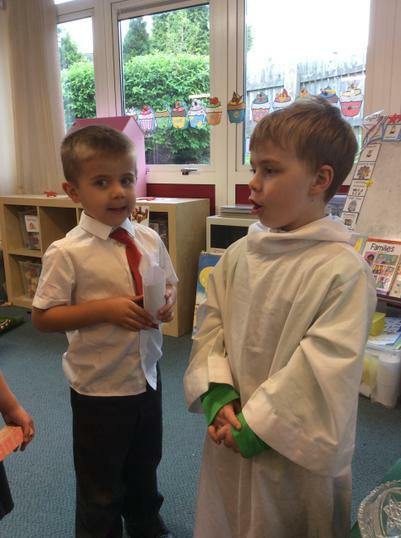 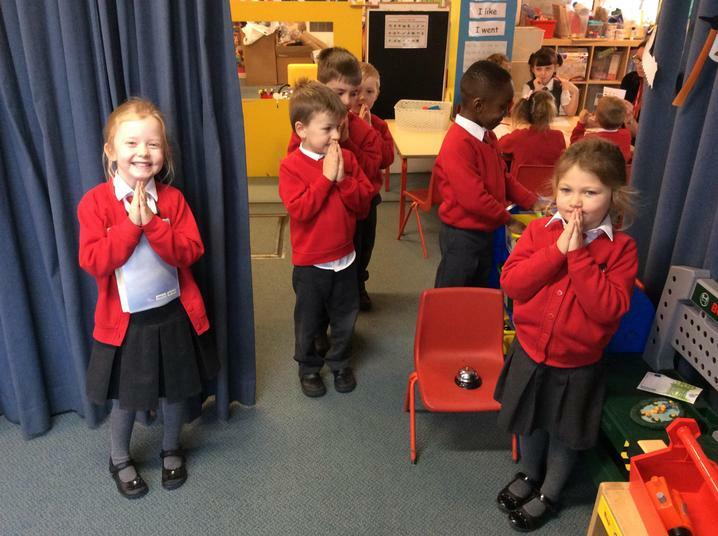 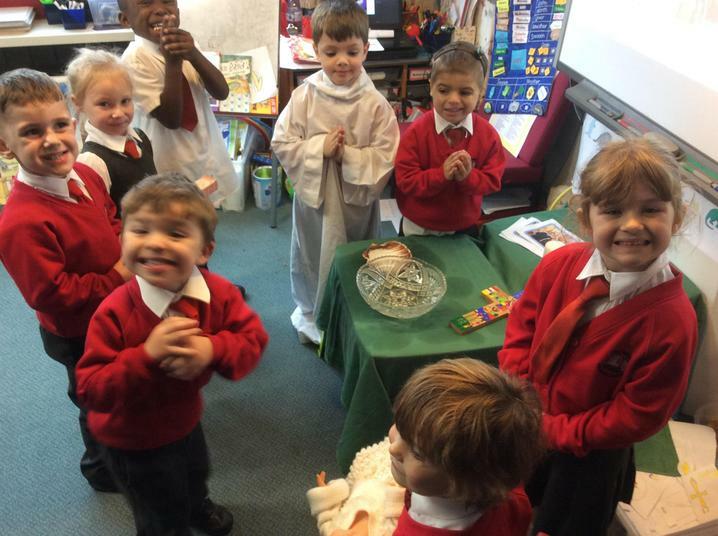 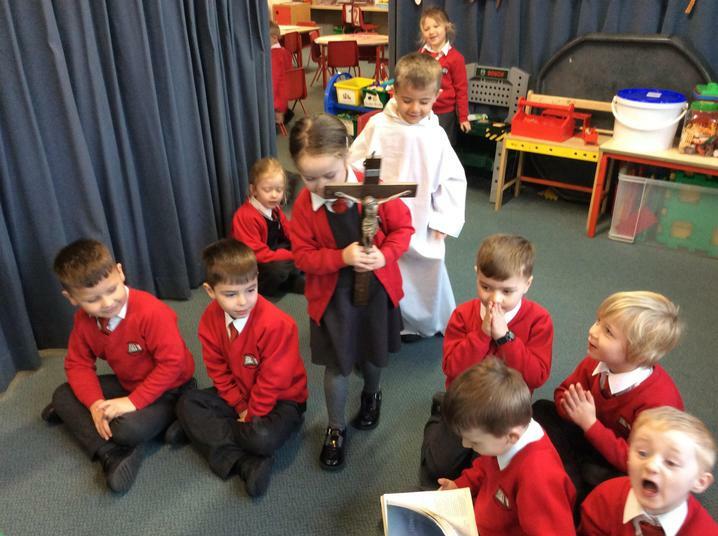 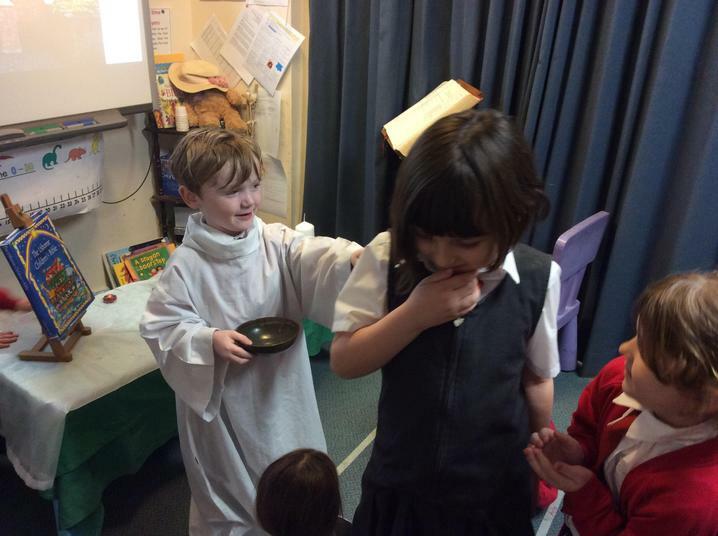 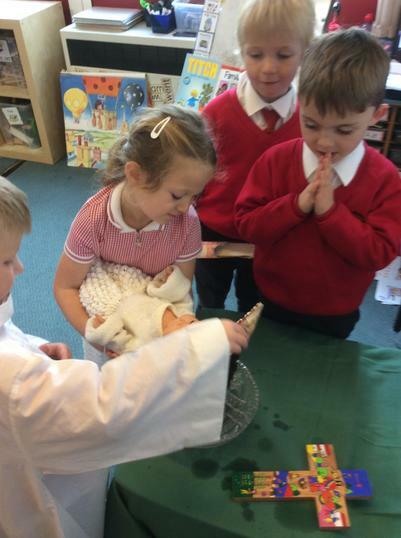 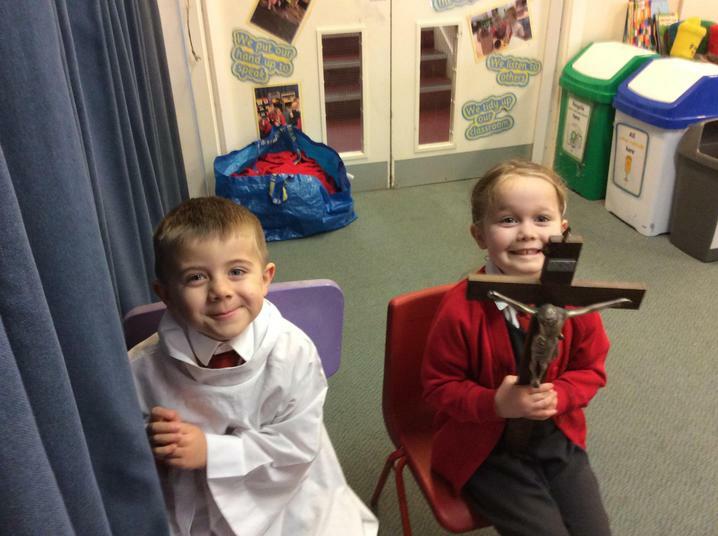 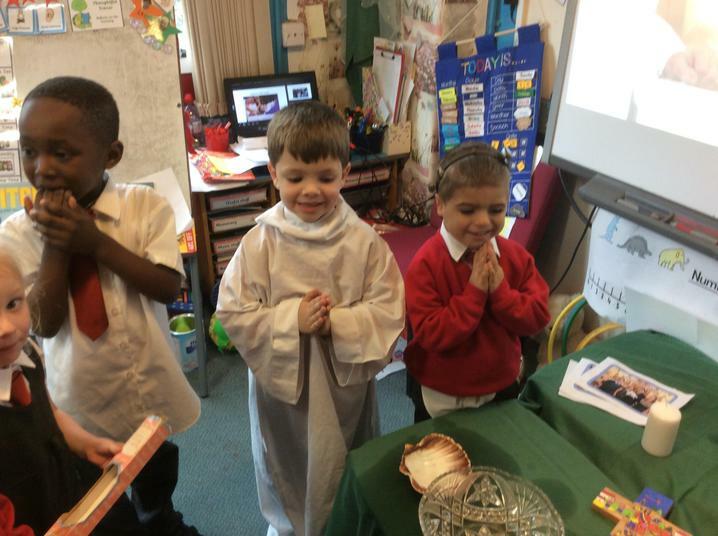 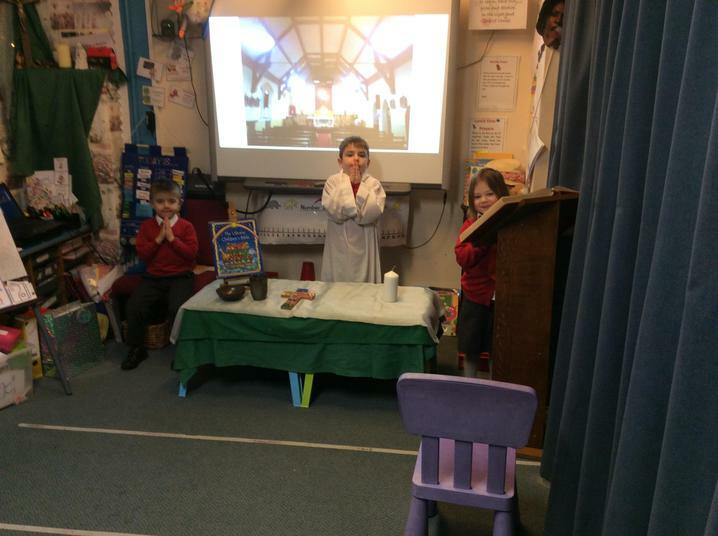 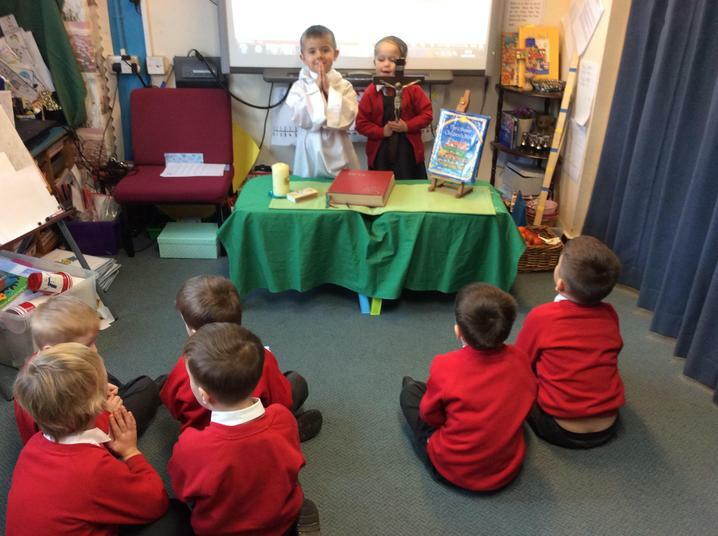 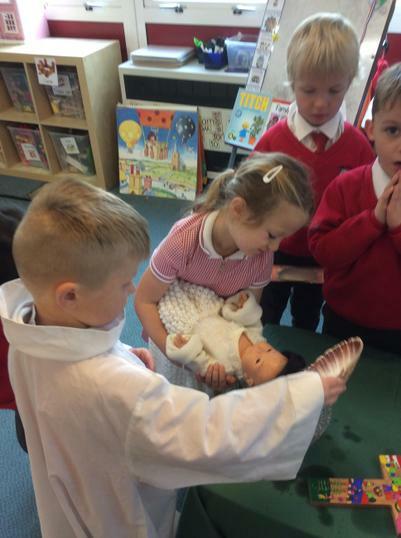 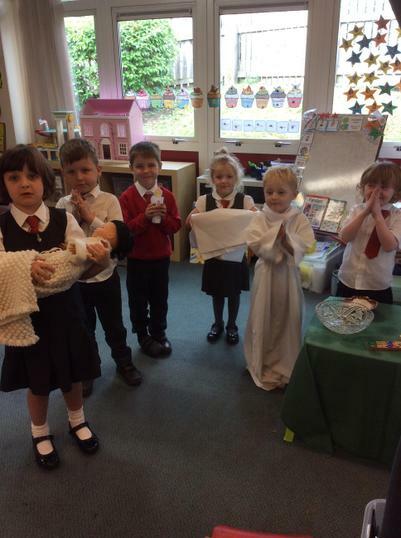 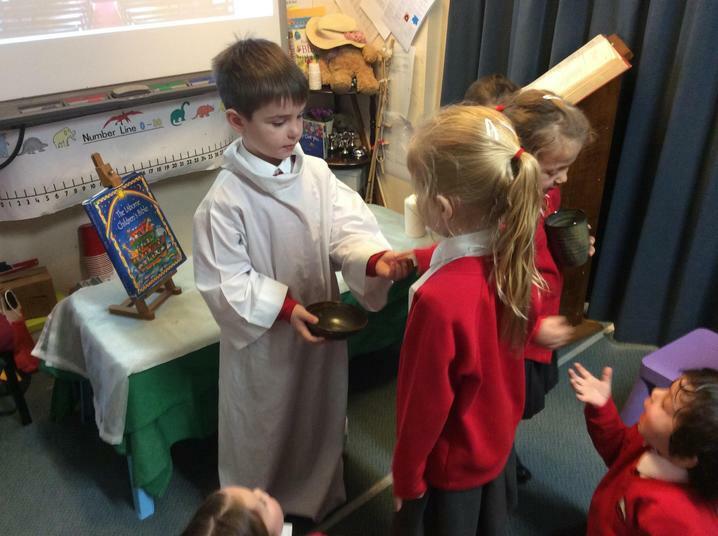 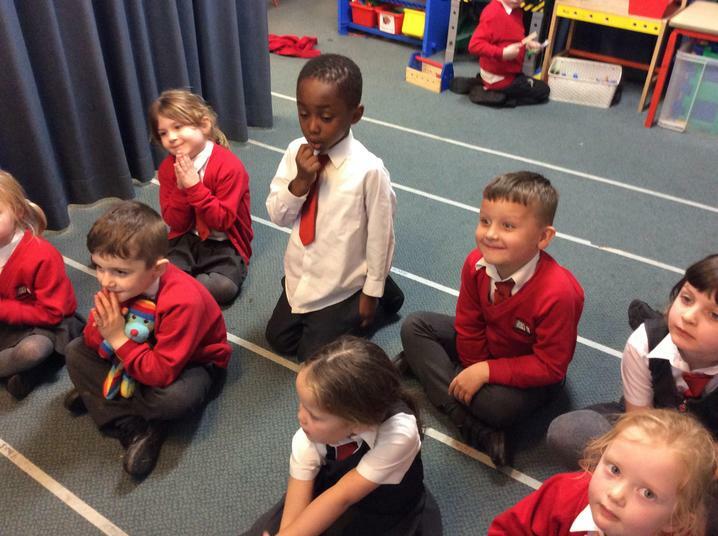 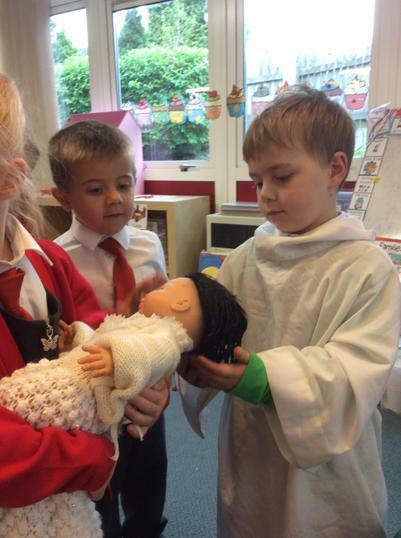 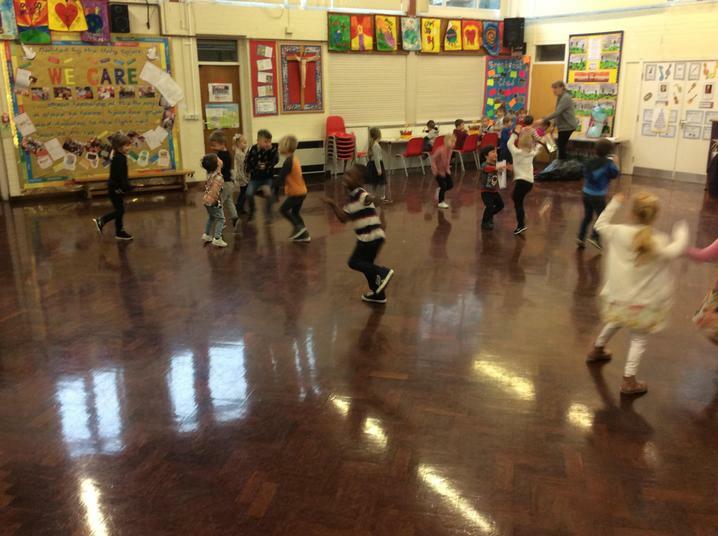 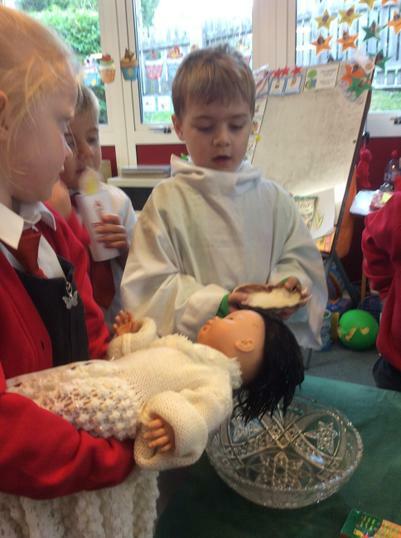 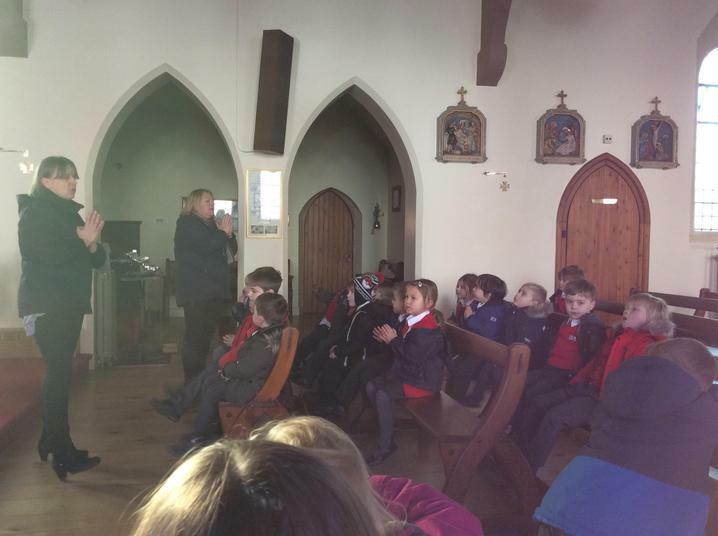 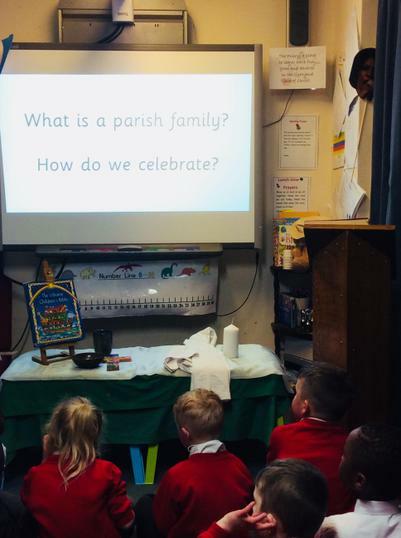 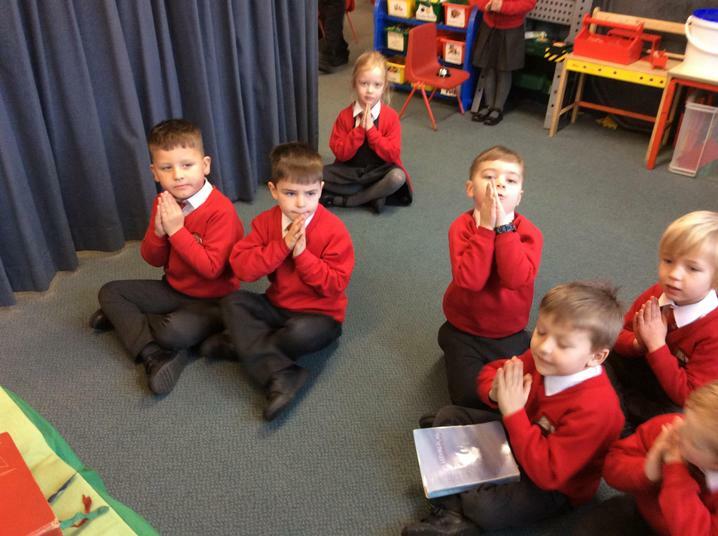 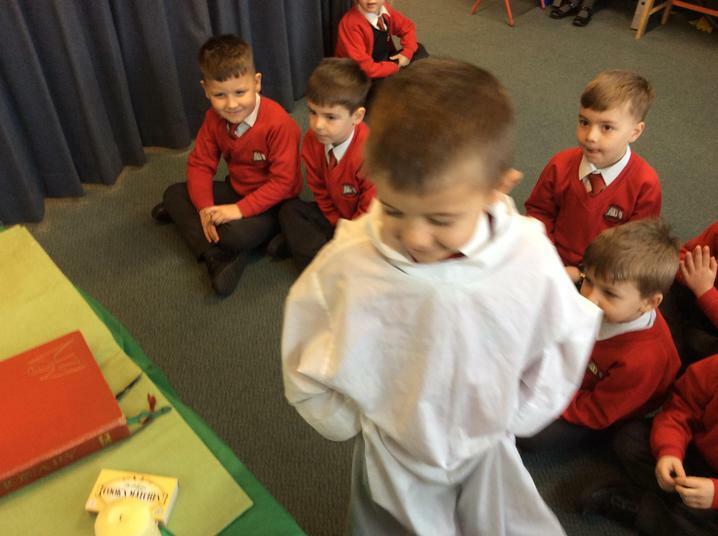 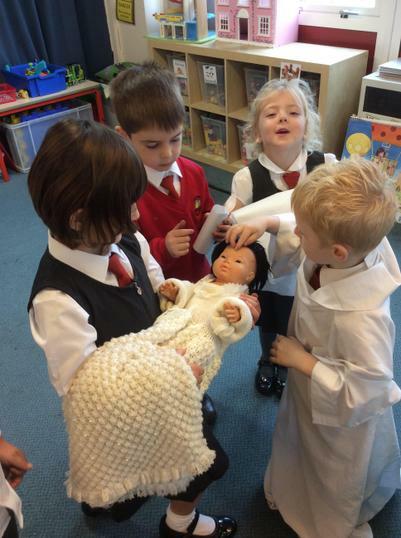 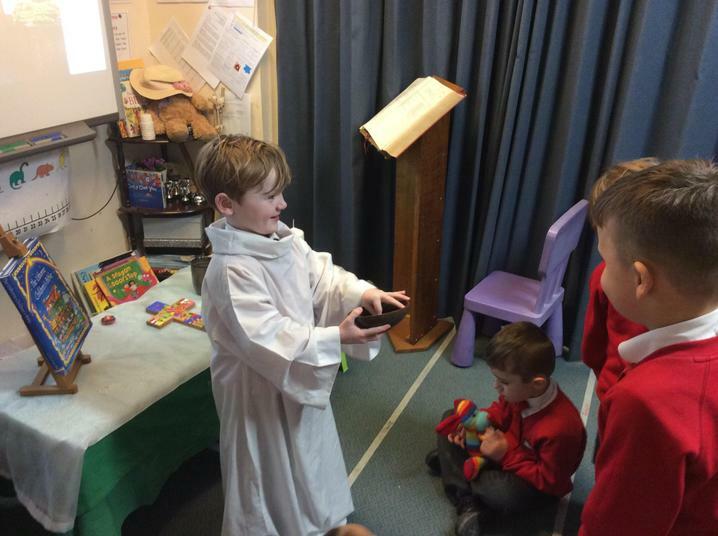 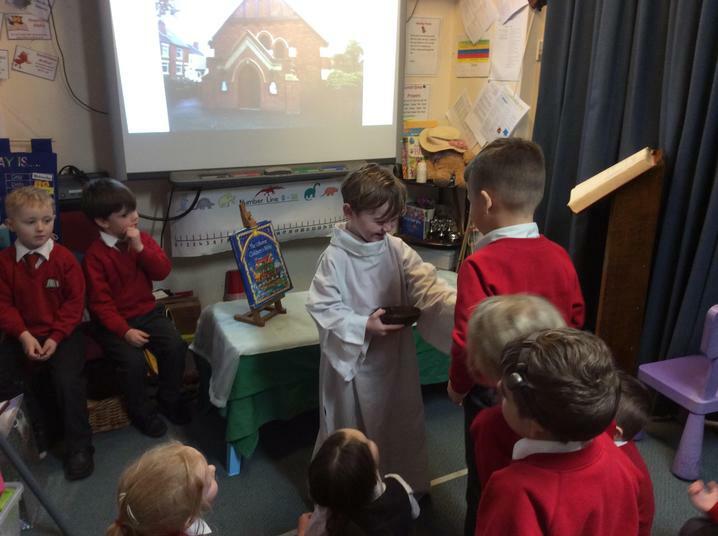 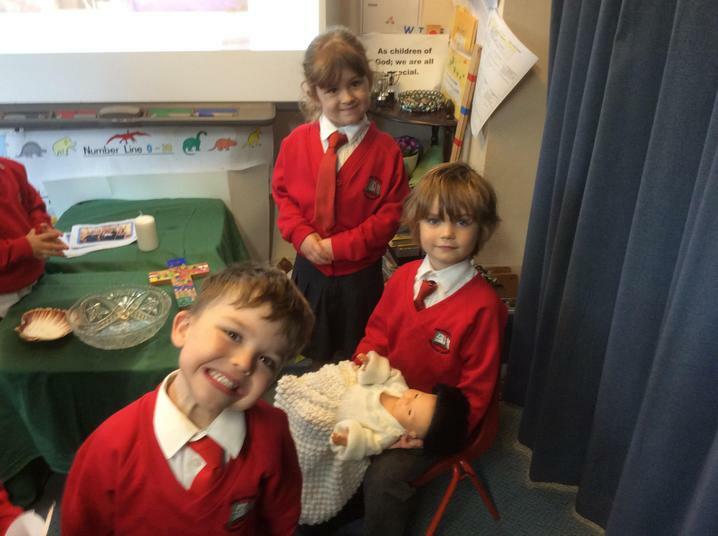 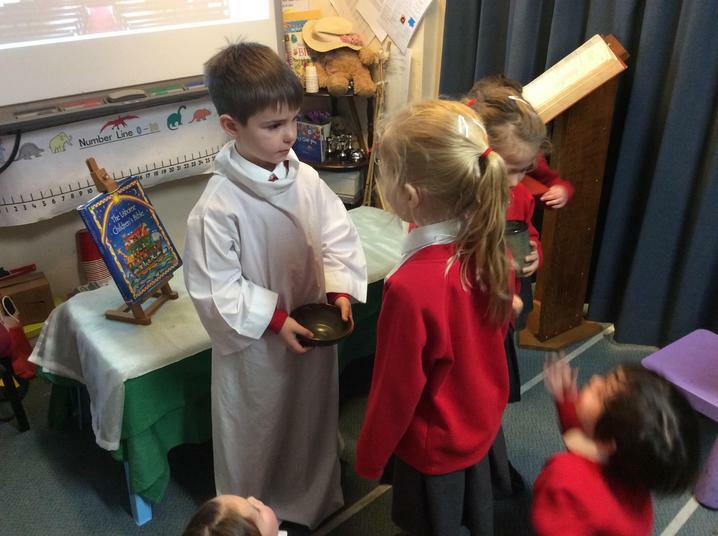 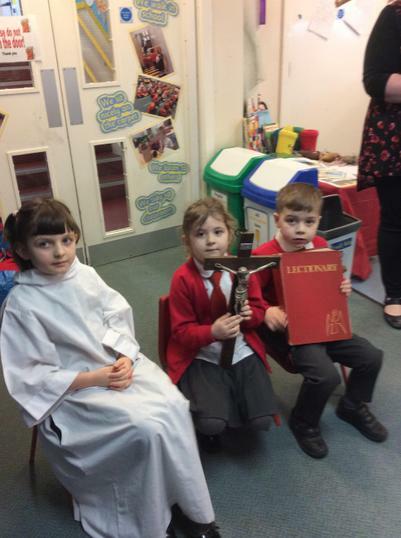 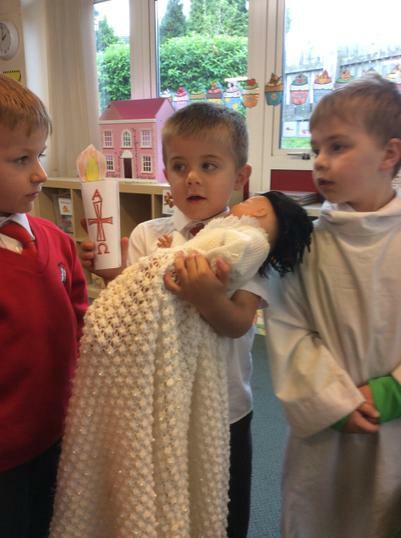 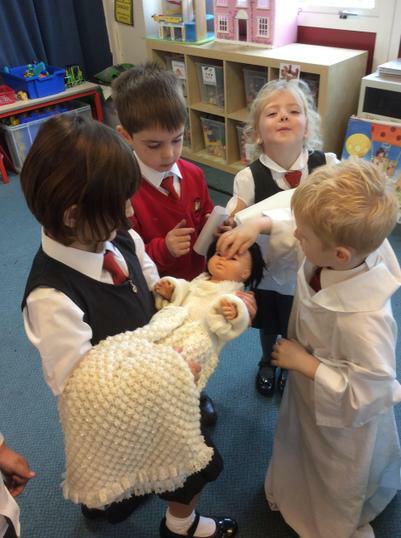 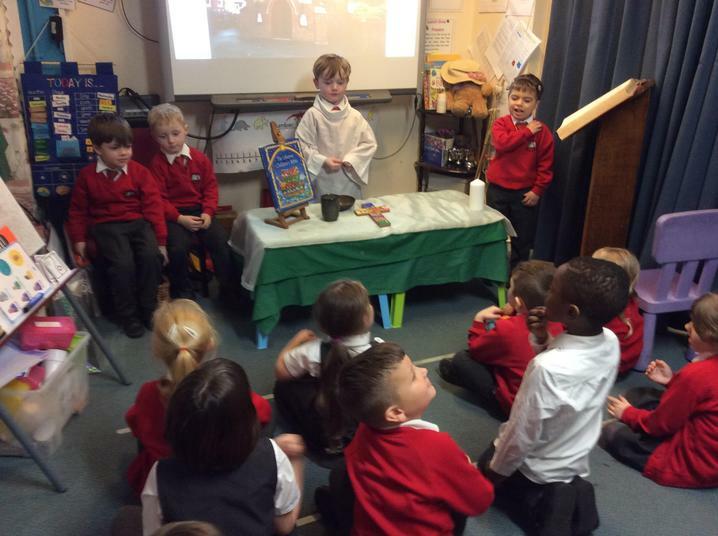 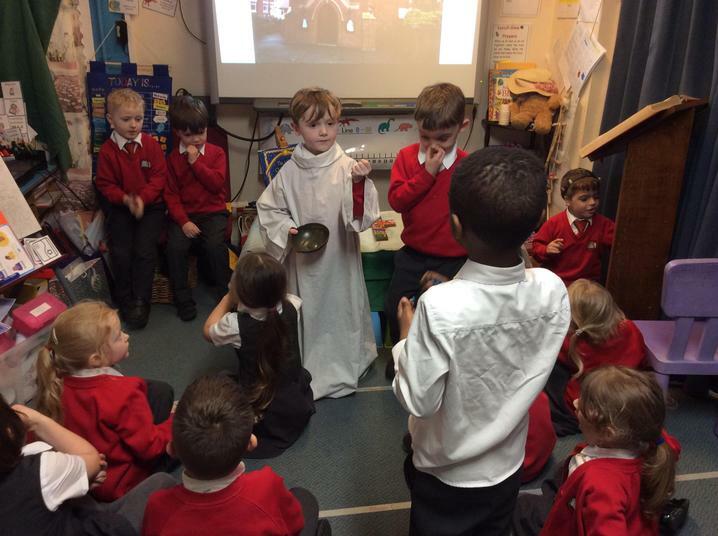 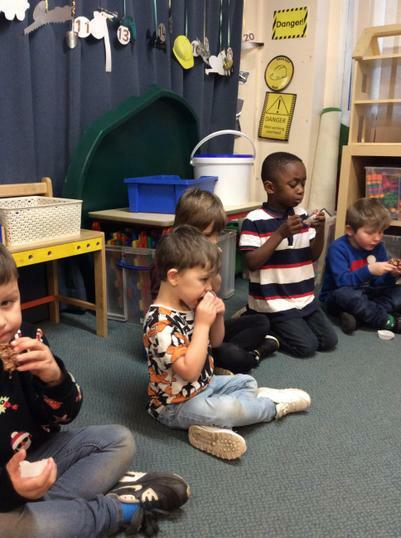 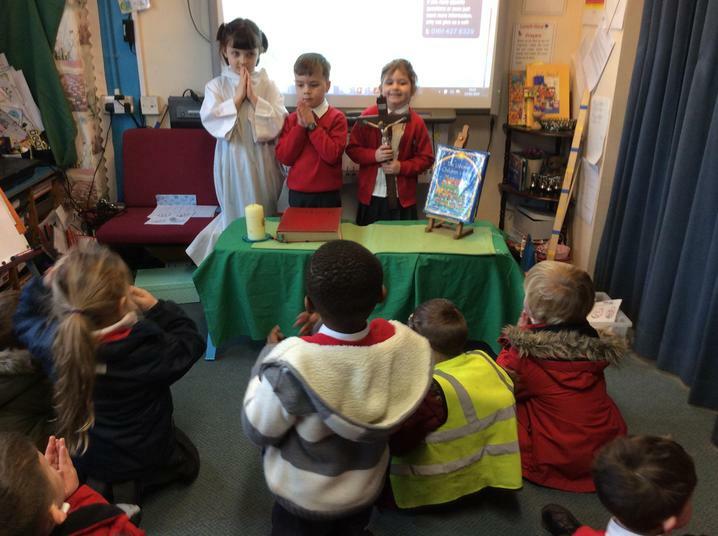 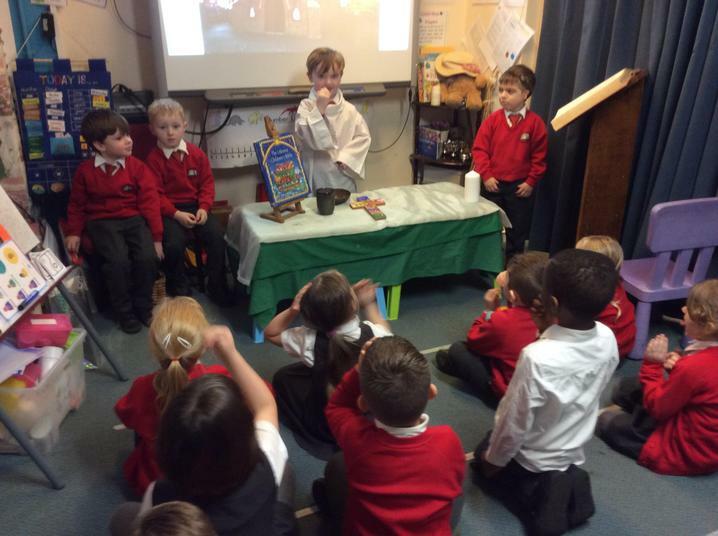 we had a lovely final class worship singing 'the love of God is very wonderful' with lots of actions - look what we have learned. 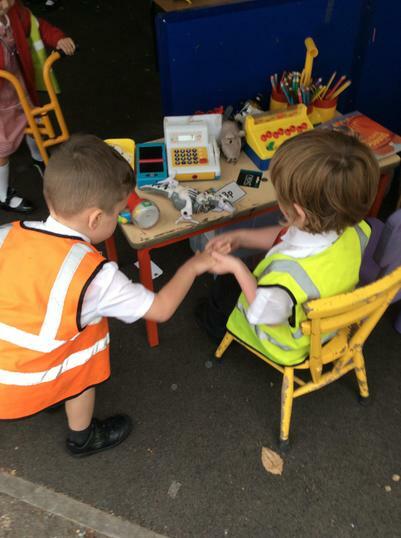 What does it mean to welcome others? 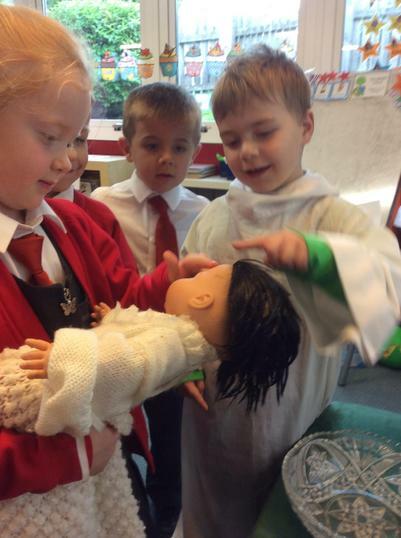 What do you know about Baptism? 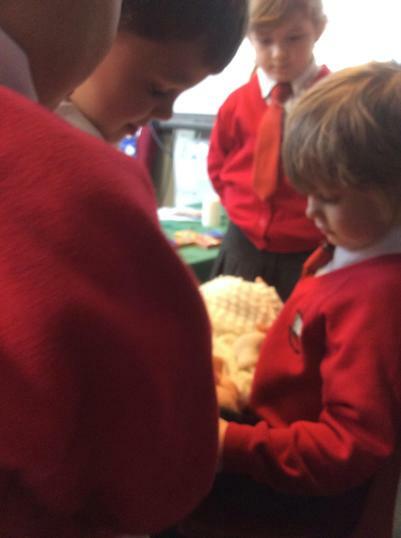 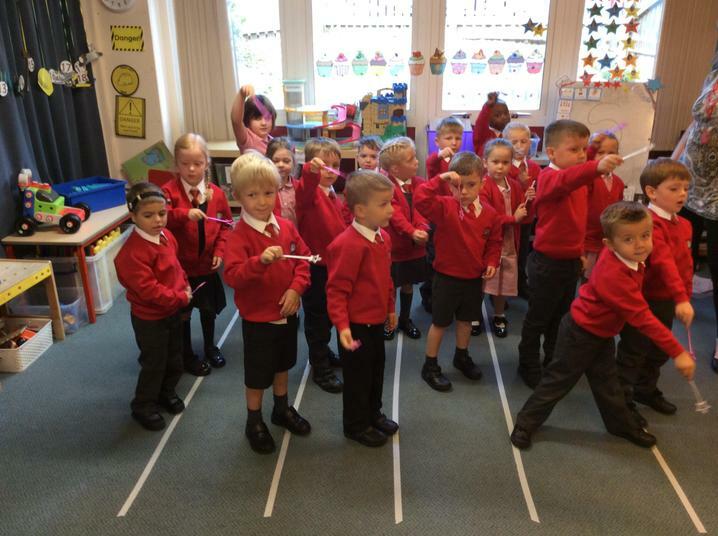 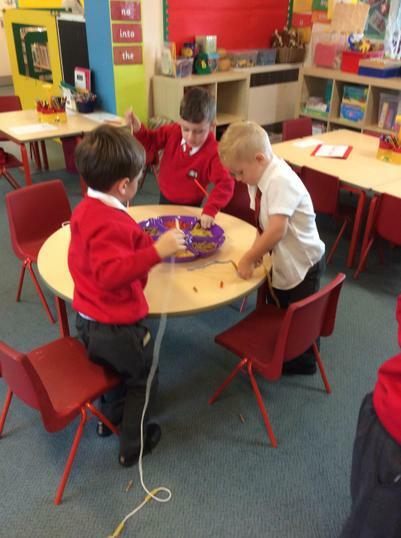 Funnybones, making skeletons, learning about our bones, measuring and comparing body sizes. 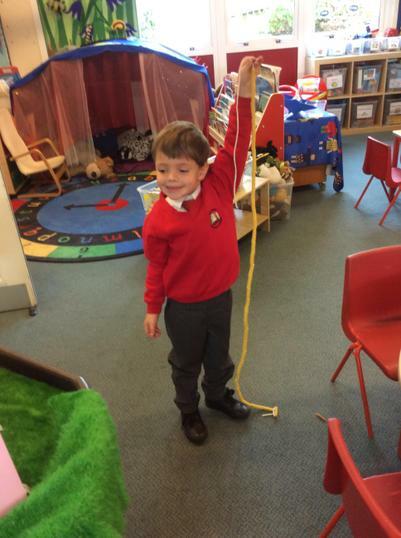 How long is your arm? 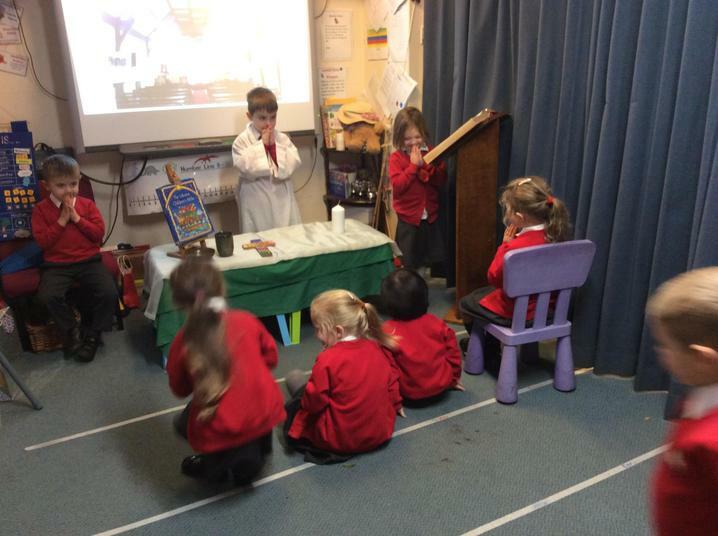 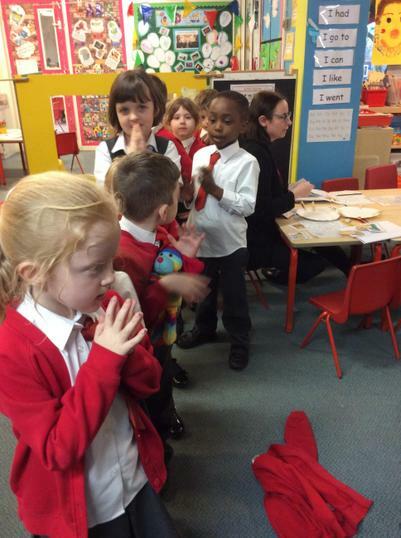 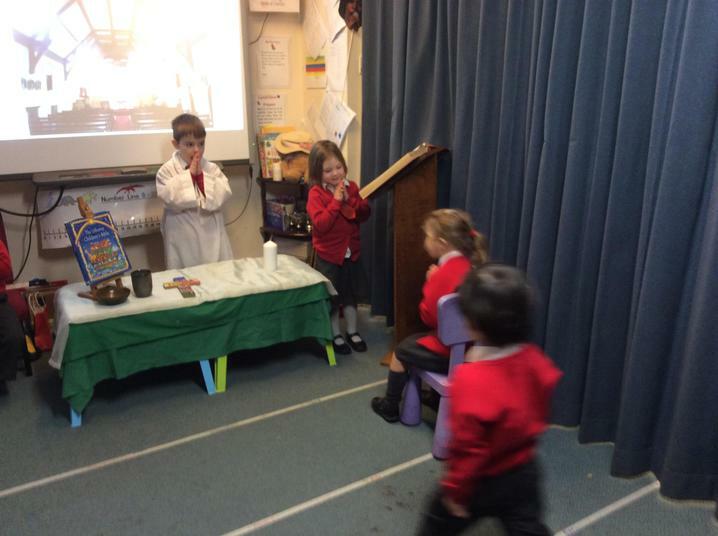 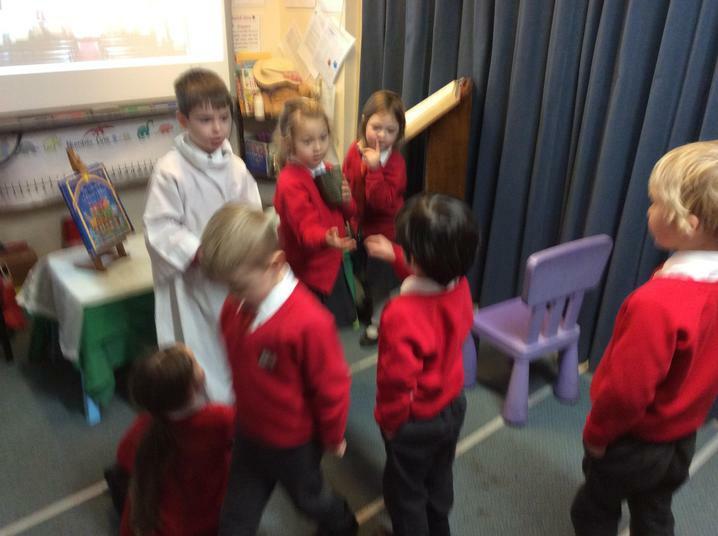 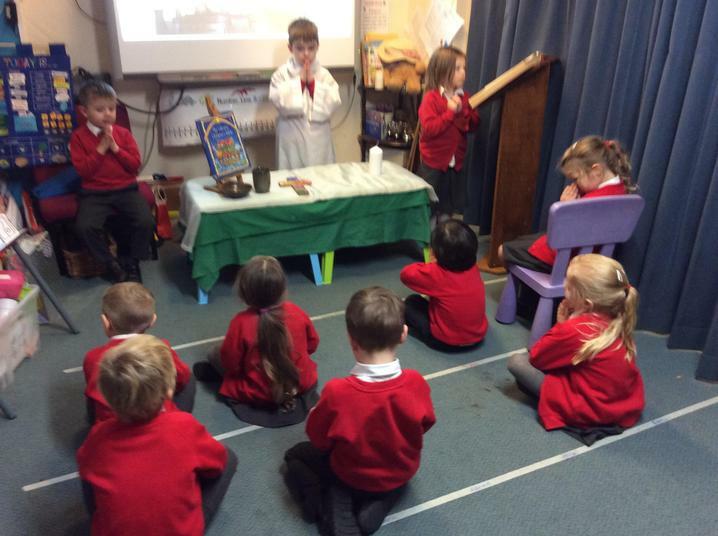 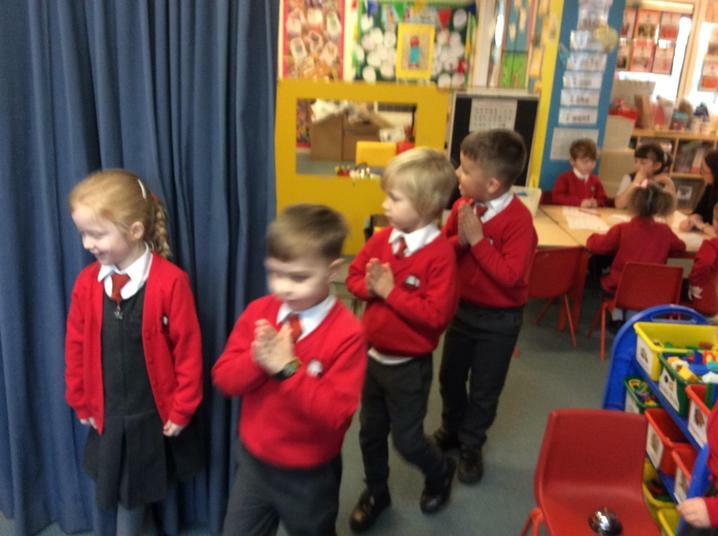 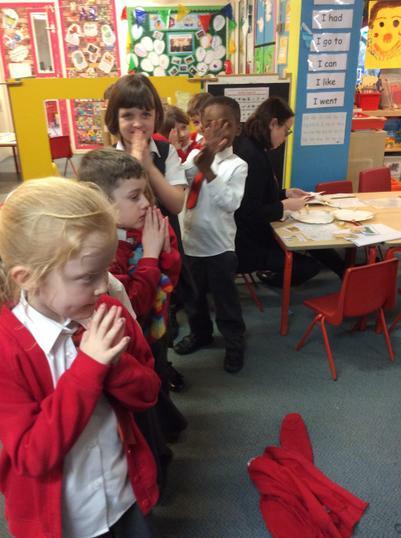 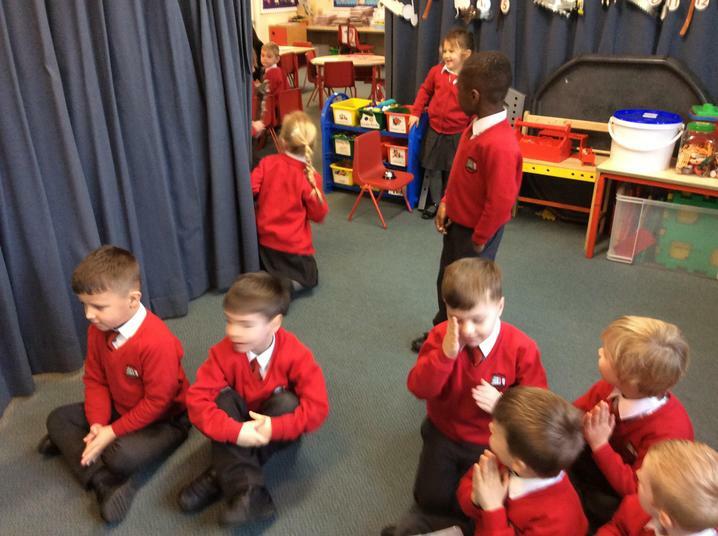 Class Worship - God knows our name. 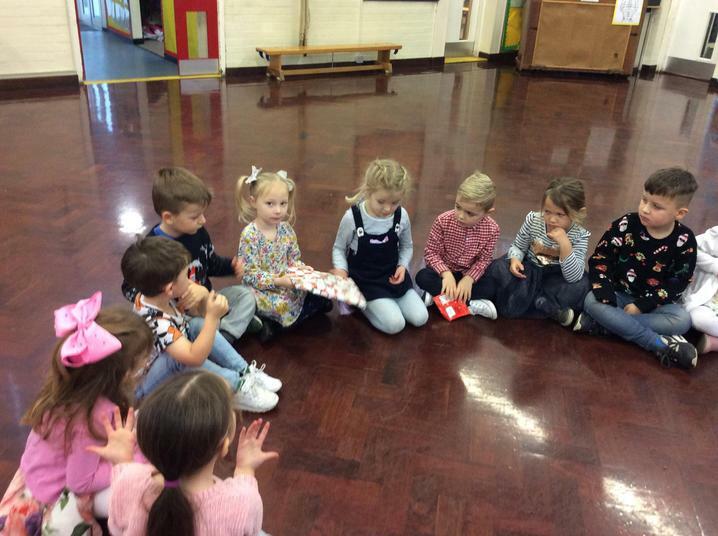 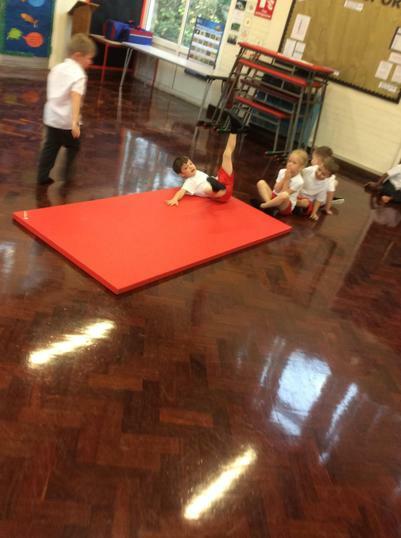 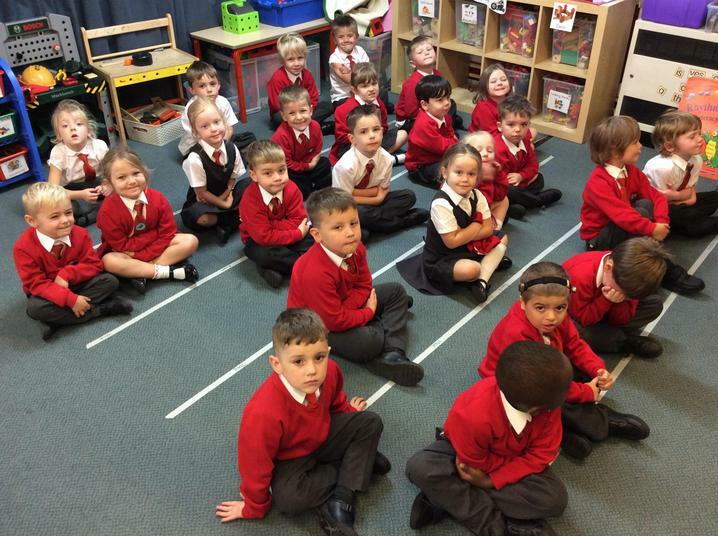 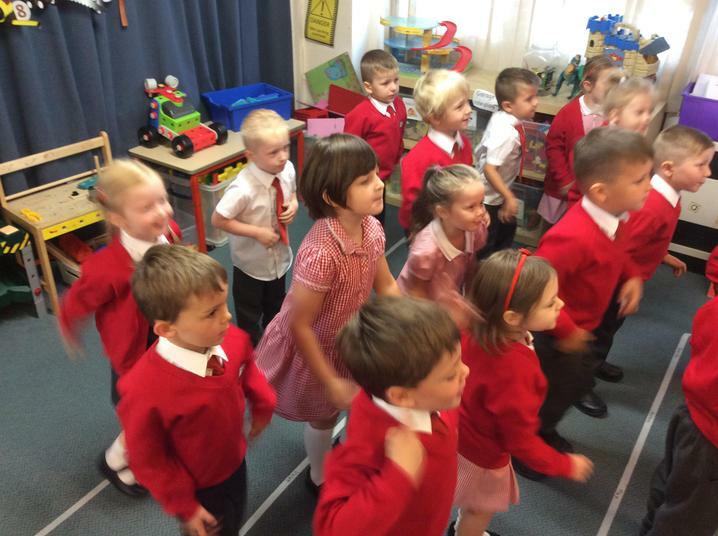 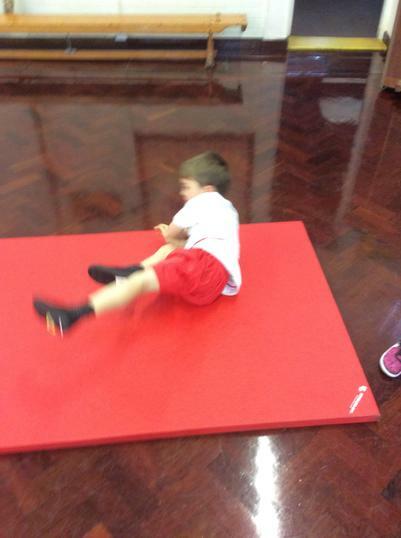 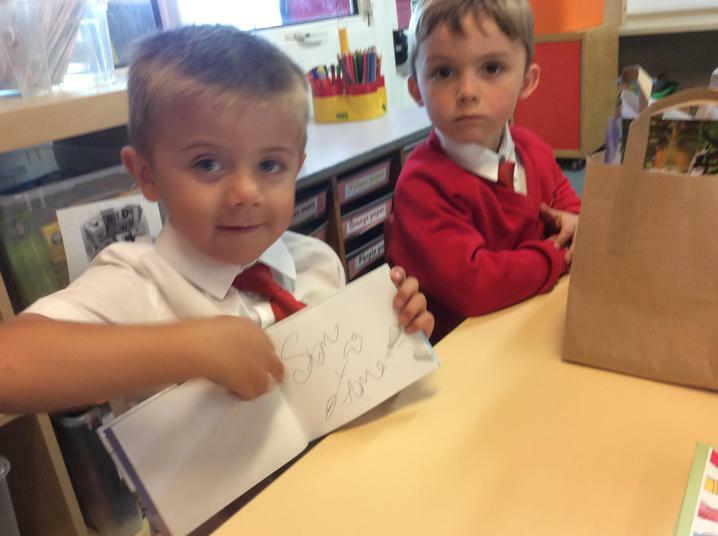 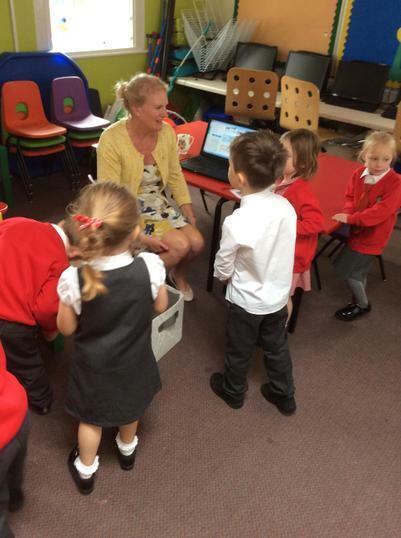 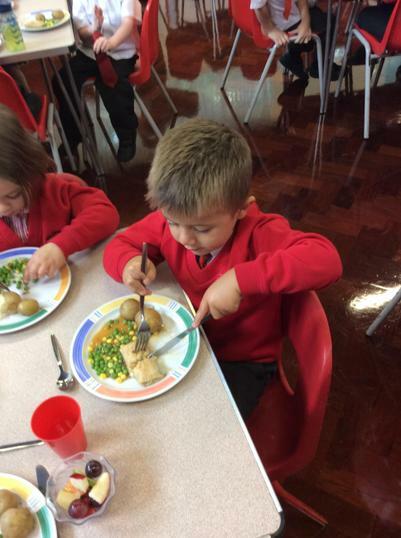 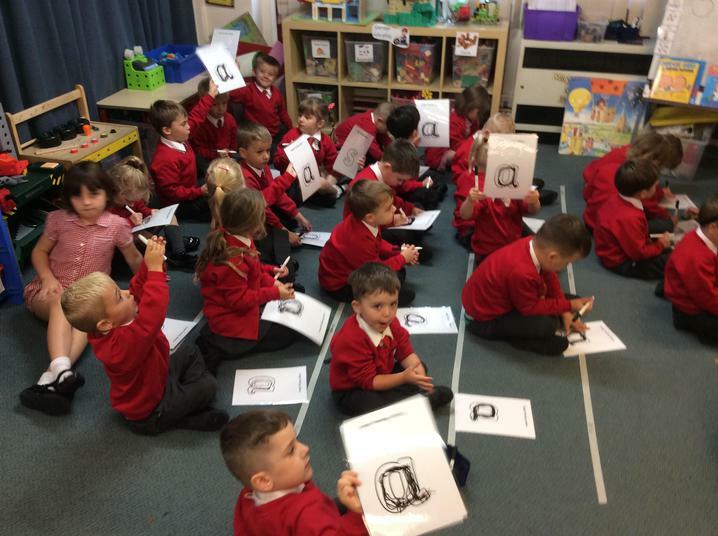 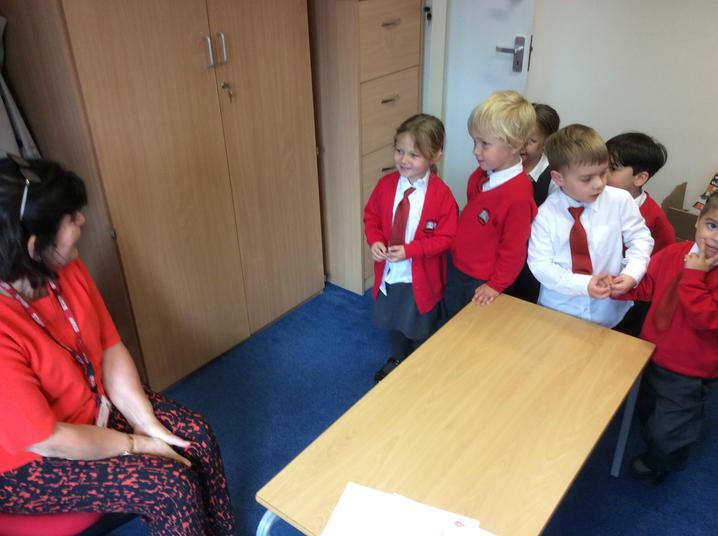 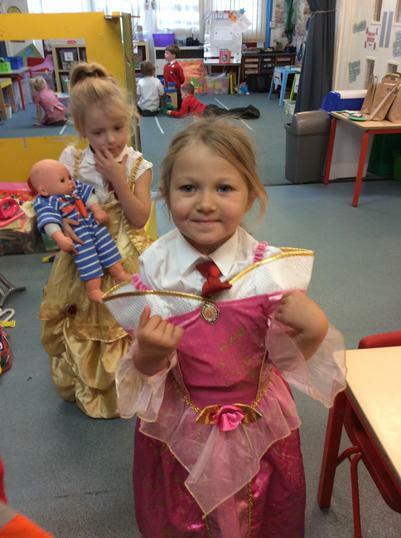 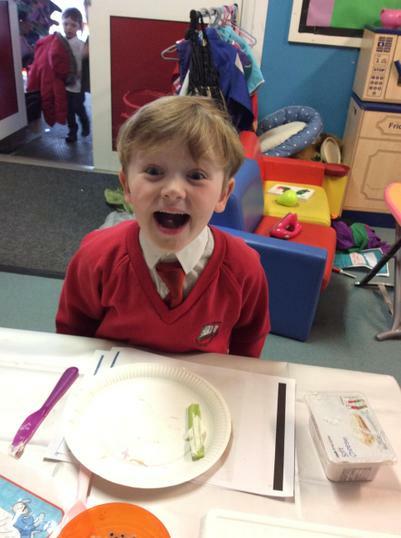 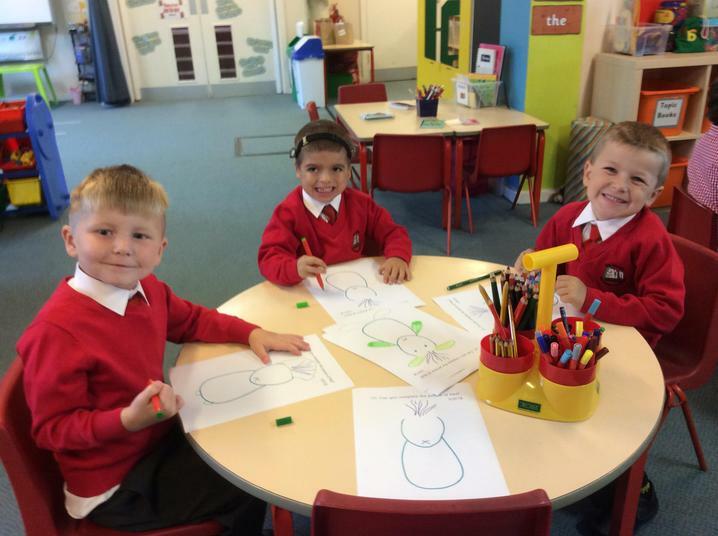 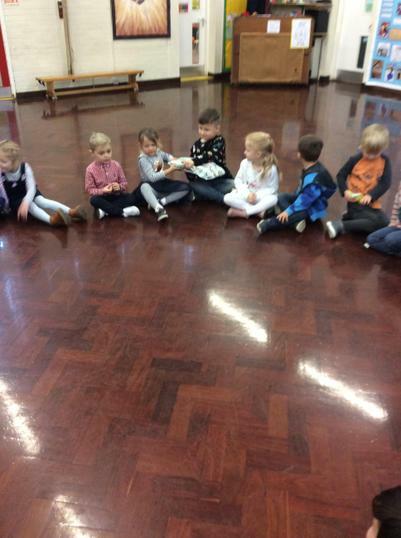 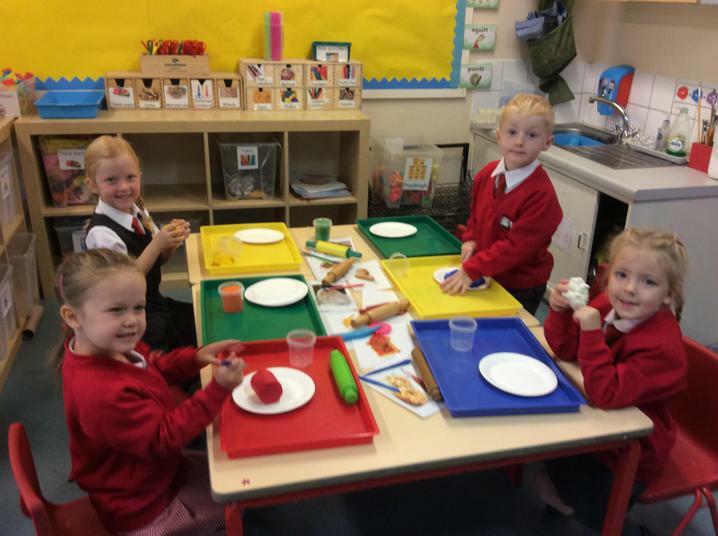 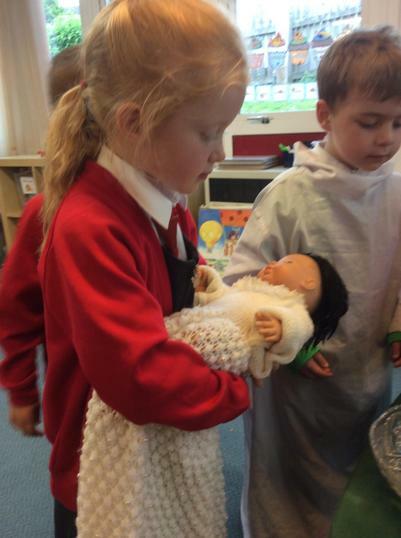 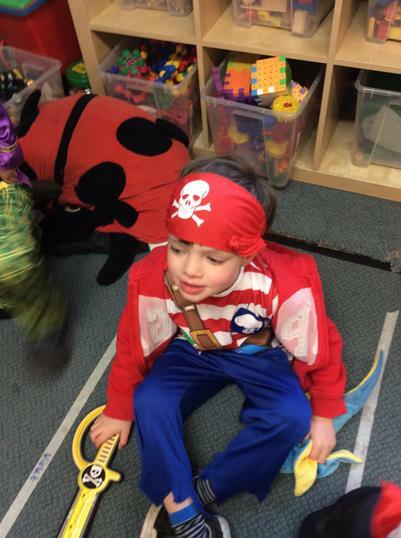 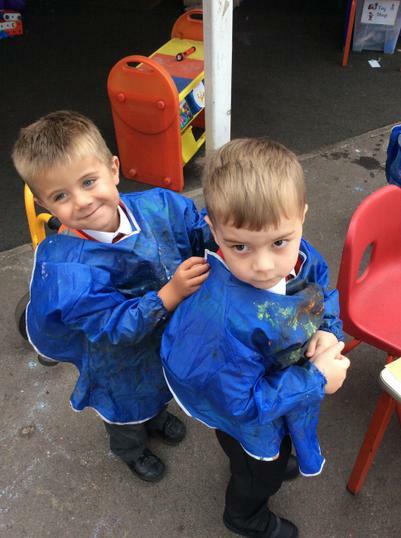 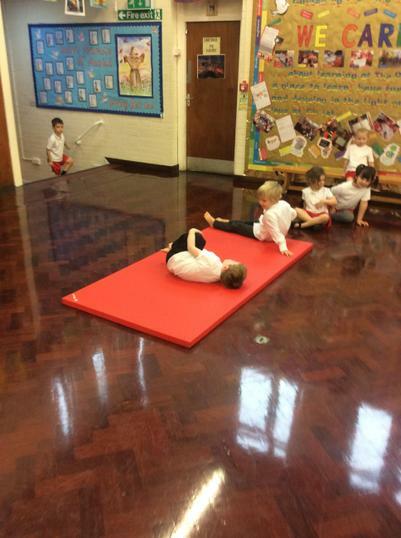 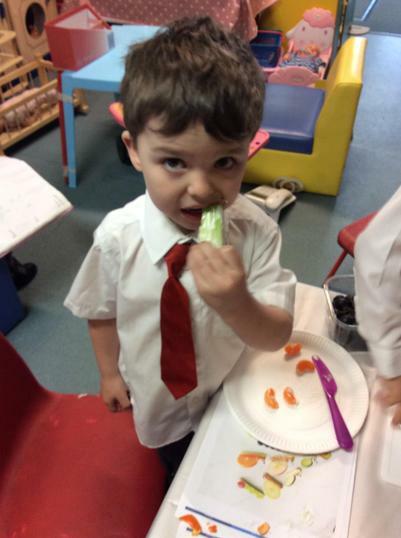 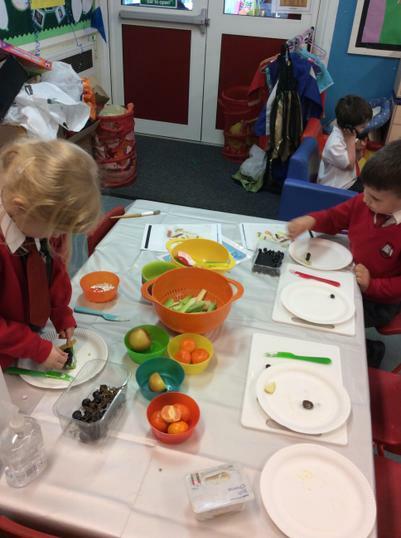 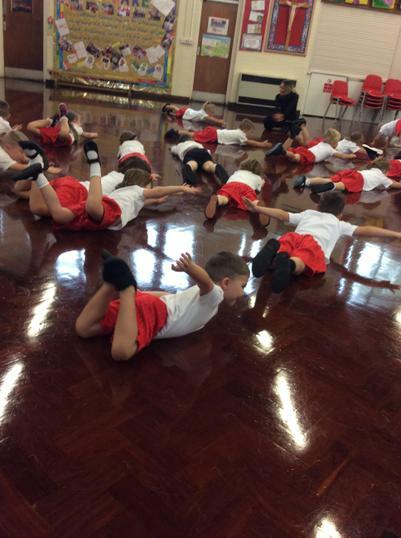 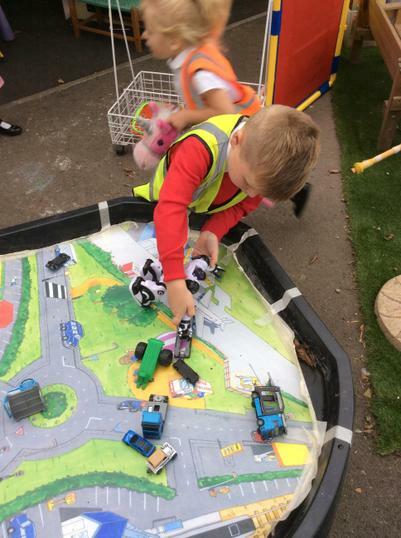 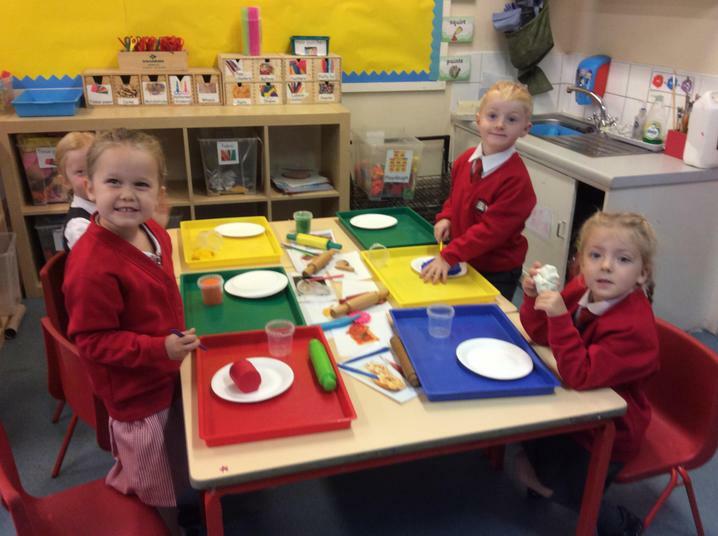 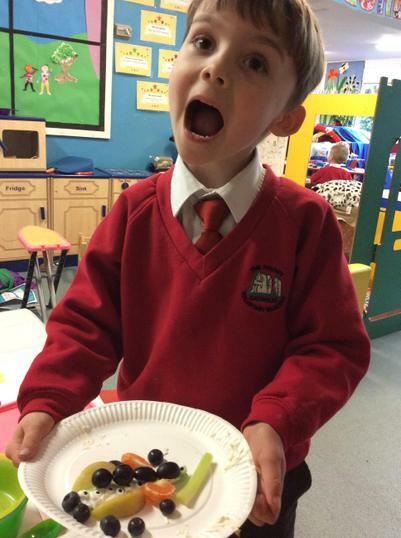 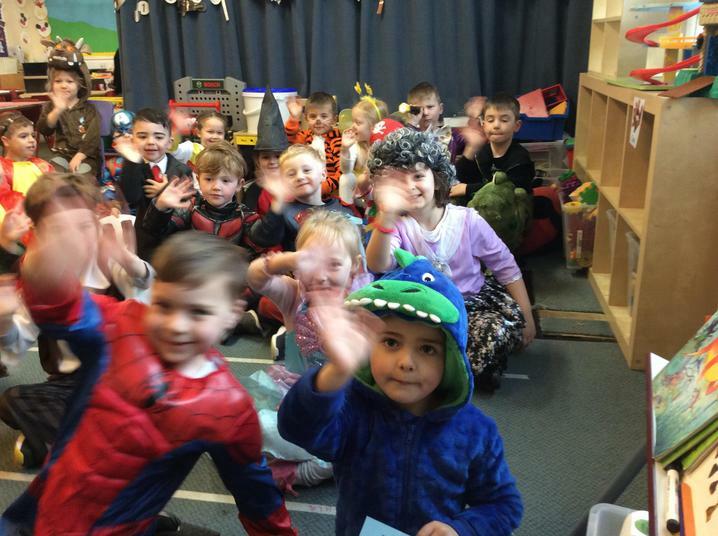 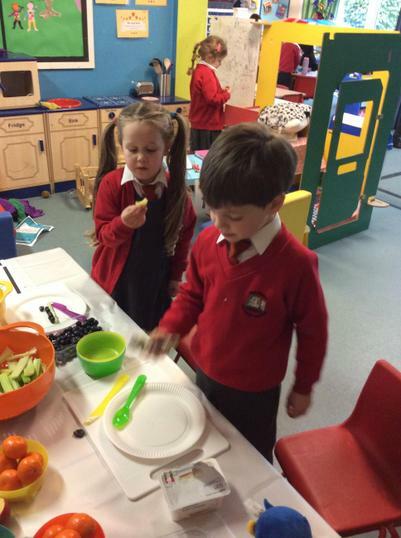 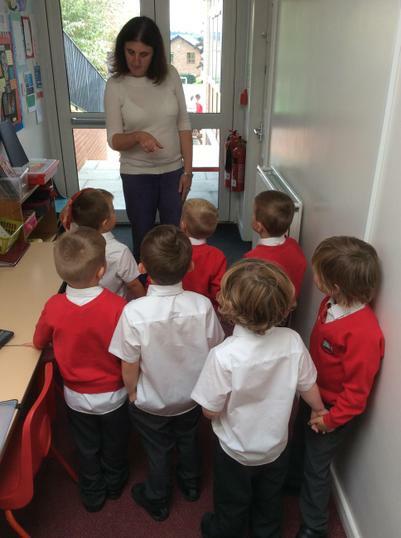 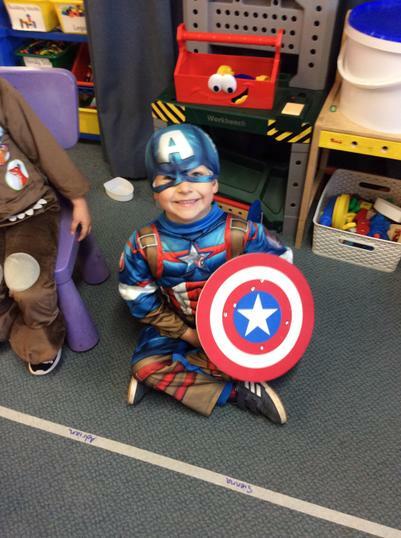 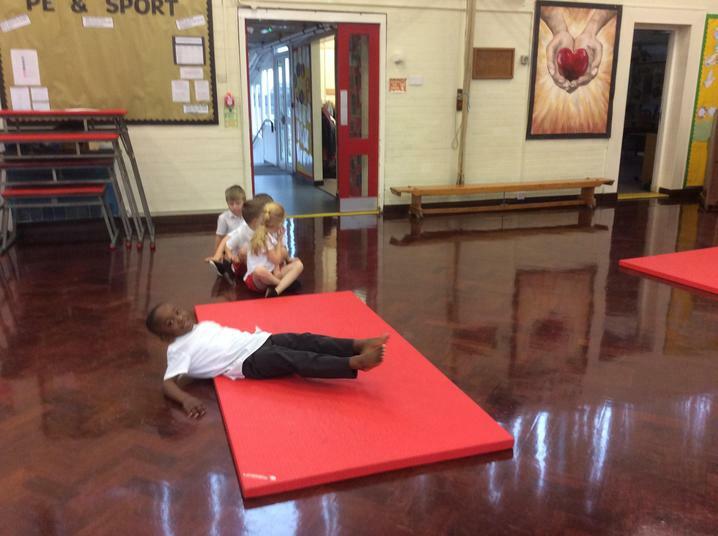 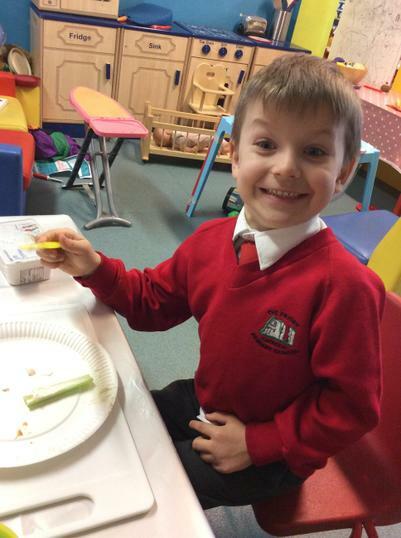 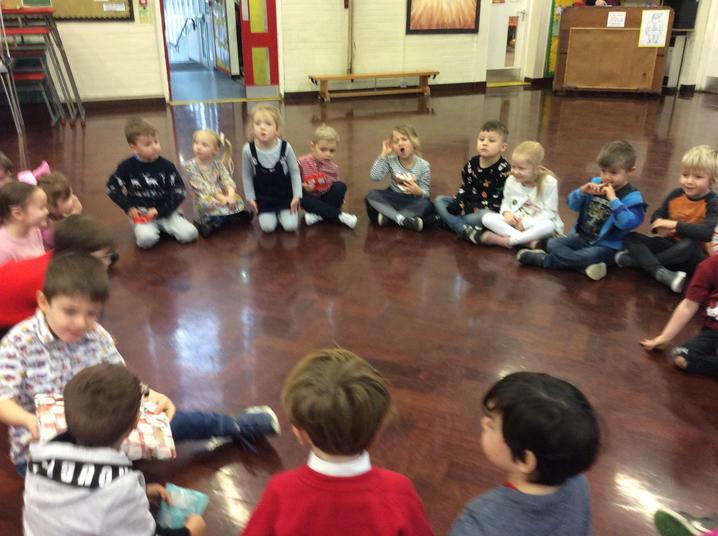 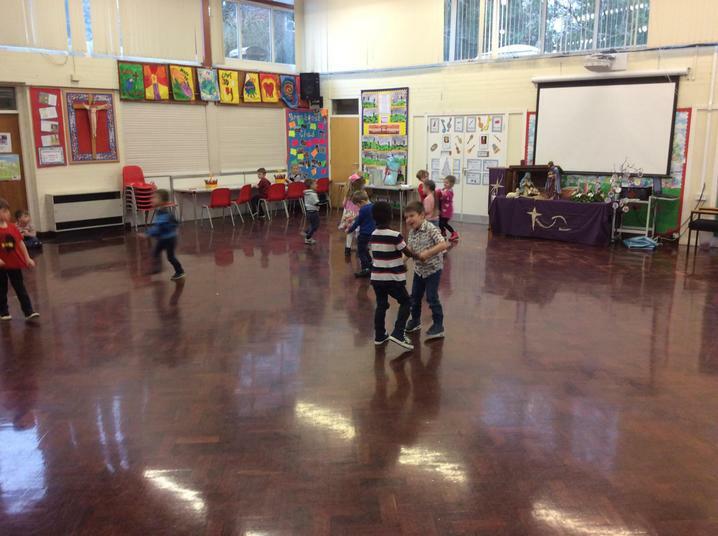 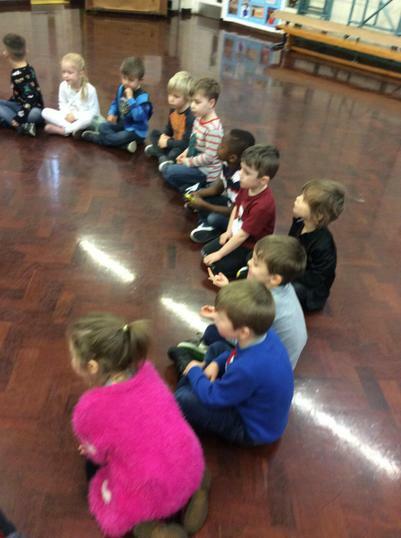 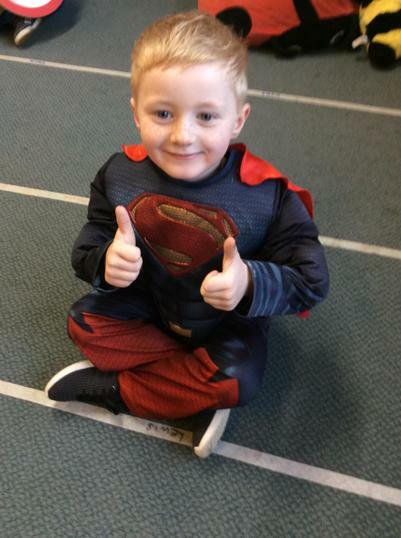 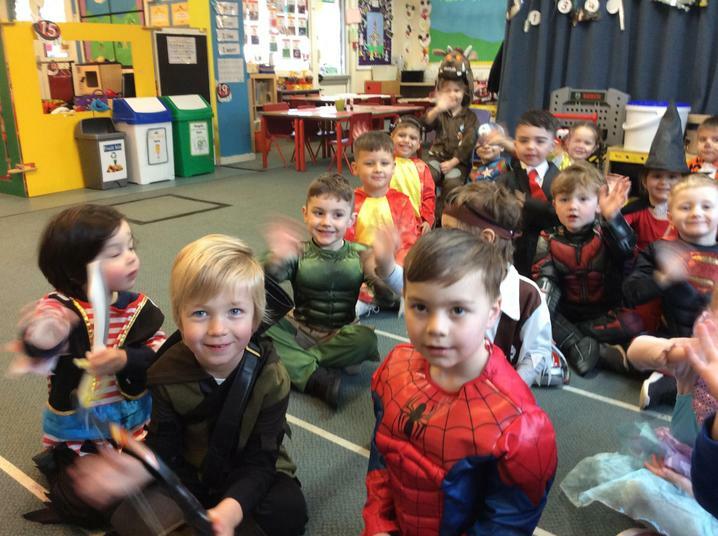 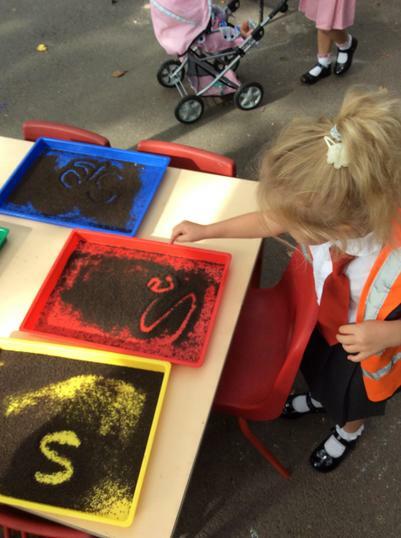 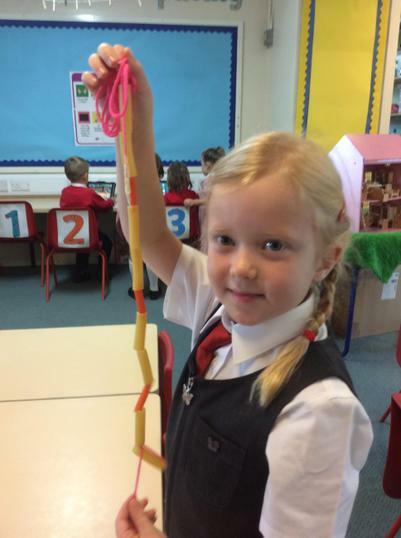 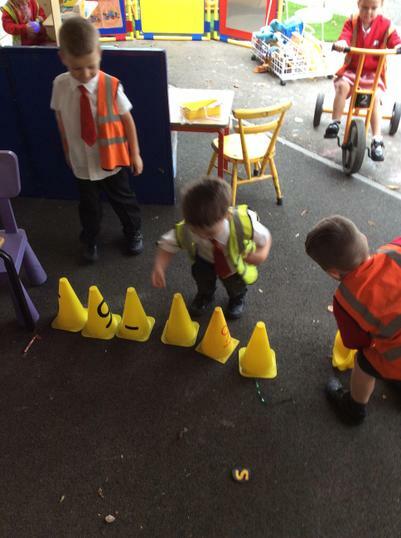 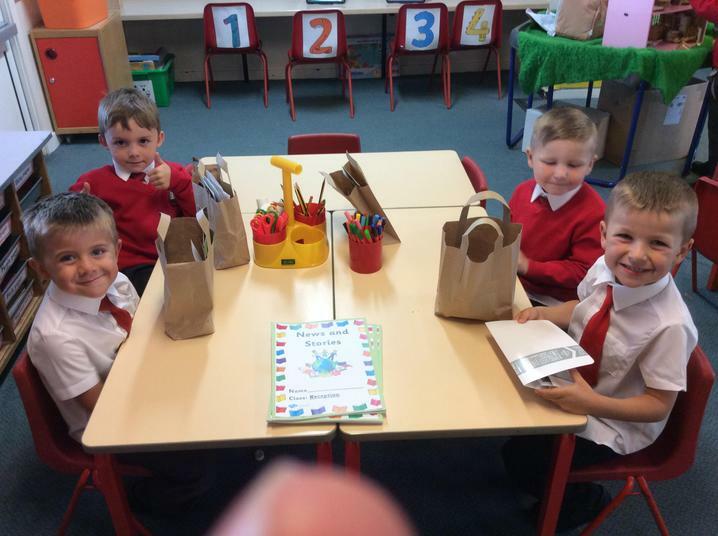 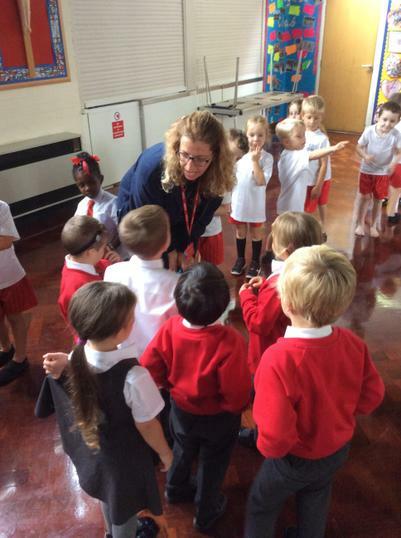 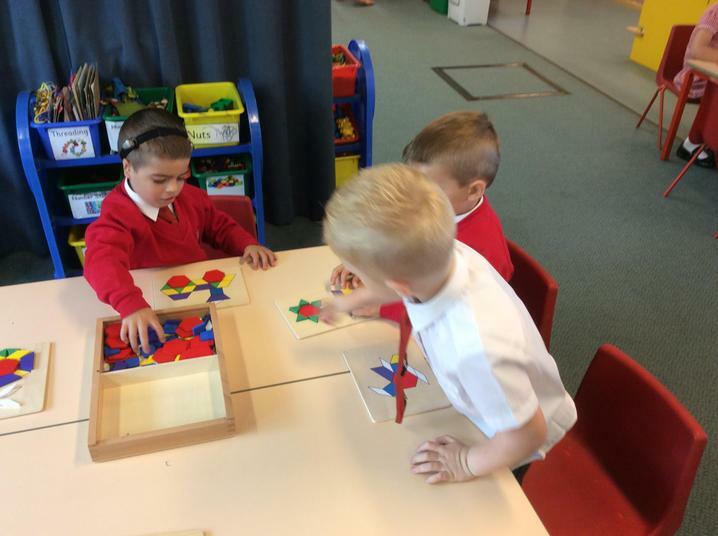 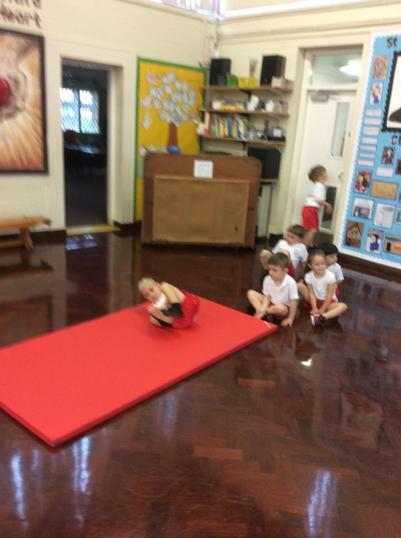 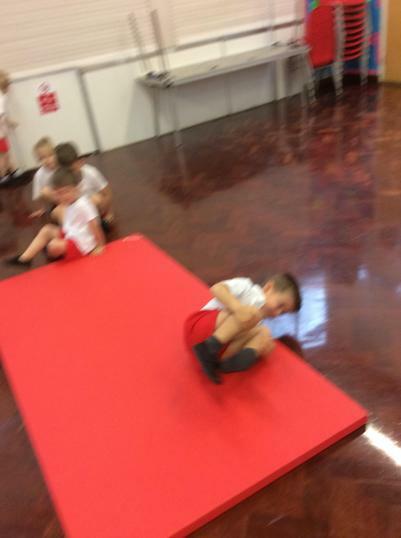 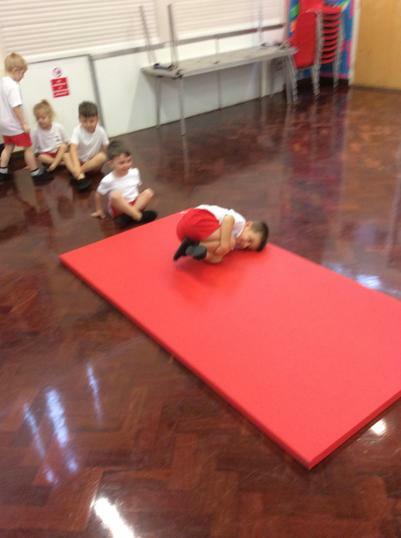 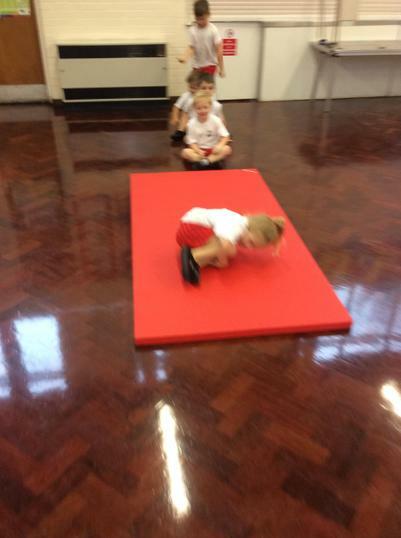 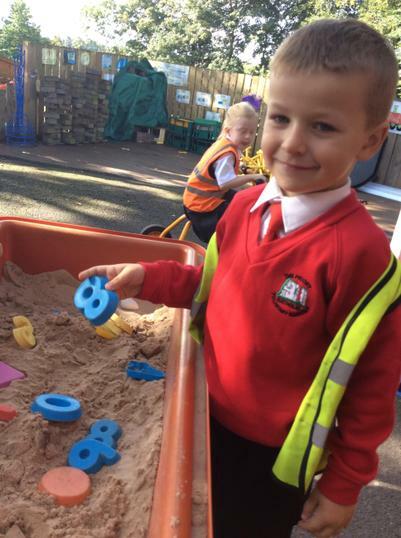 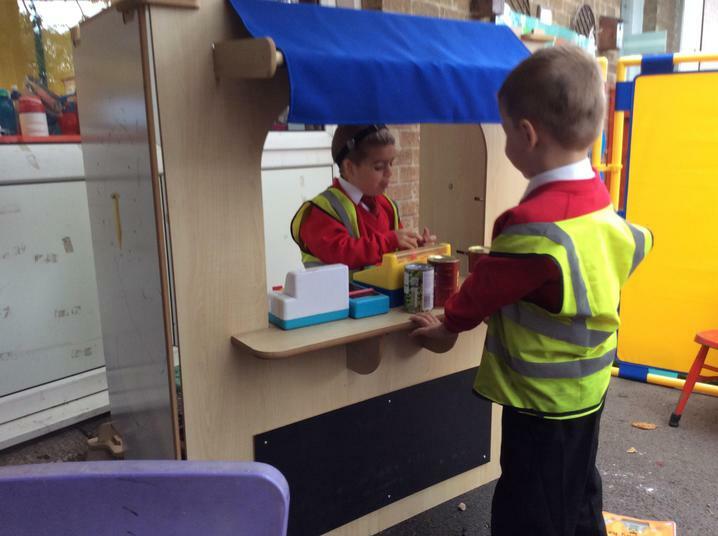 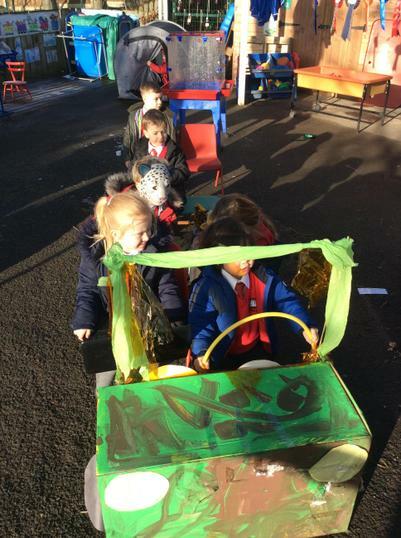 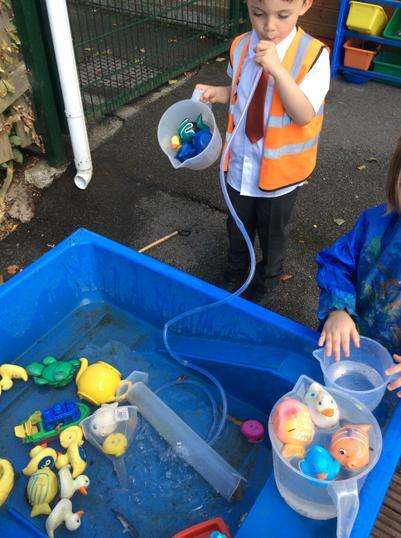 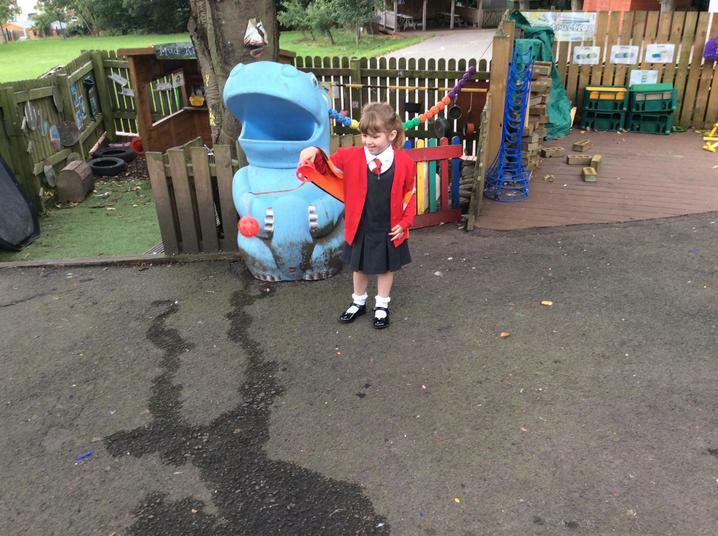 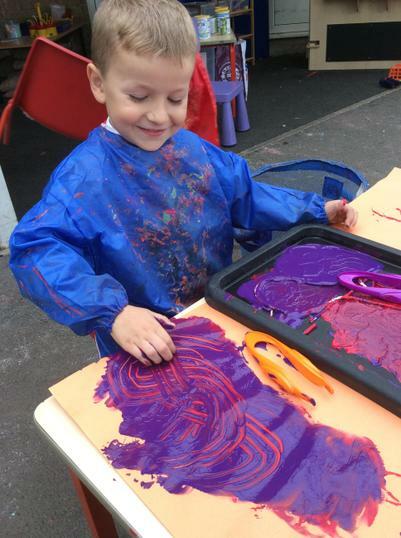 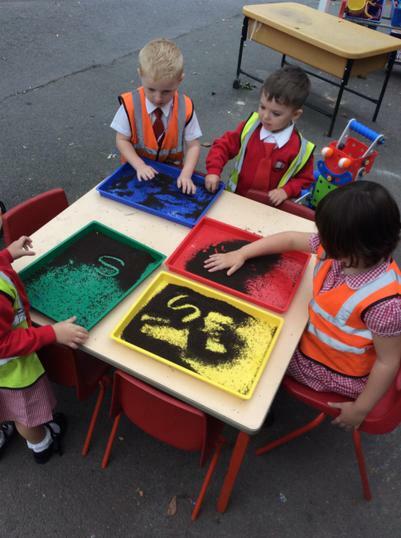 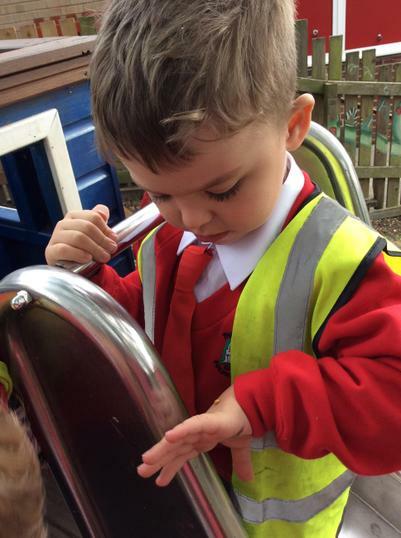 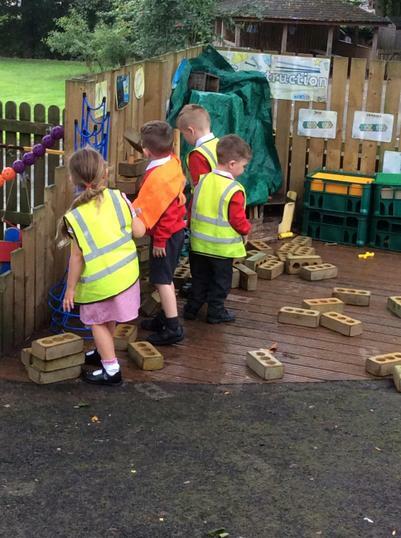 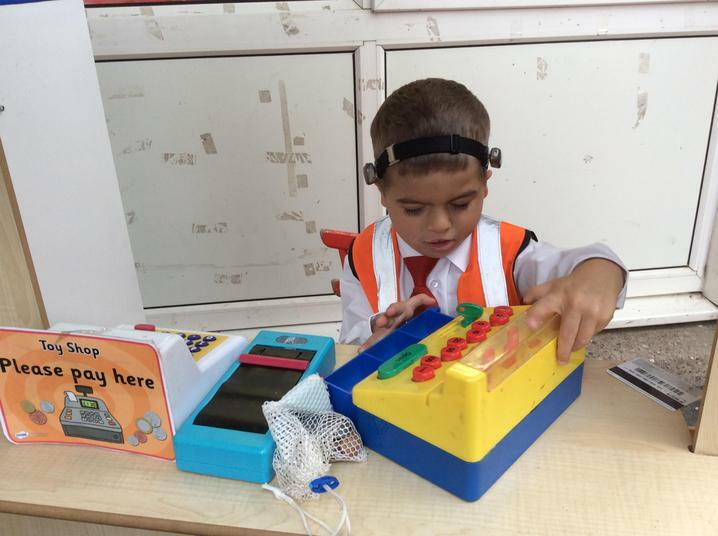 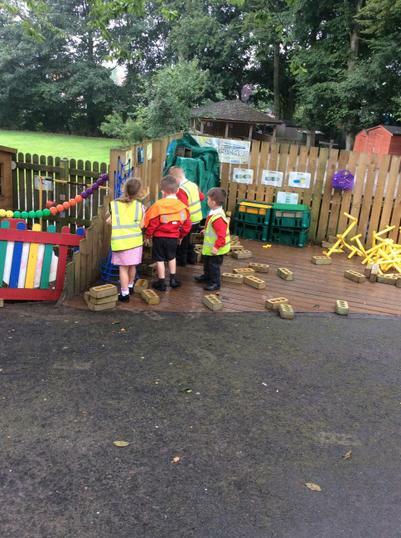 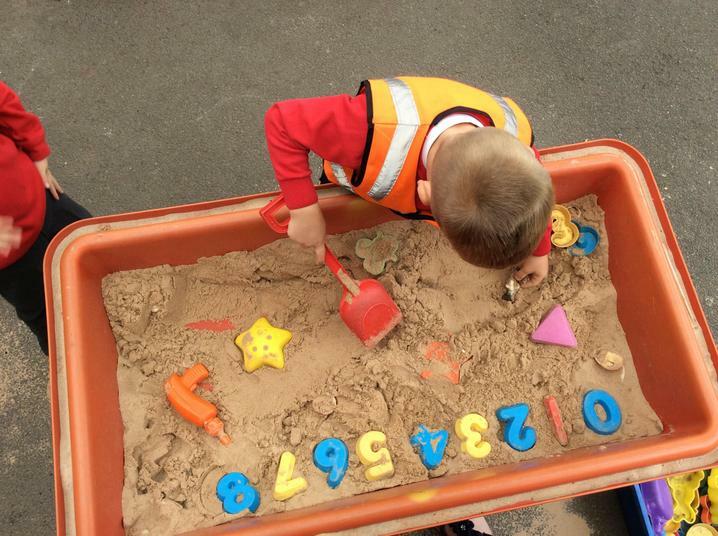 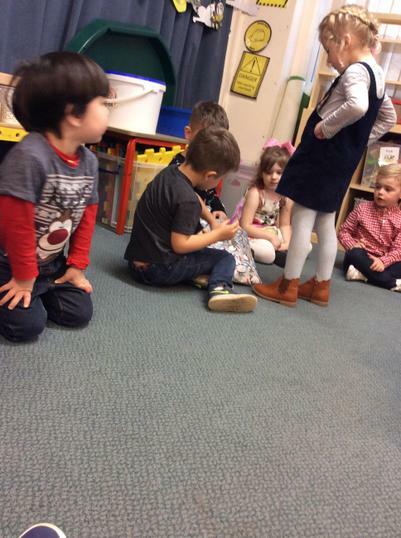 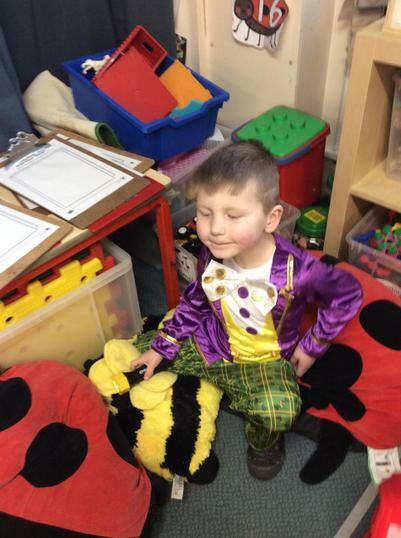 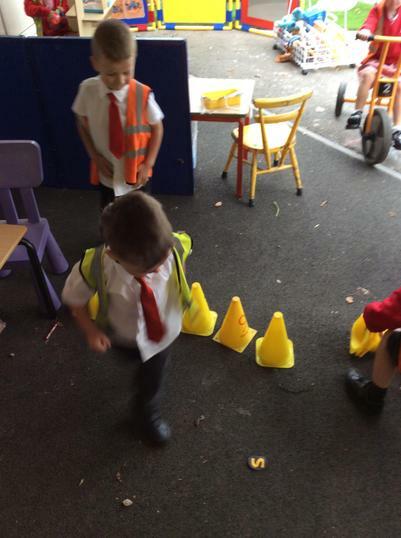 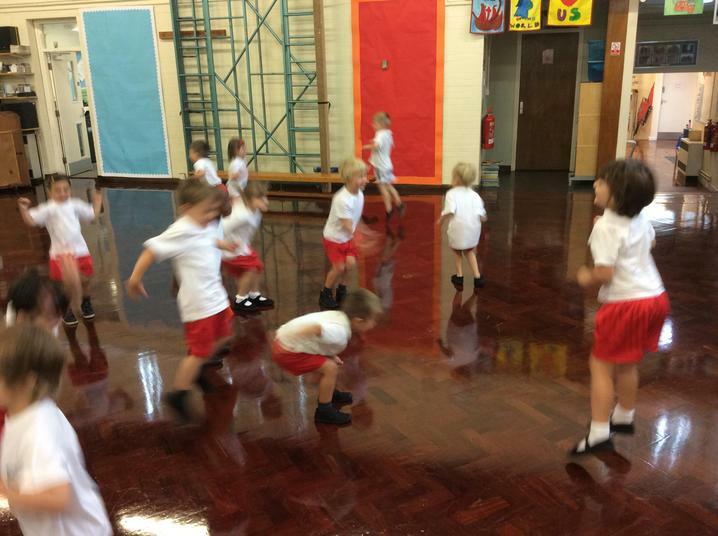 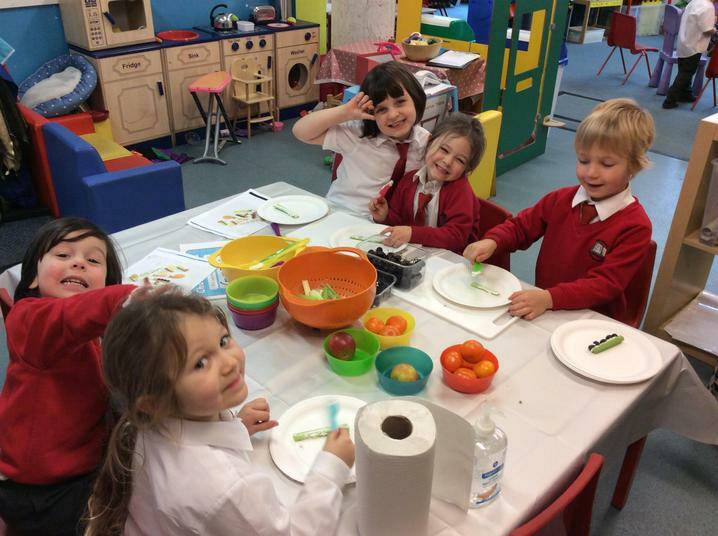 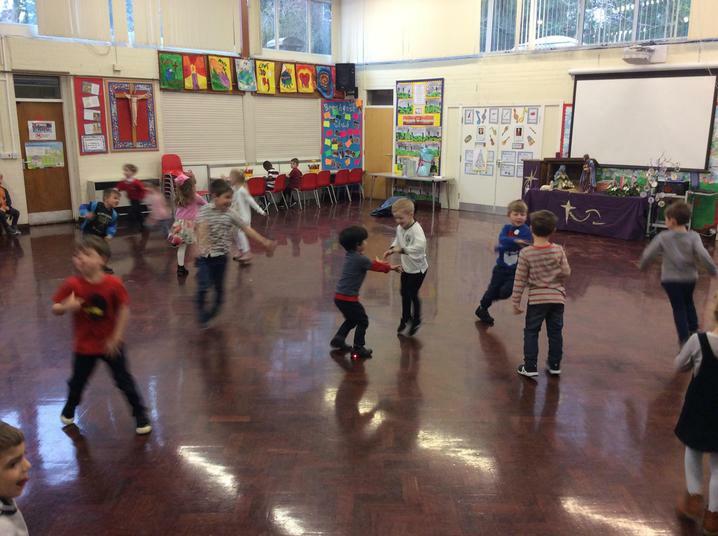 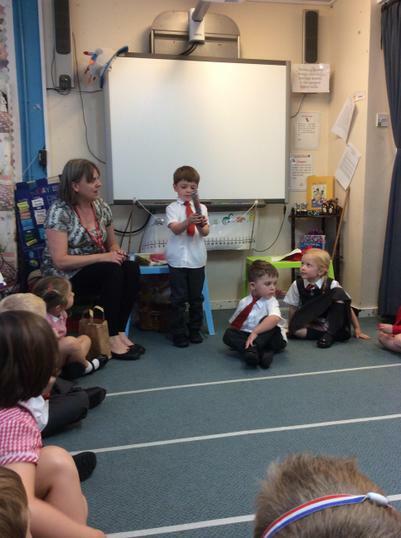 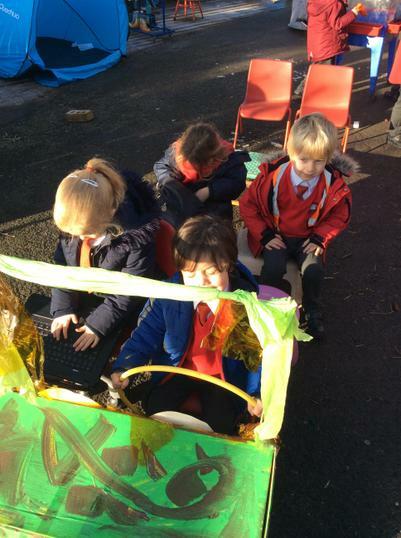 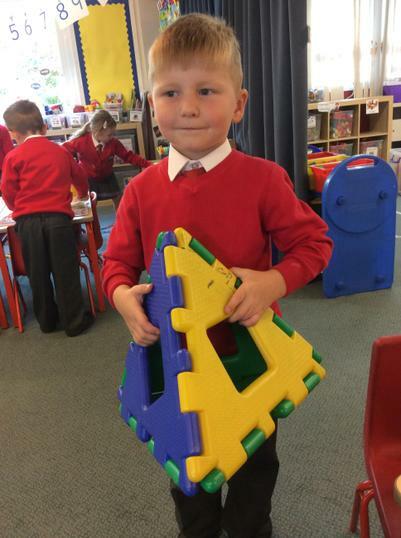 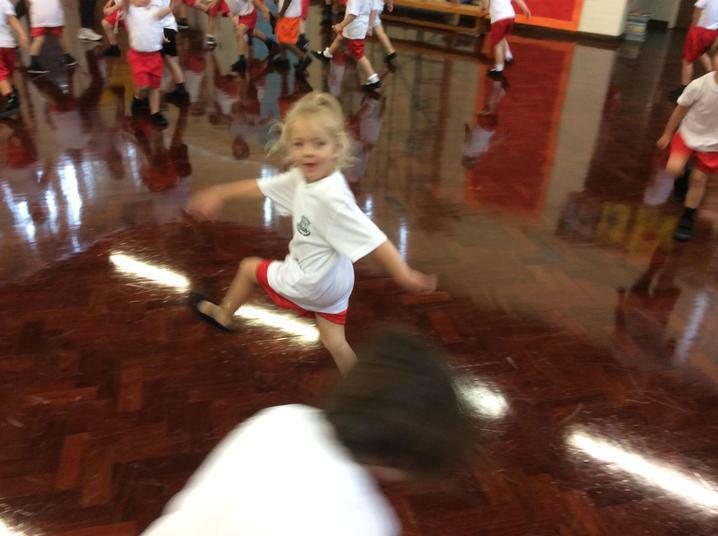 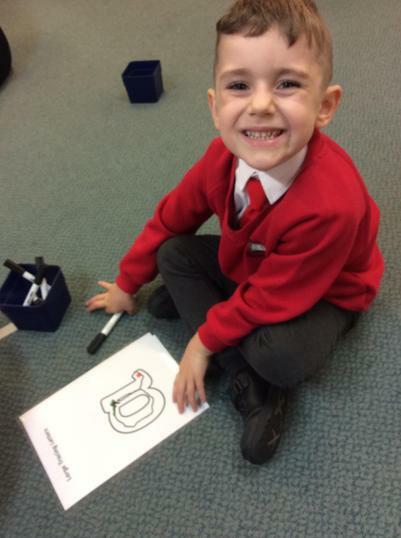 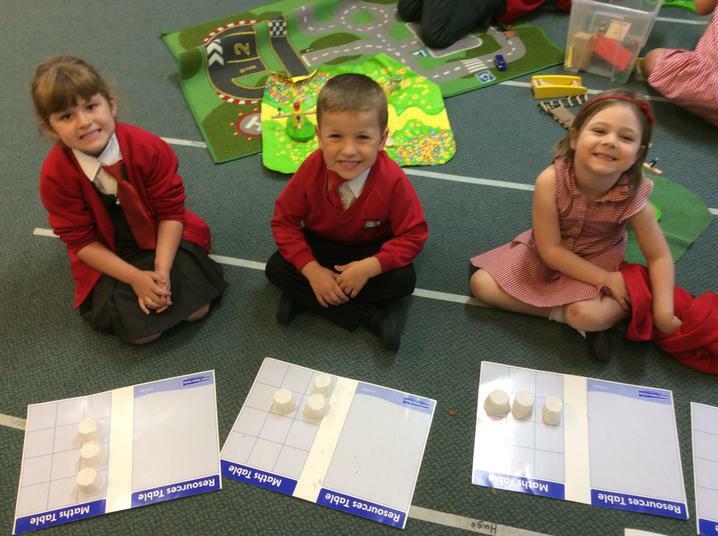 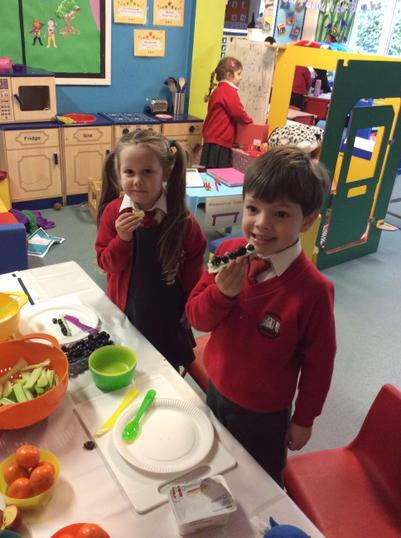 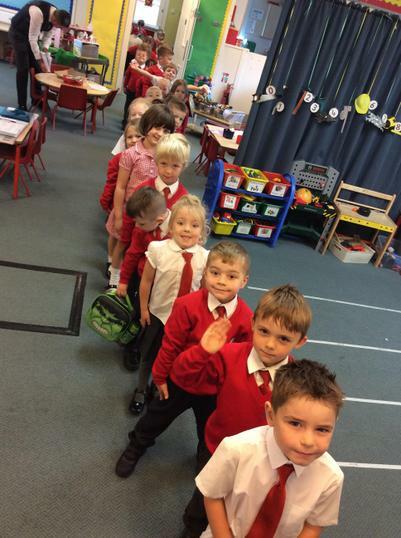 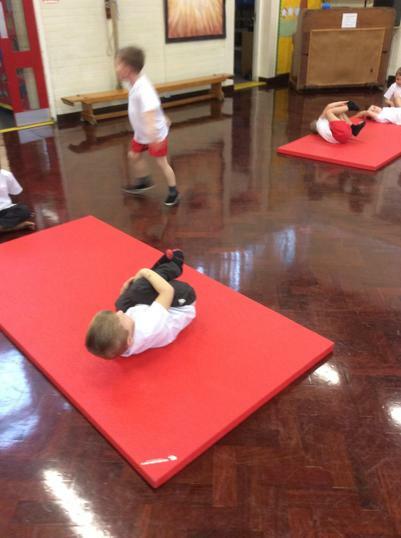 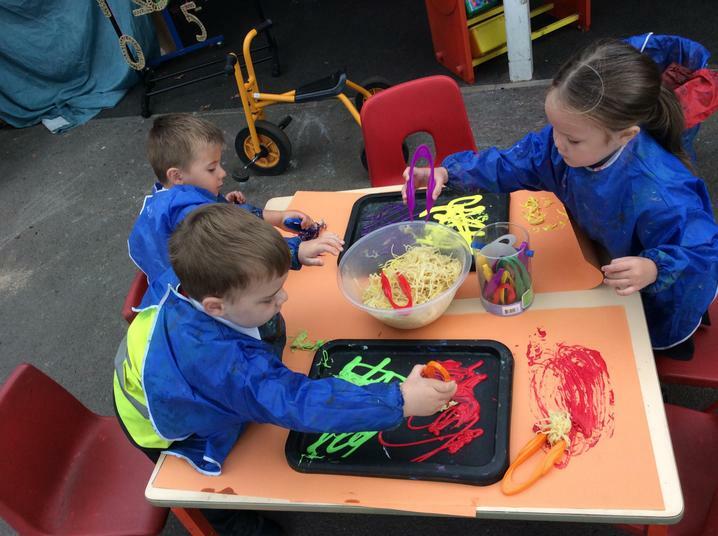 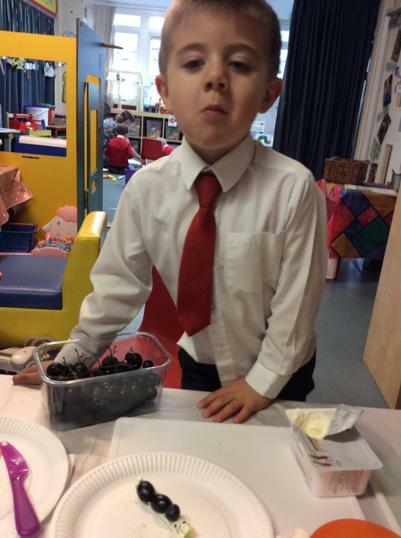 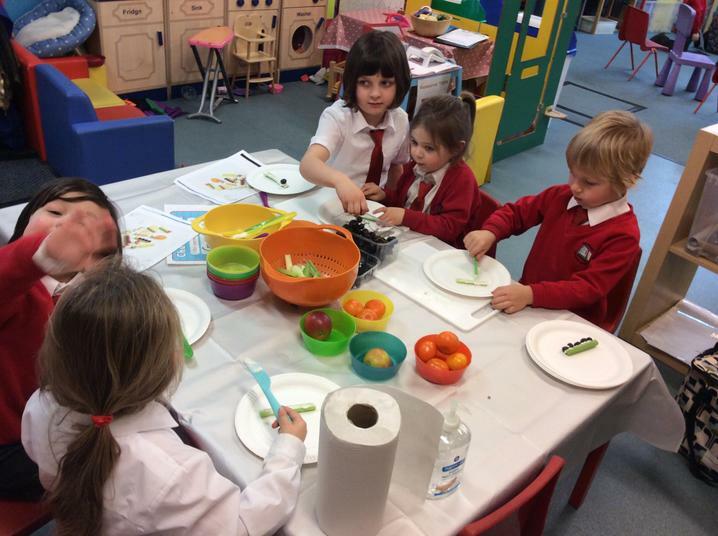 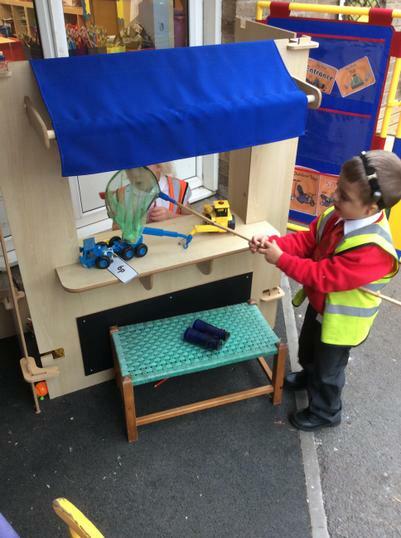 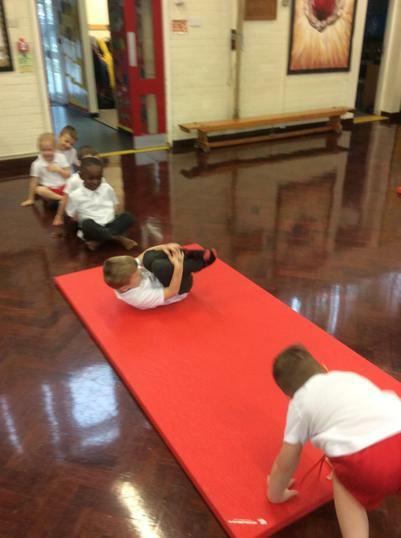 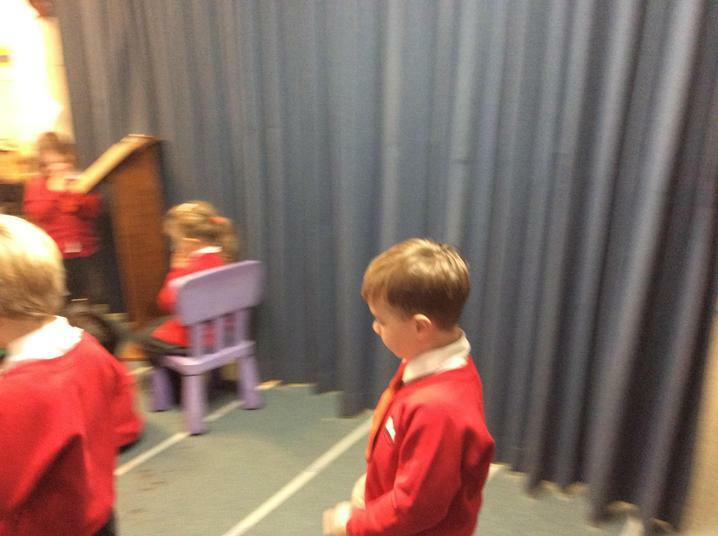 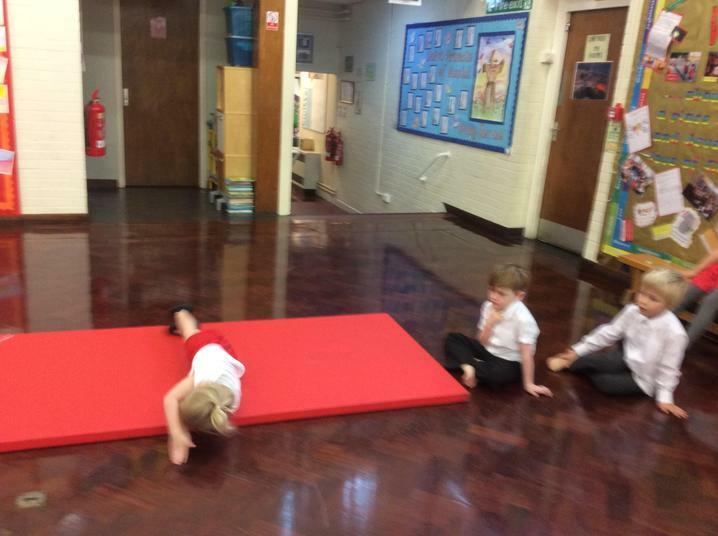 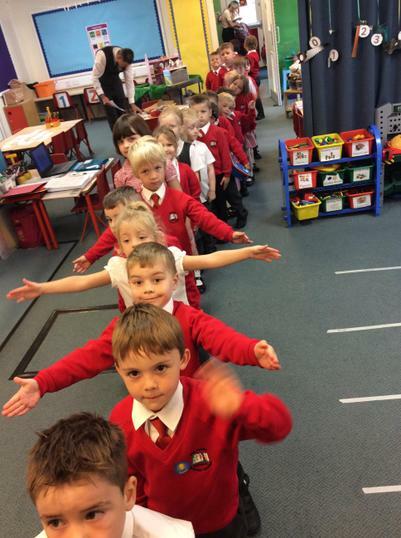 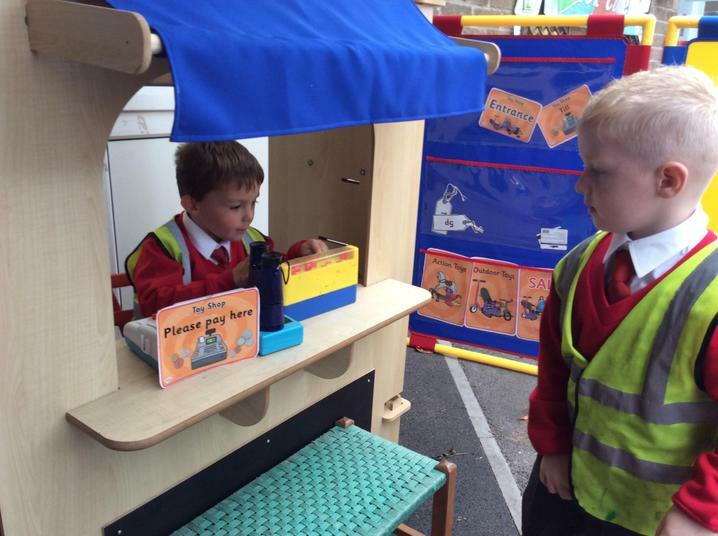 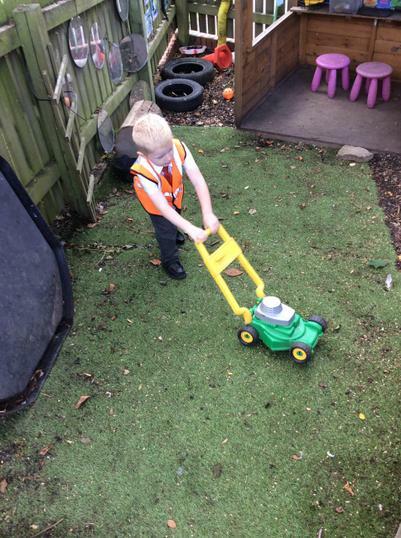 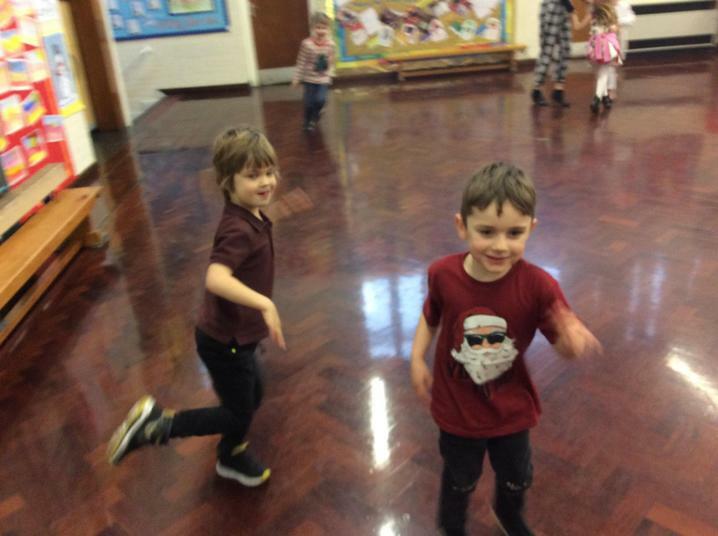 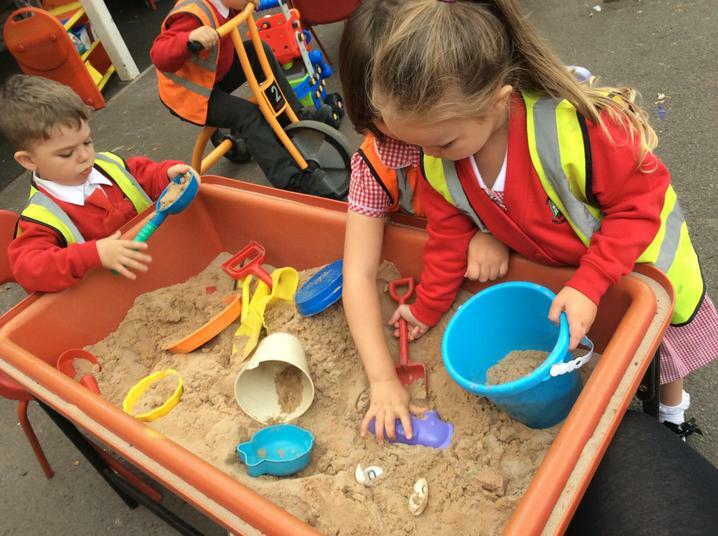 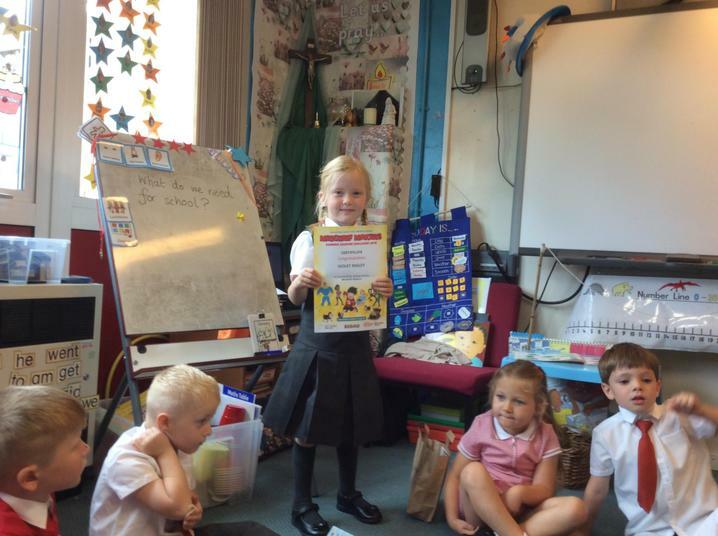 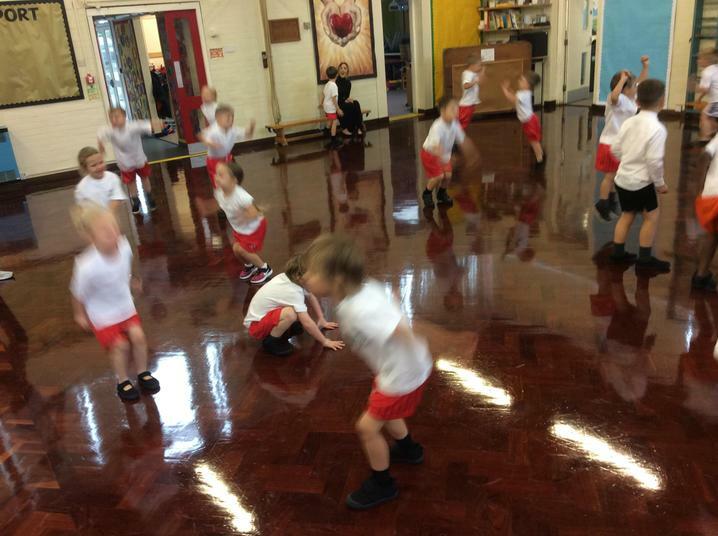 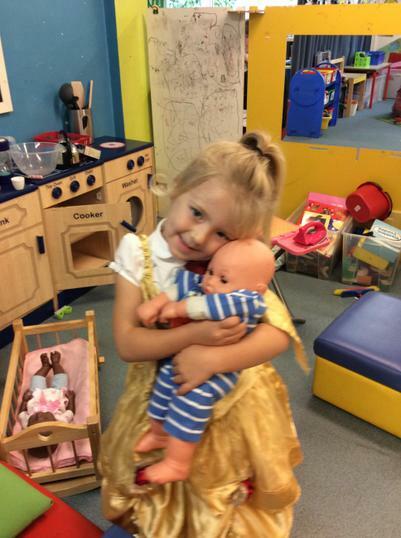 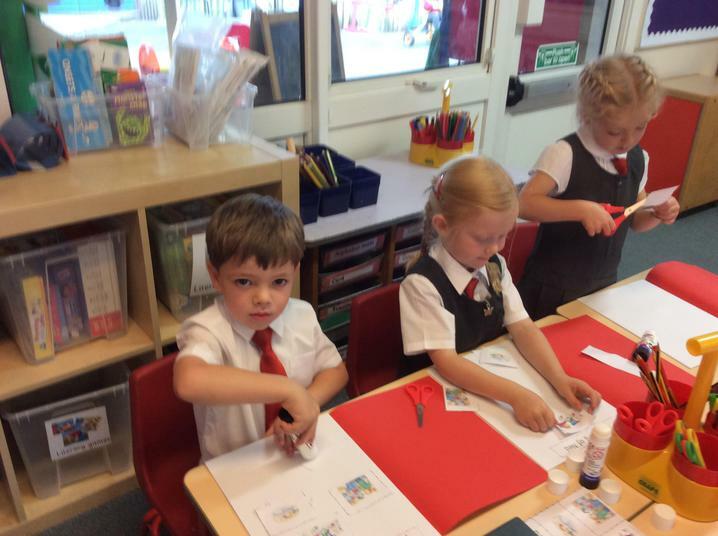 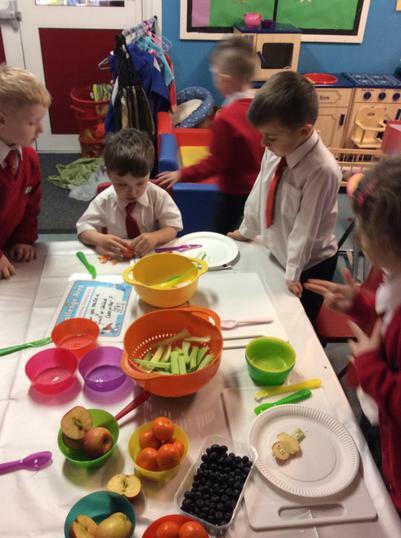 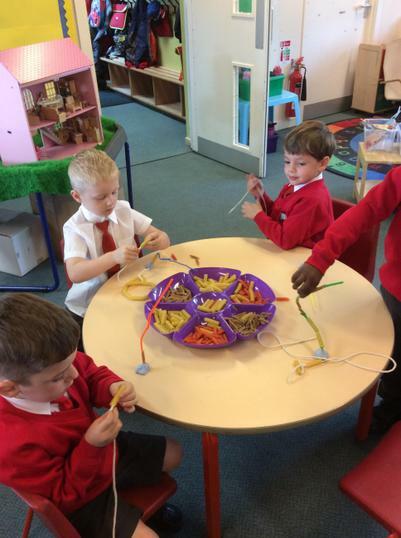 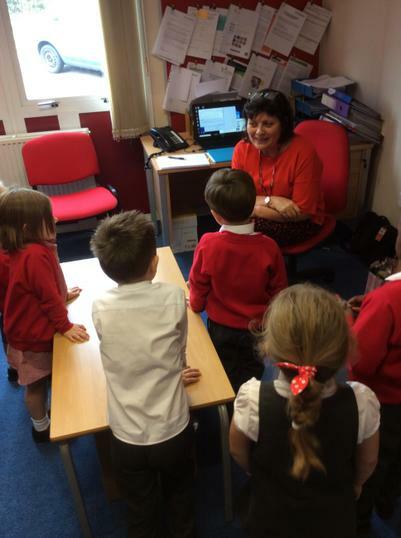 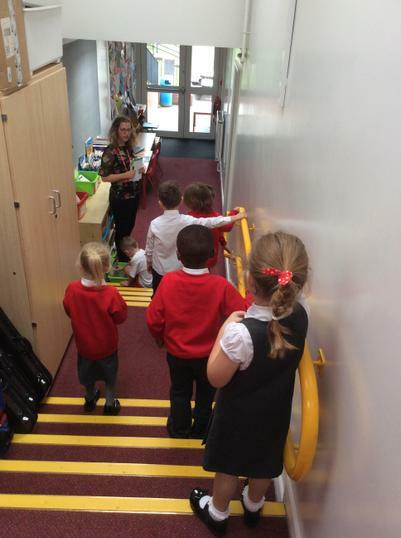 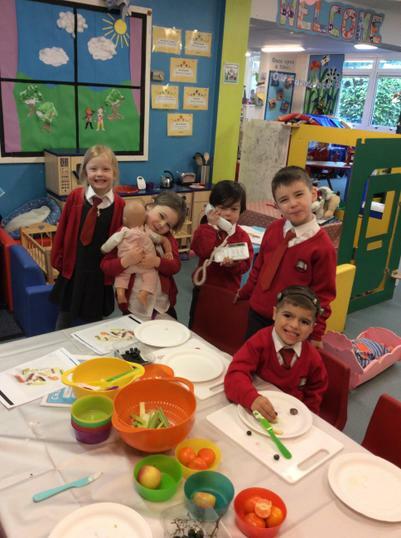 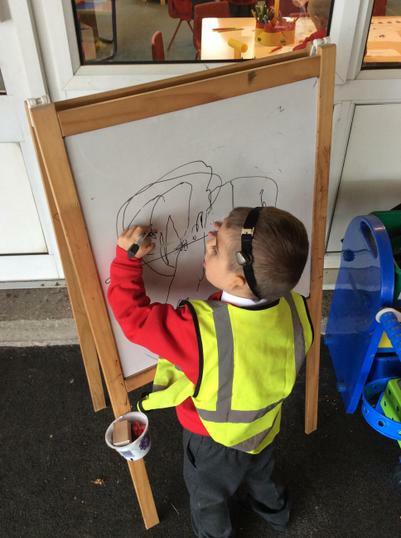 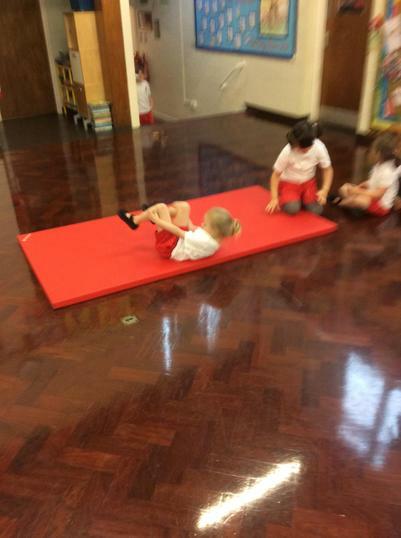 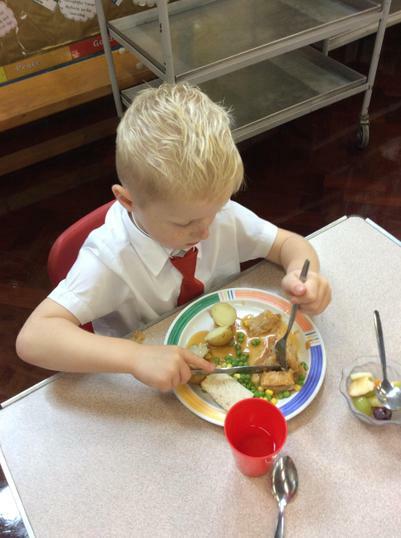 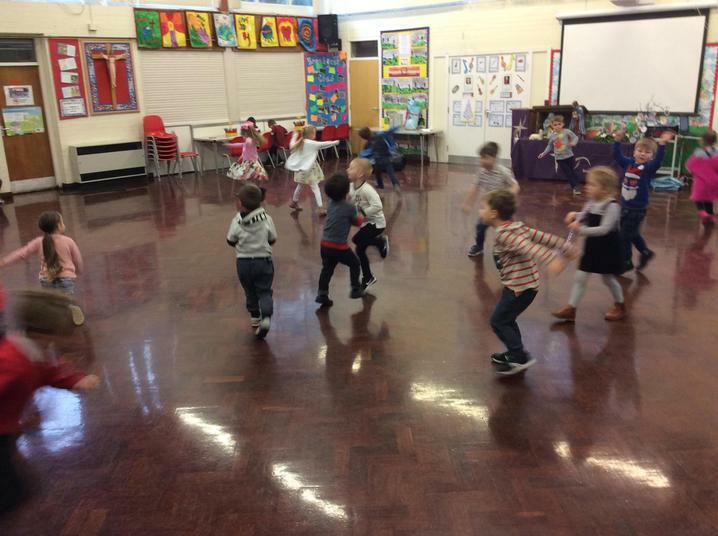 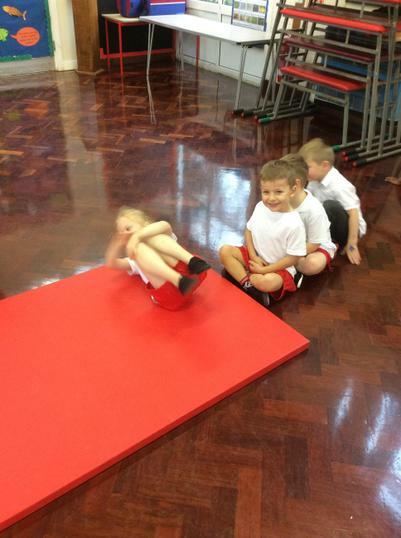 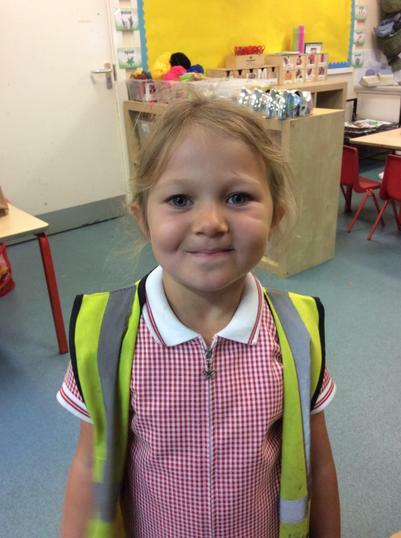 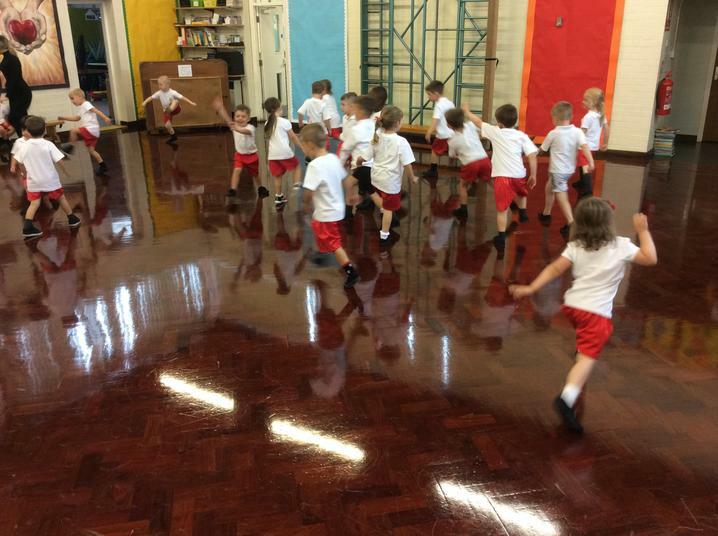 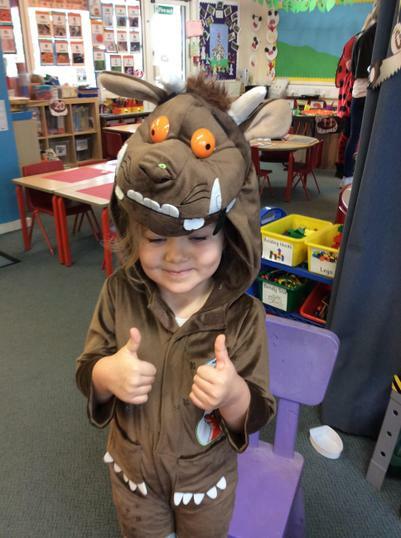 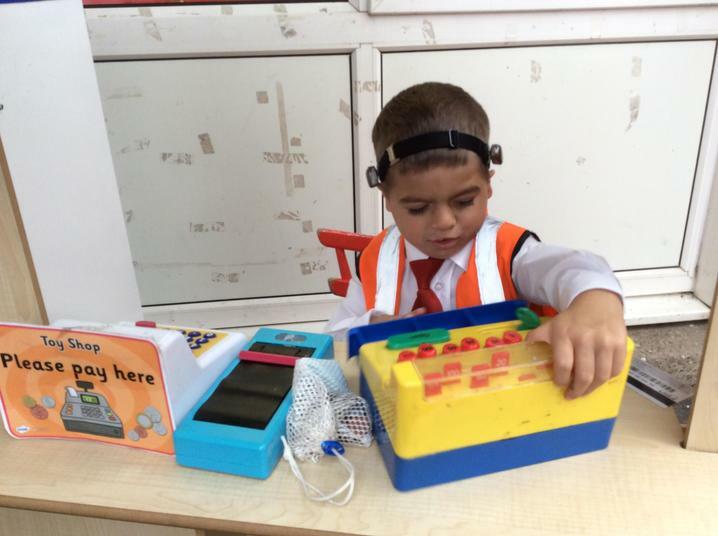 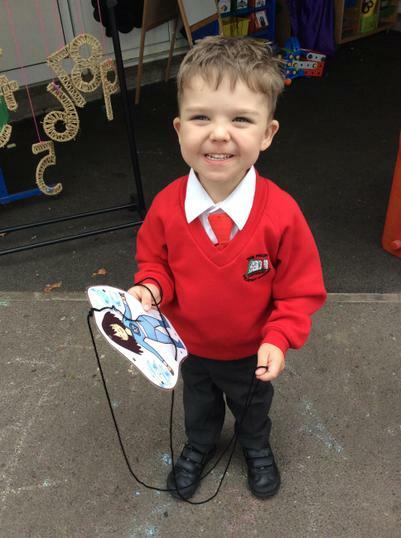 What a busy first full week in Reception - well done everyone!